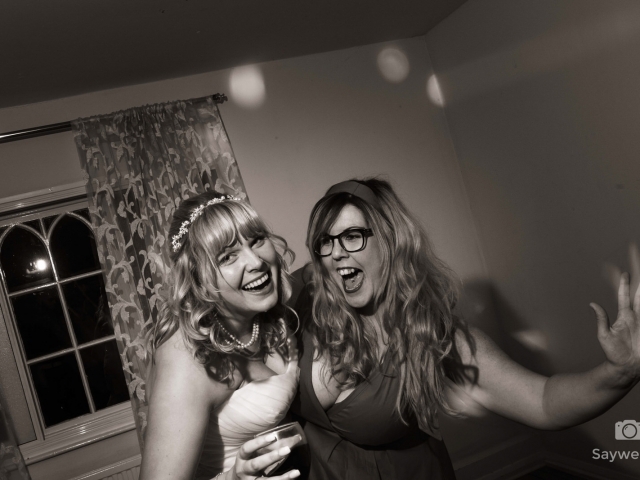 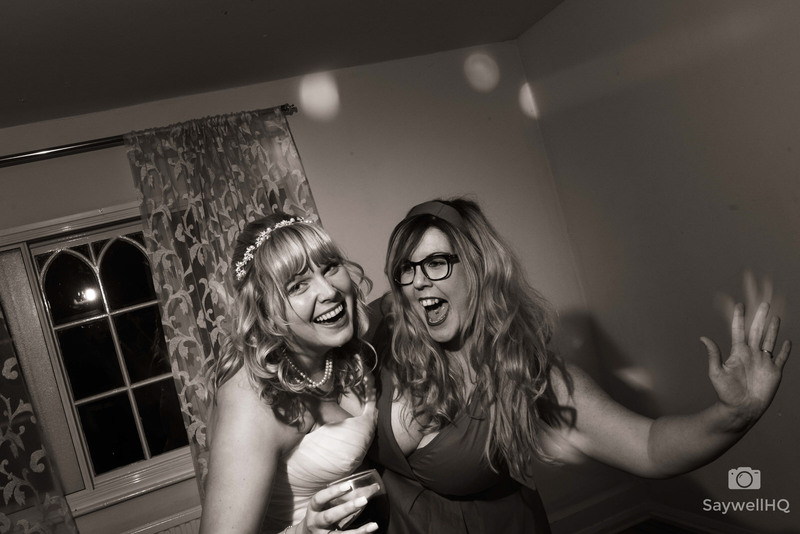 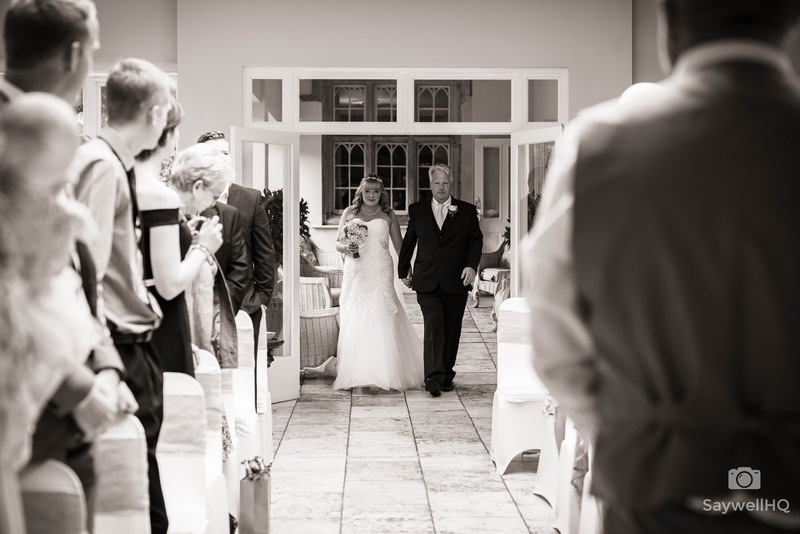 The day started for me capturing the guest arrivals in the main bar. 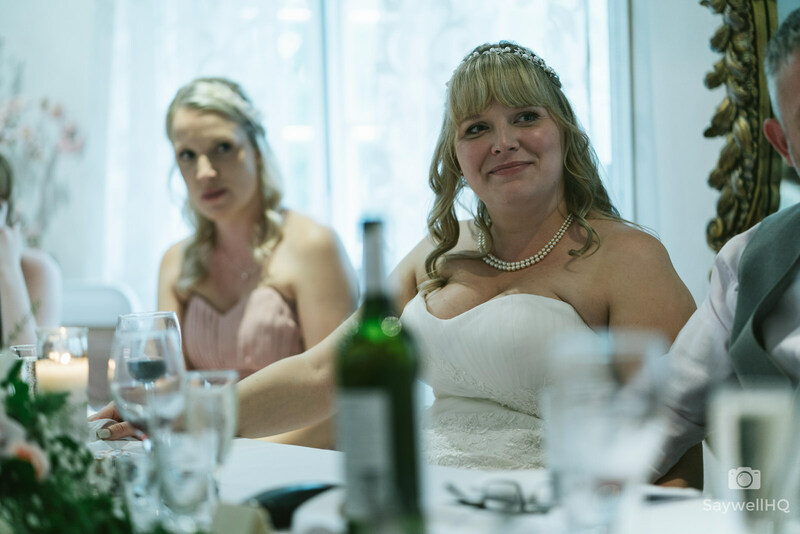 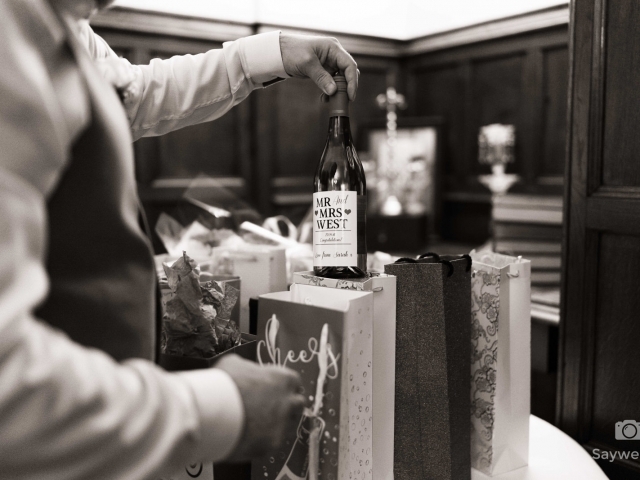 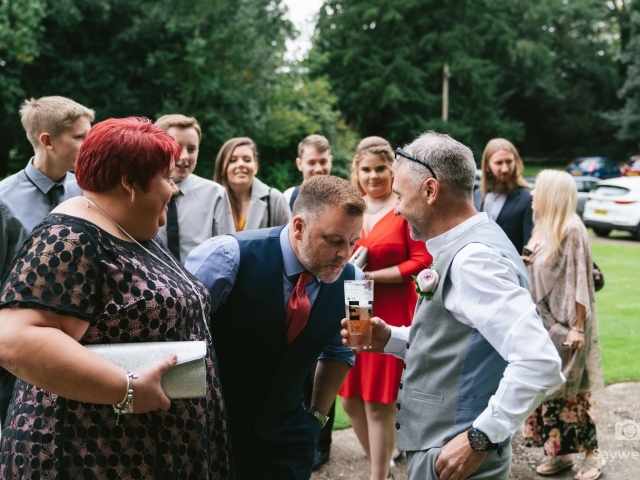 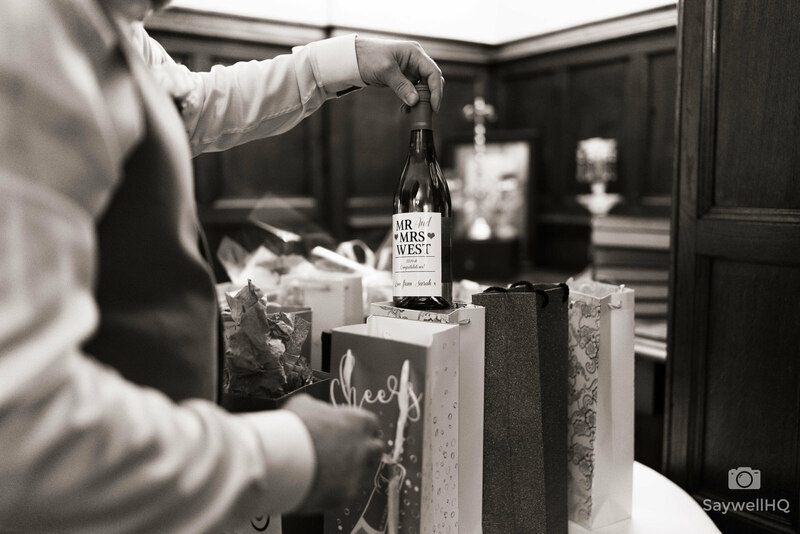 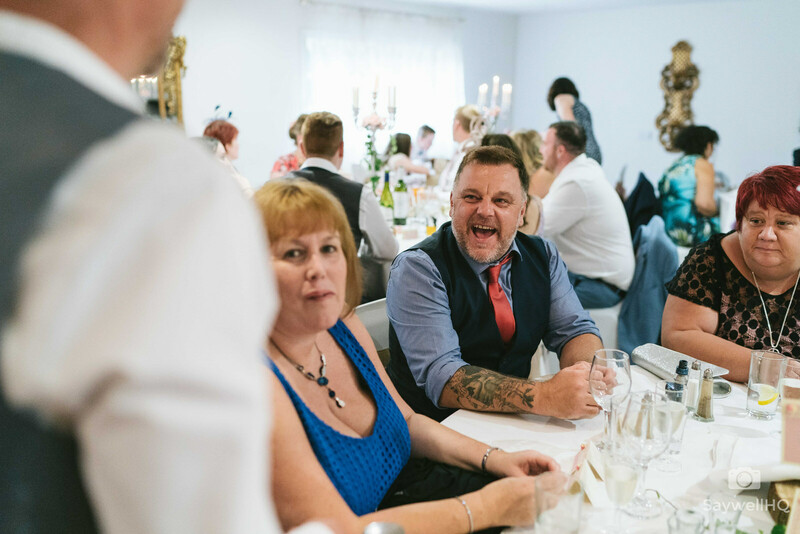 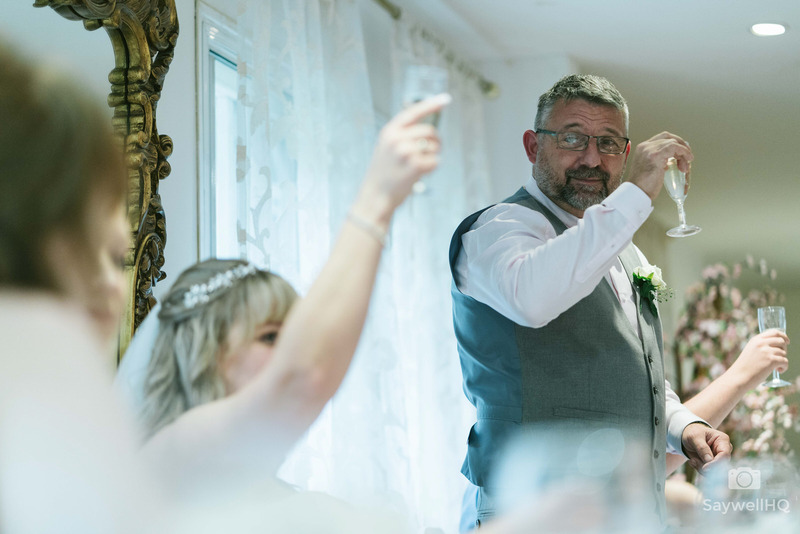 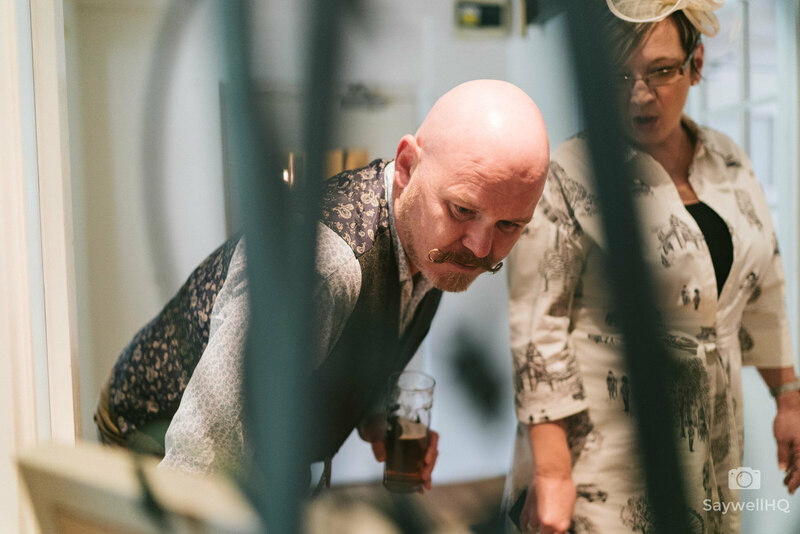 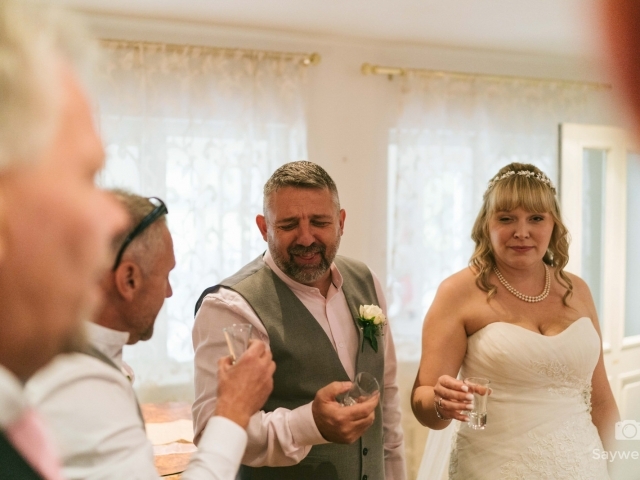 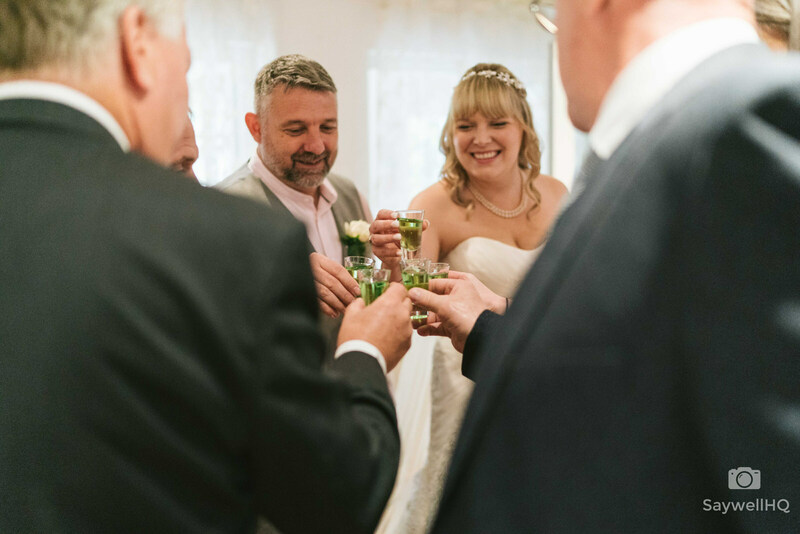 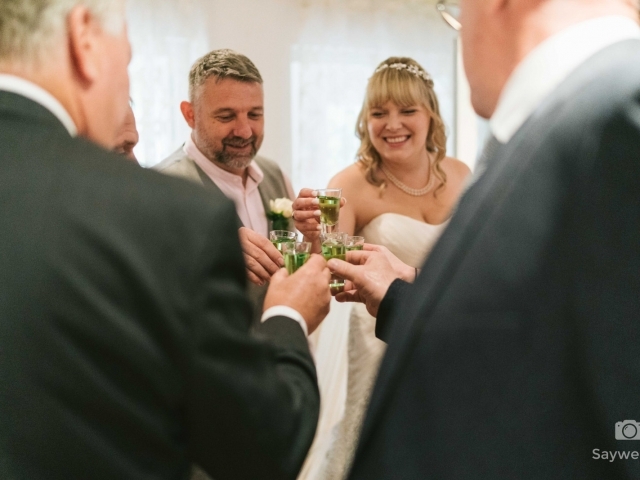 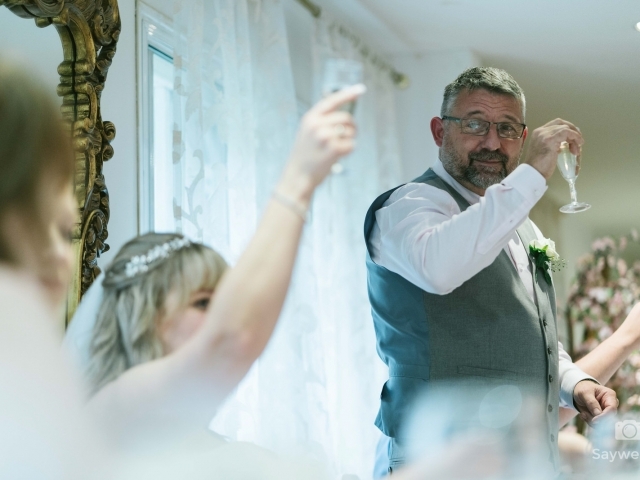 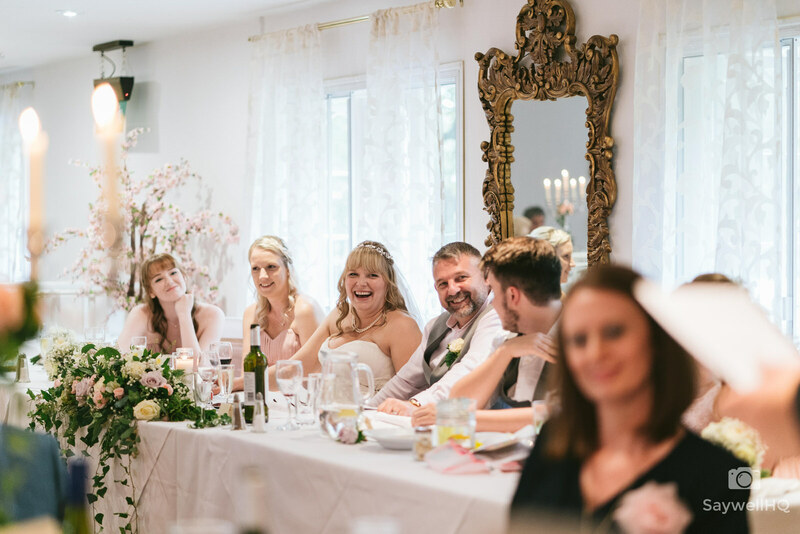 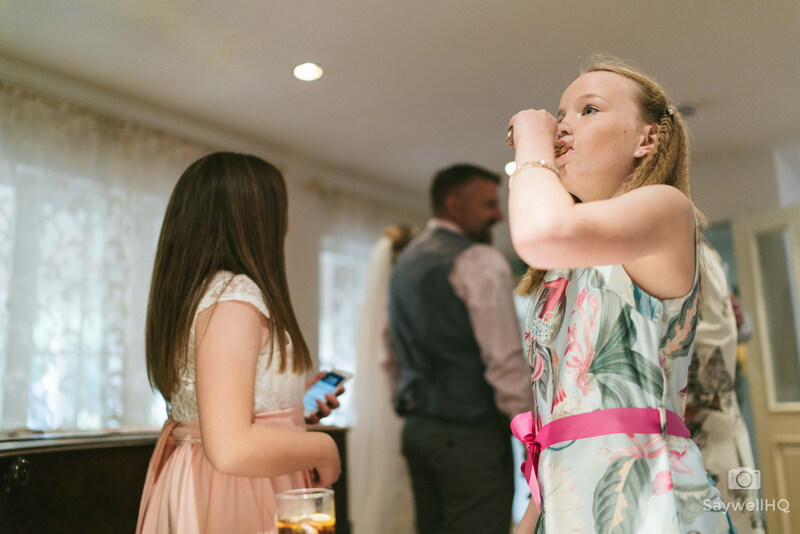 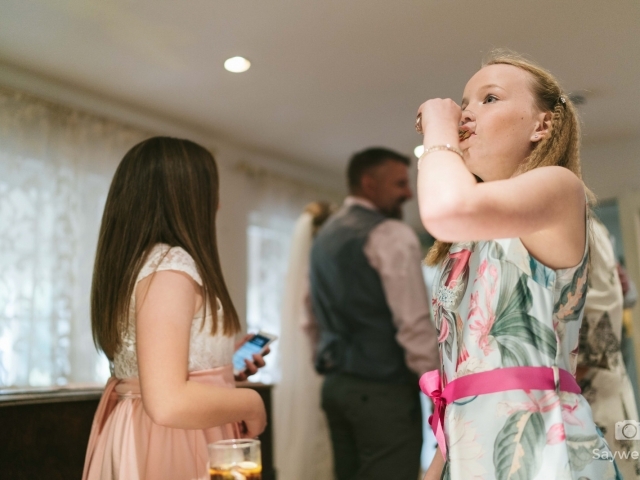 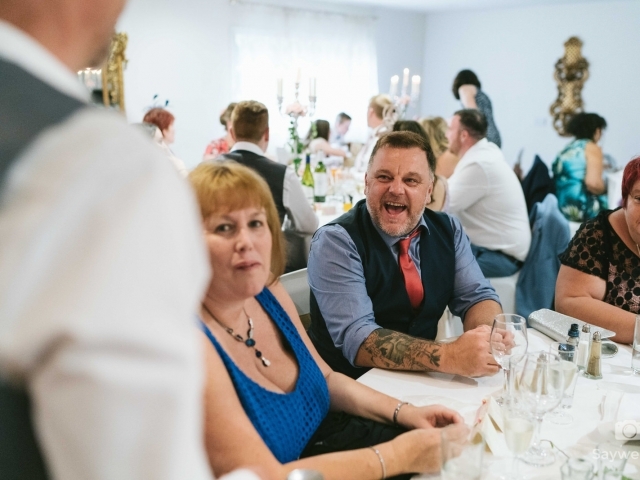 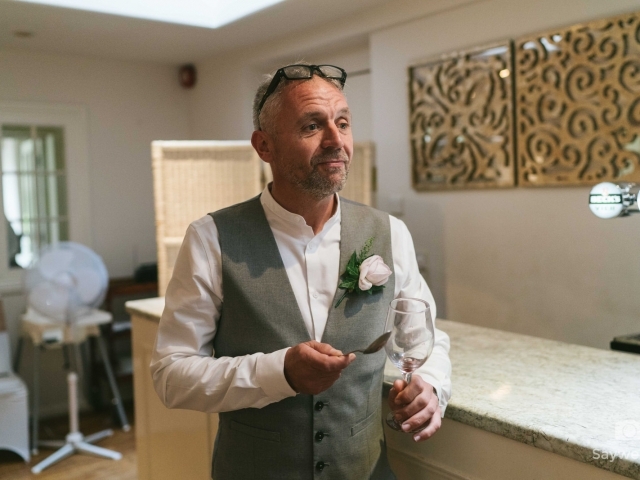 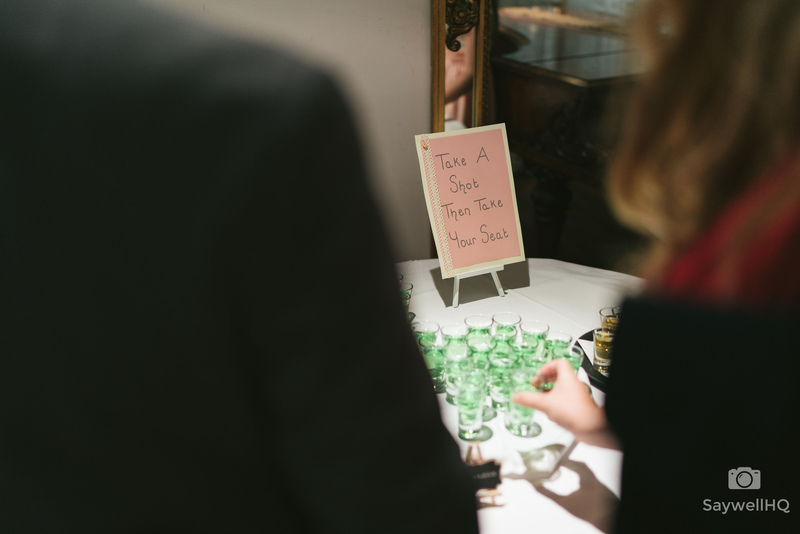 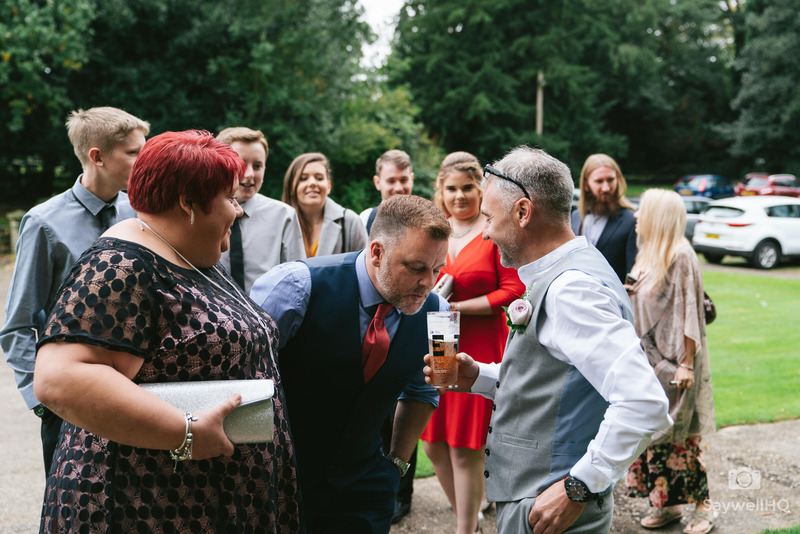 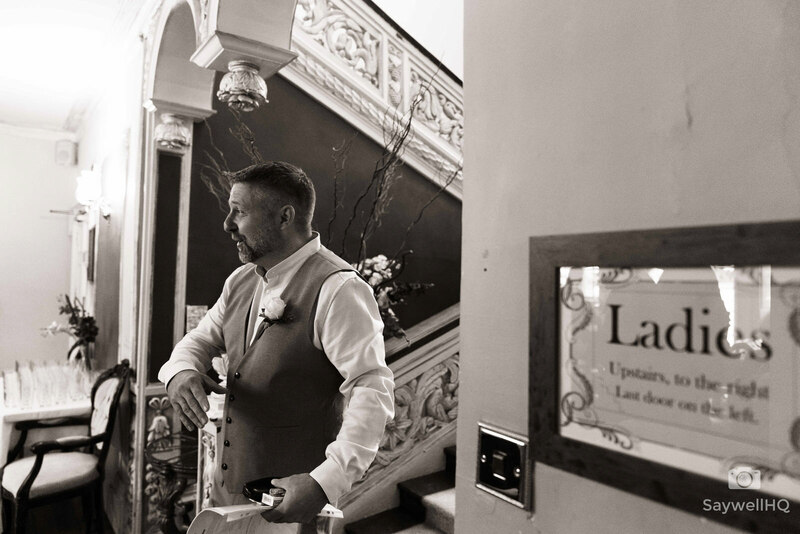 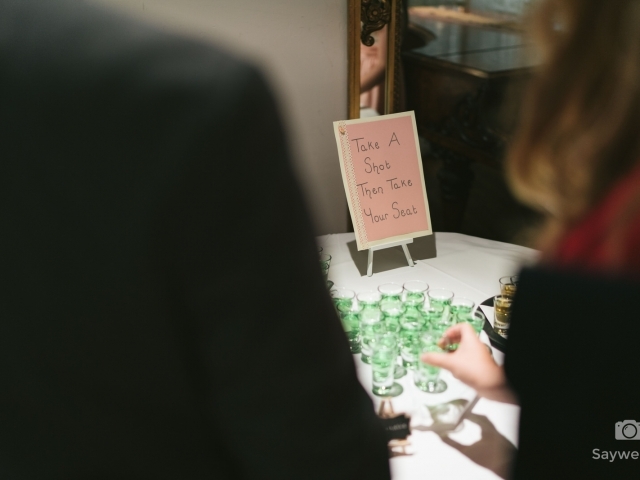 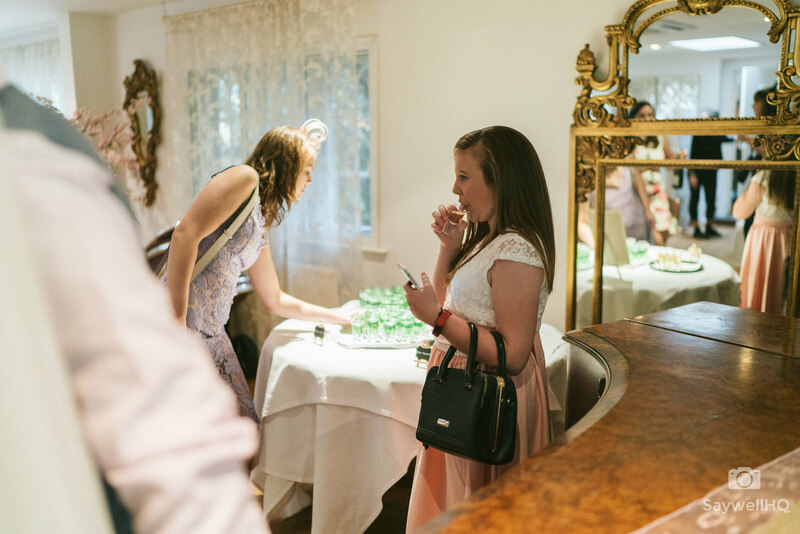 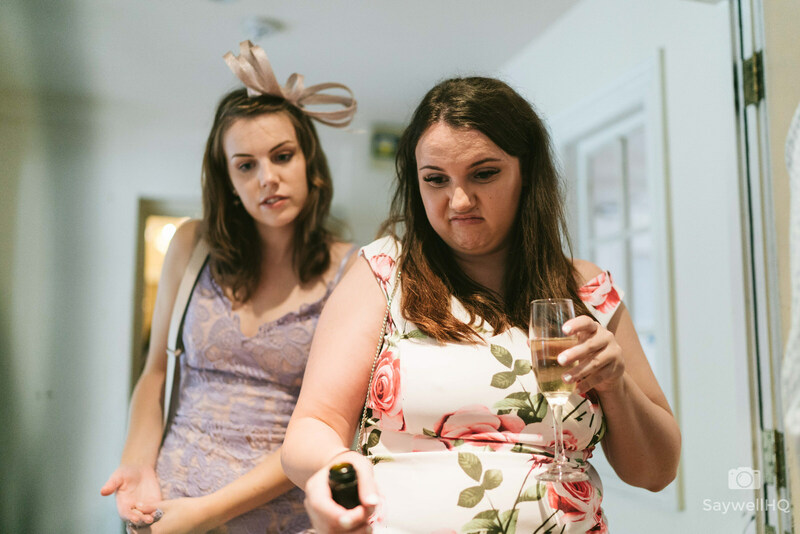 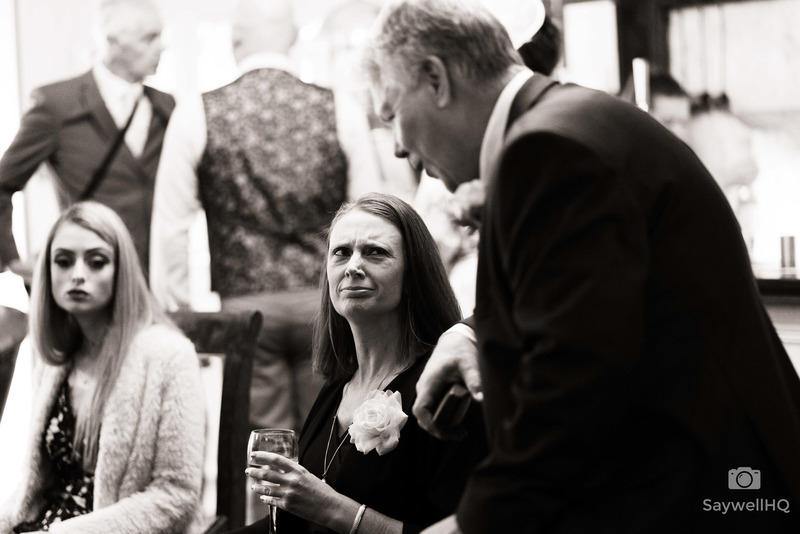 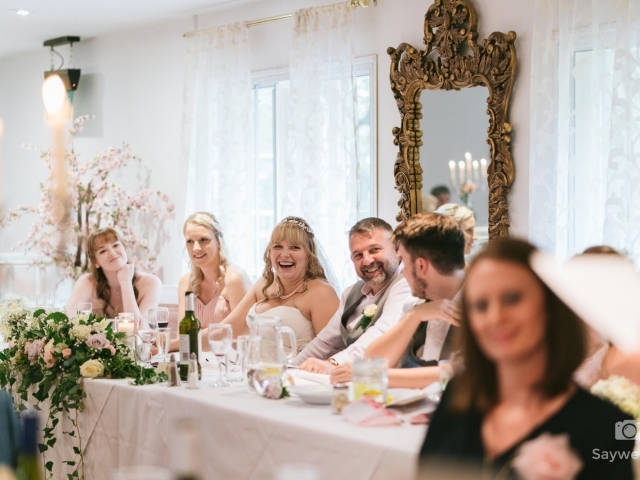 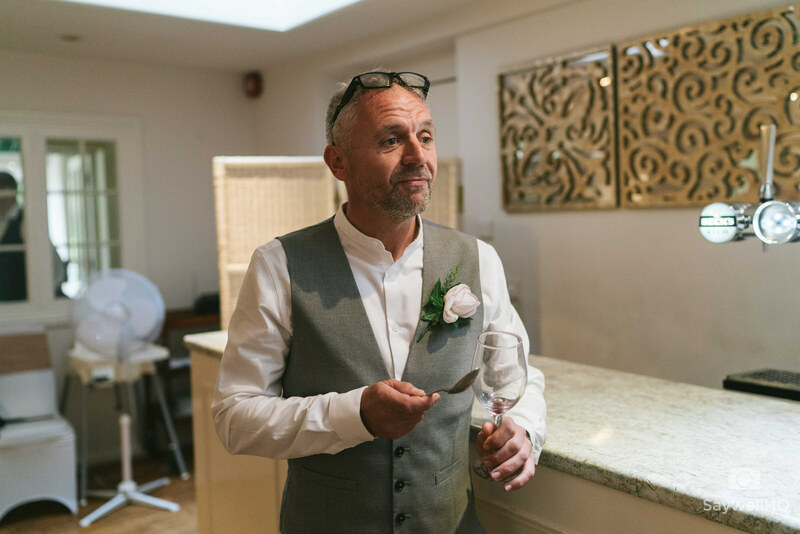 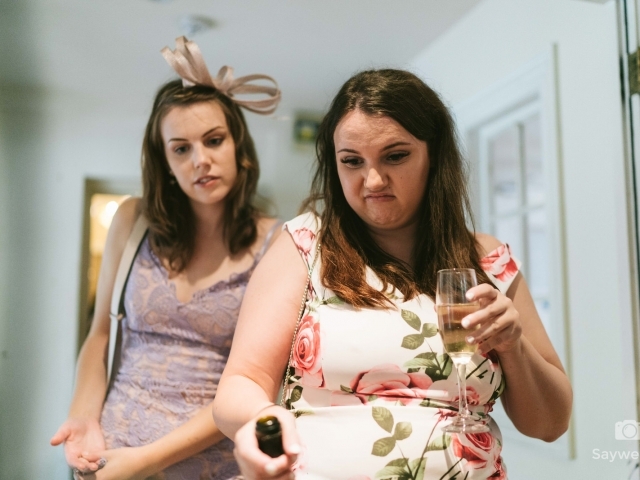 Plenty of people had travelled long distances to be at the wedding of Michelle and Tony, and many were gasping for a good drink! 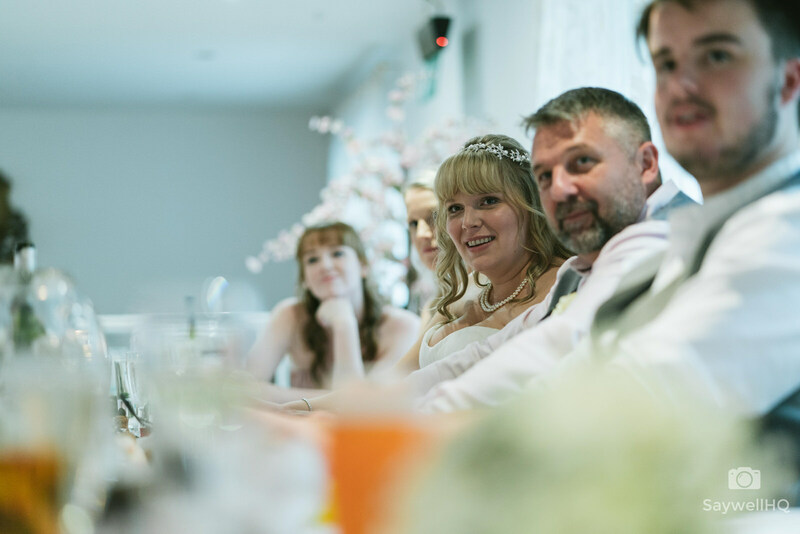 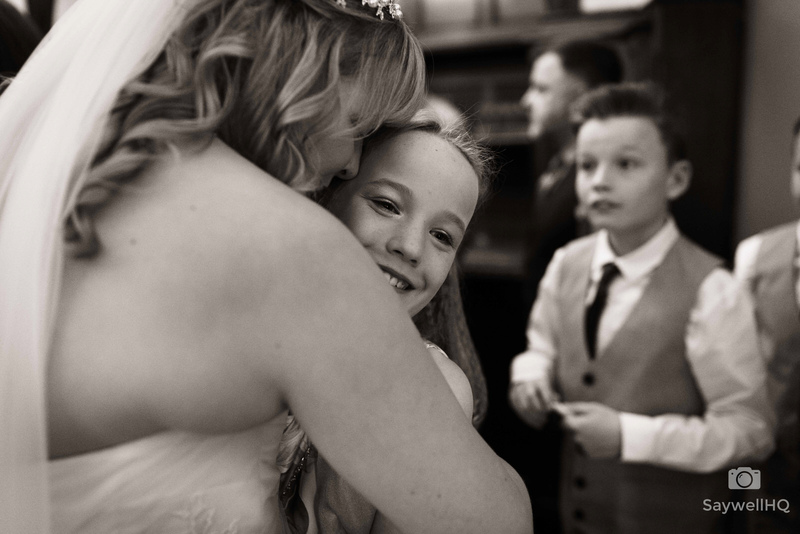 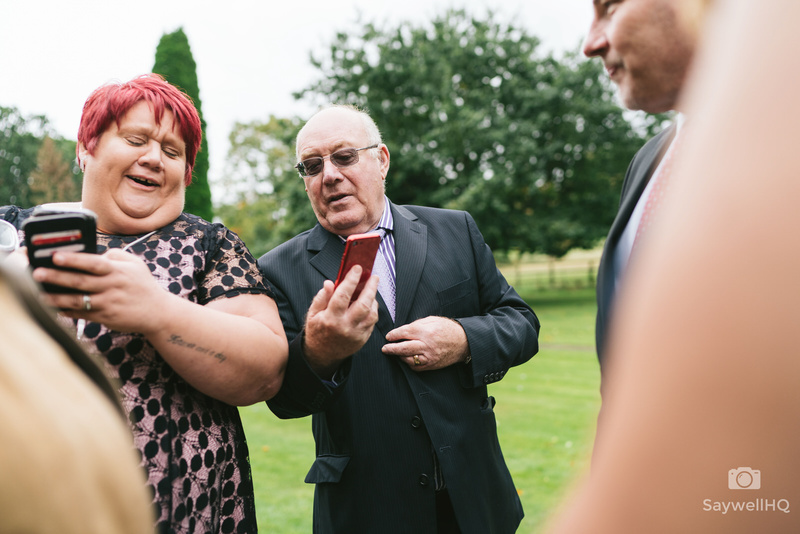 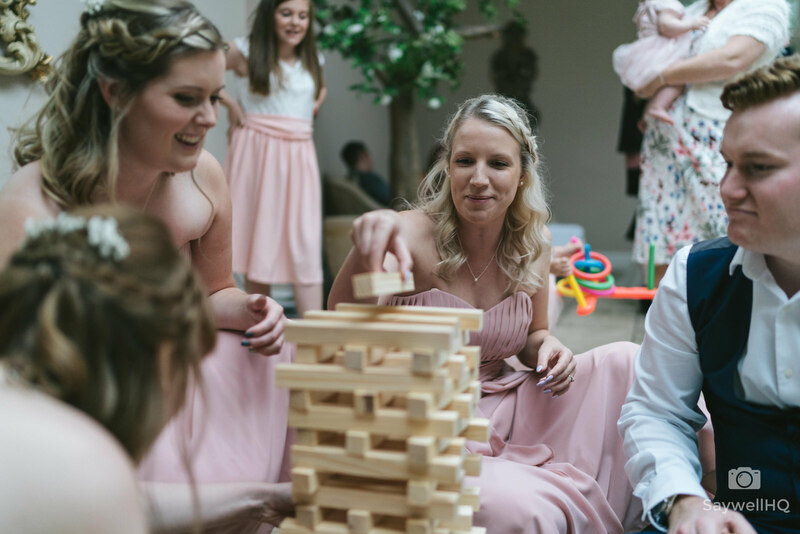 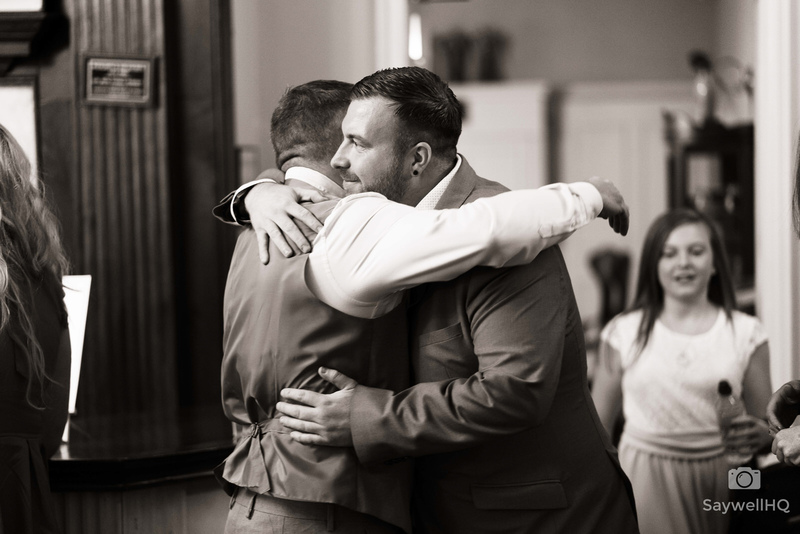 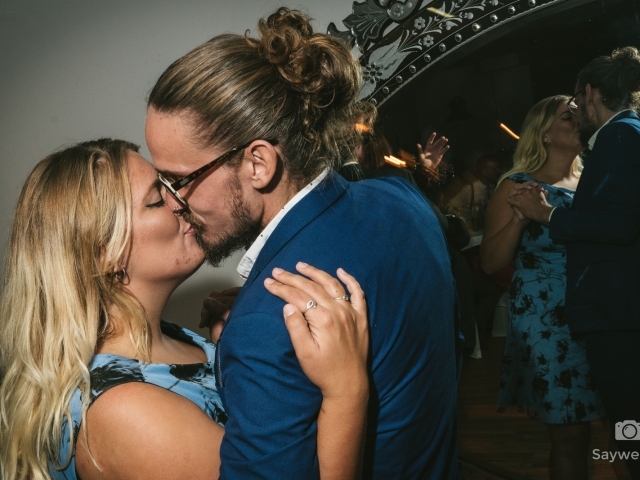 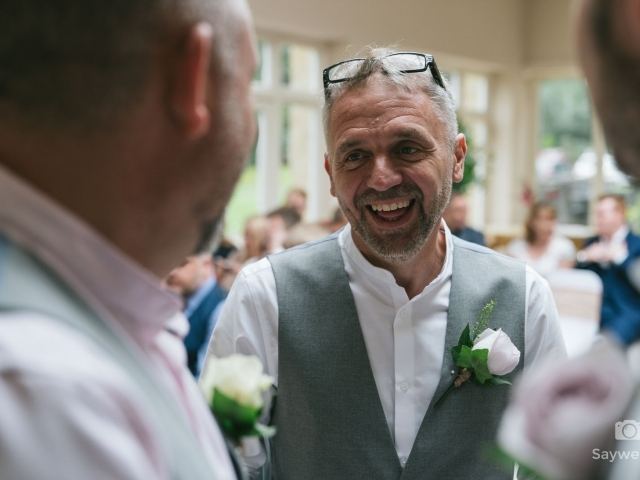 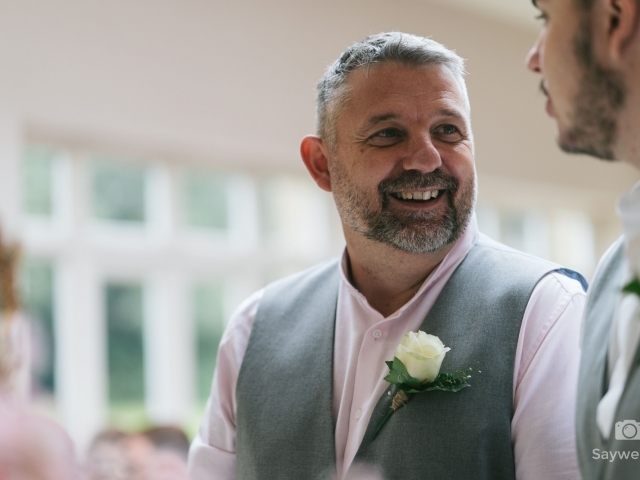 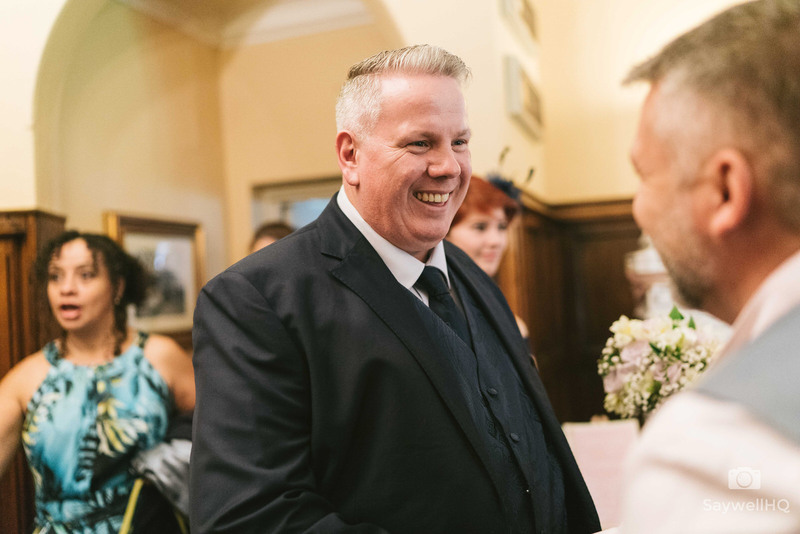 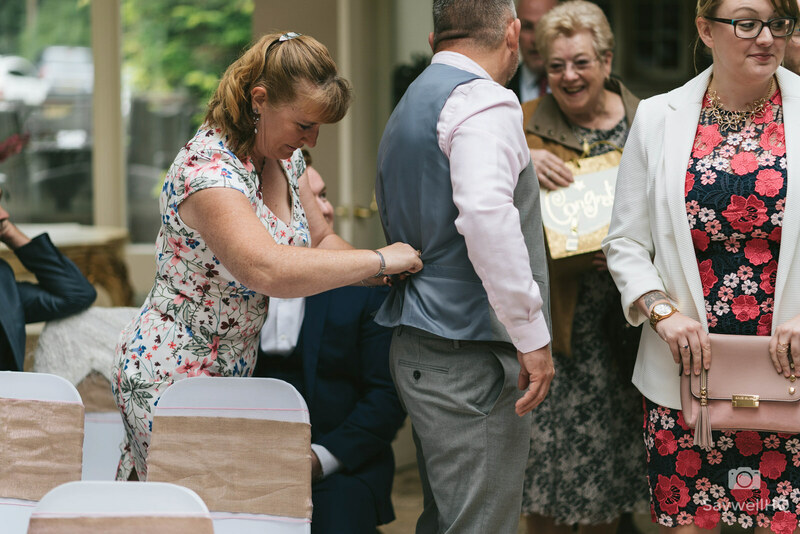 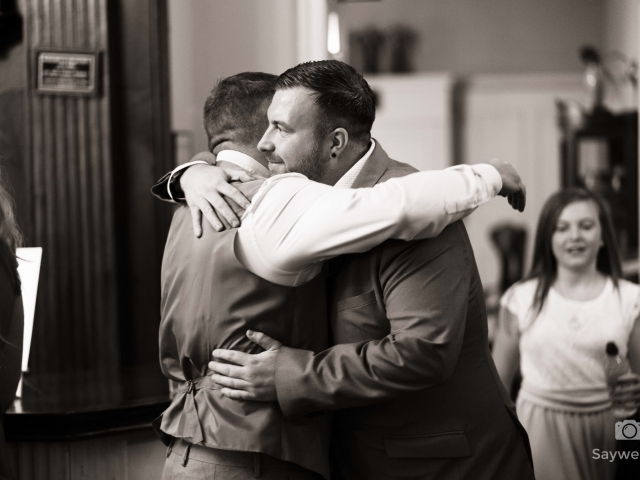 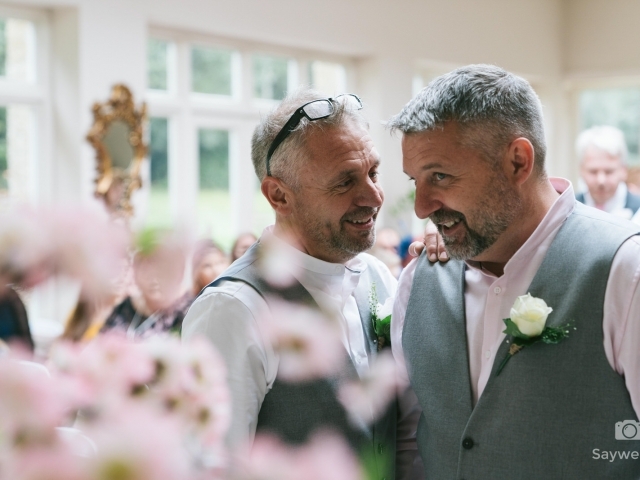 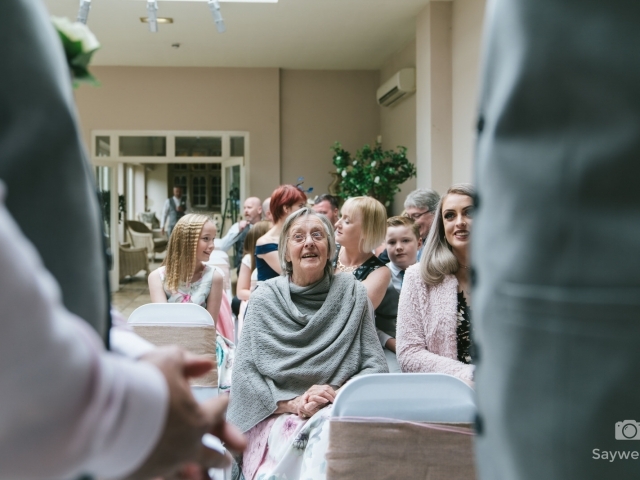 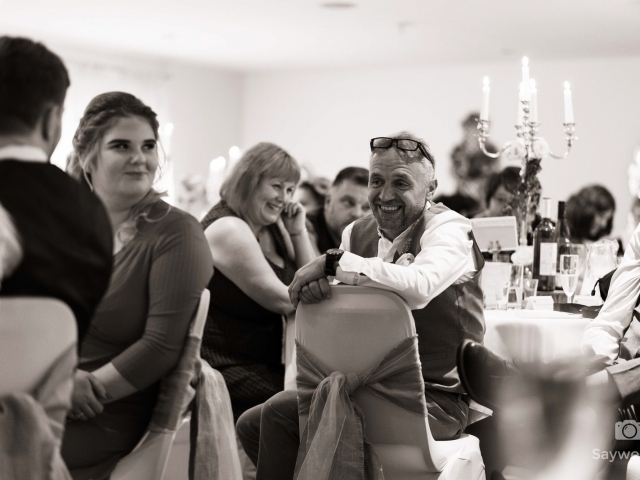 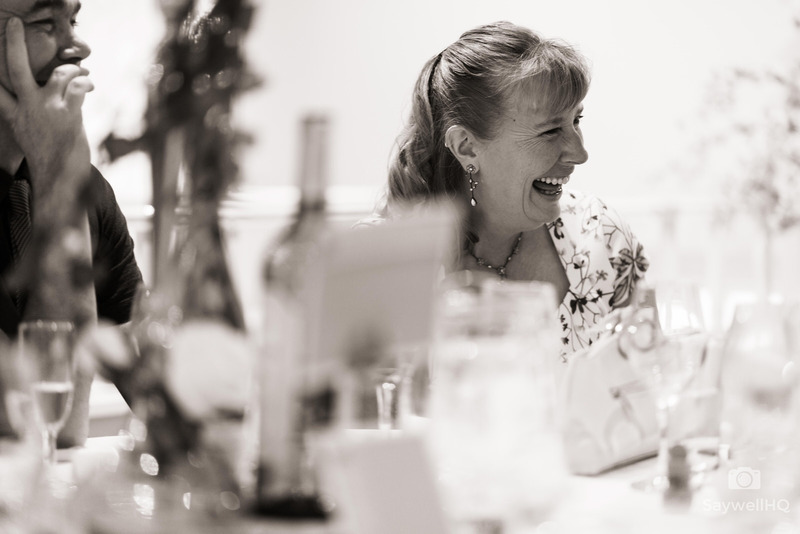 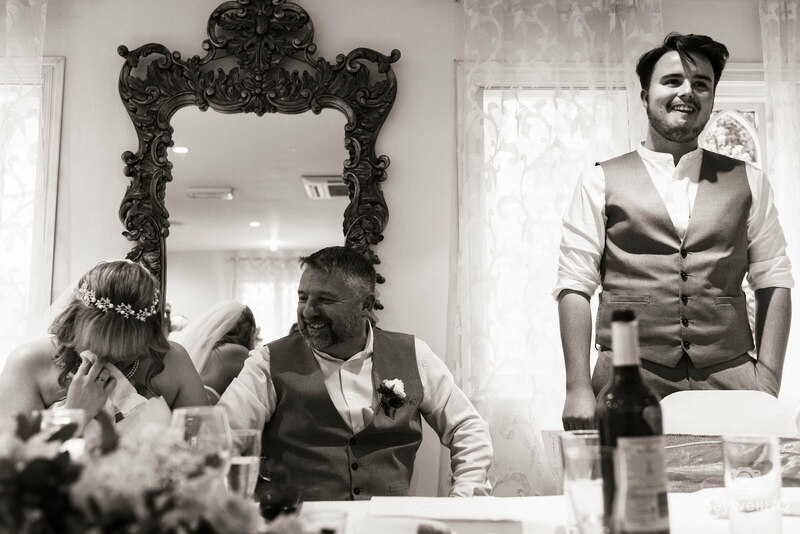 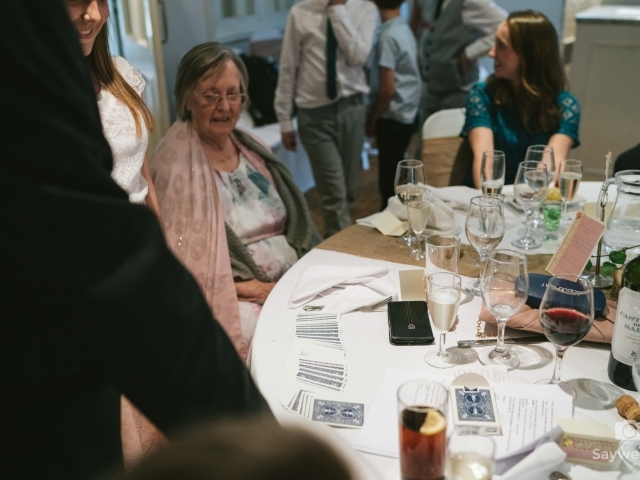 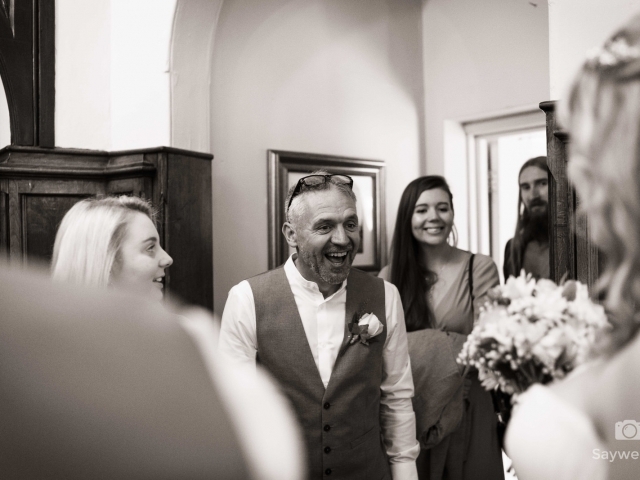 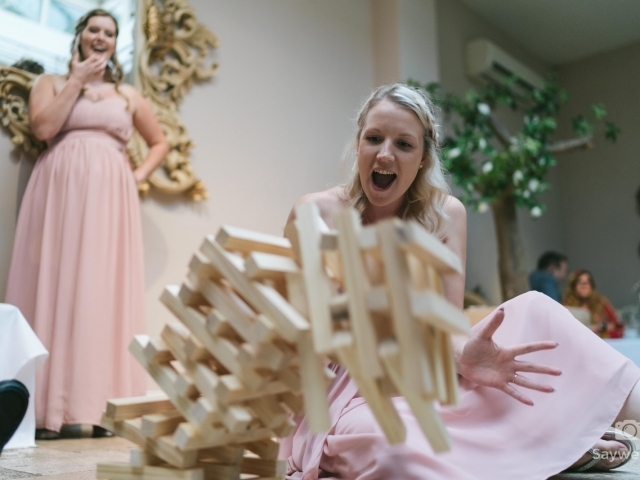 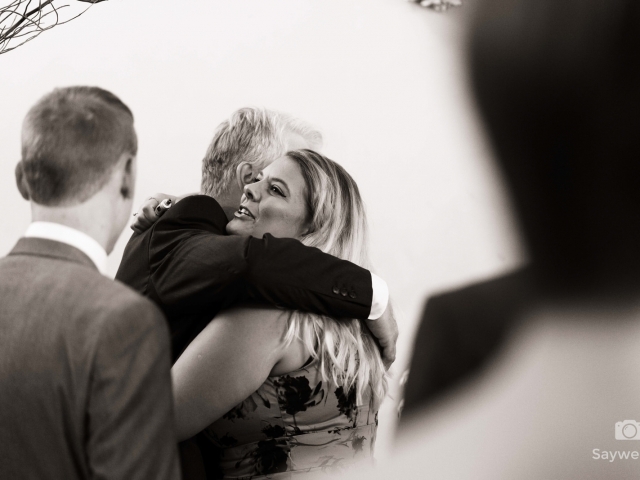 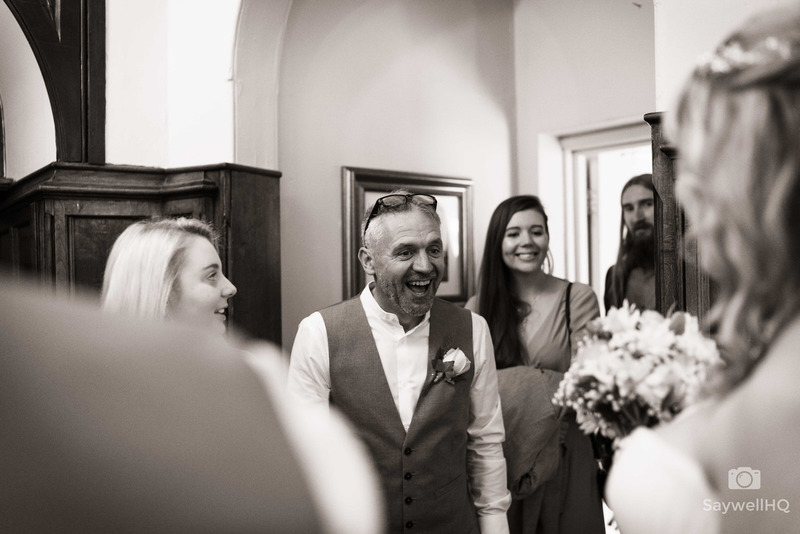 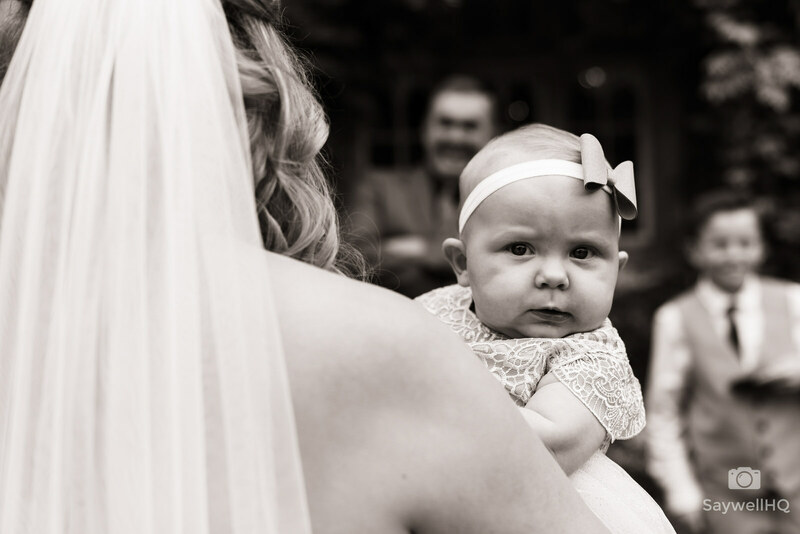 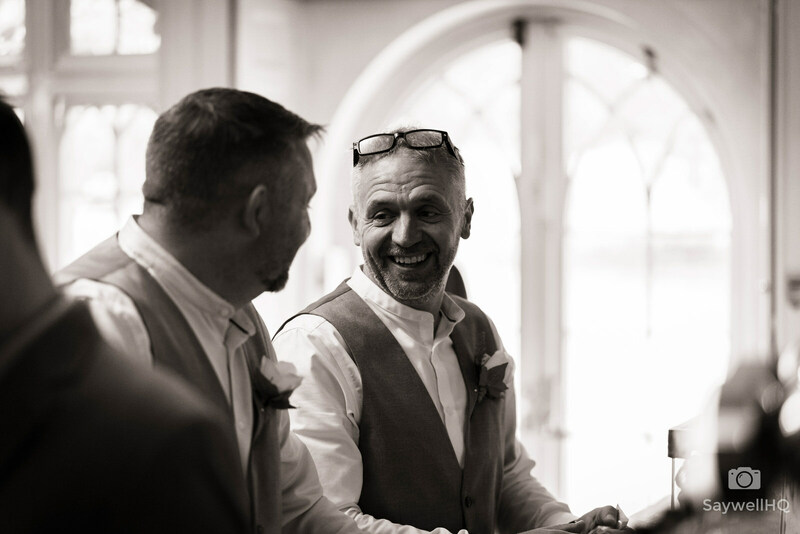 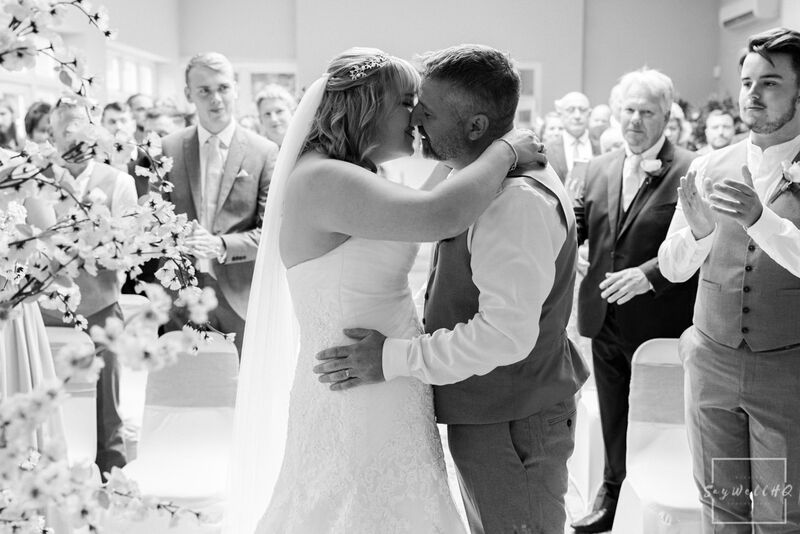 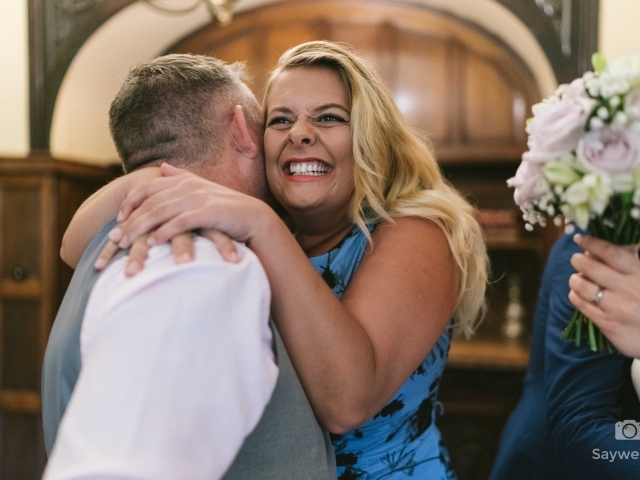 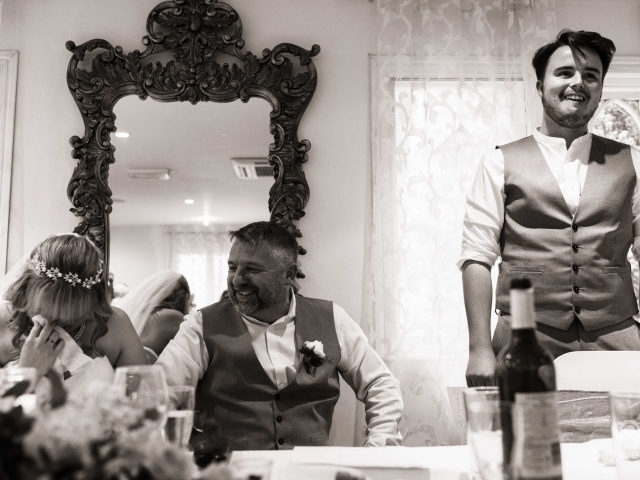 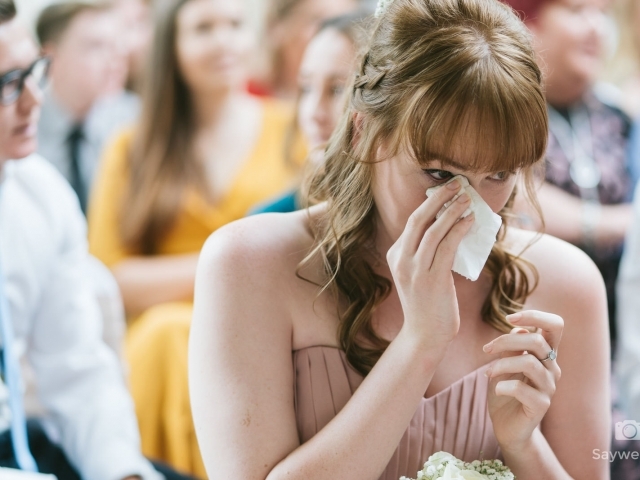 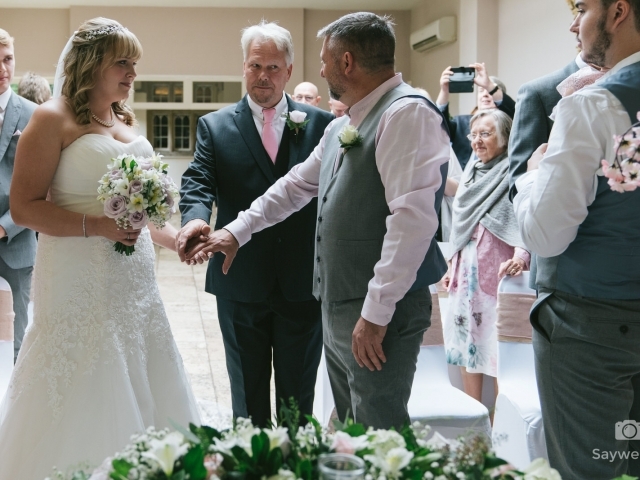 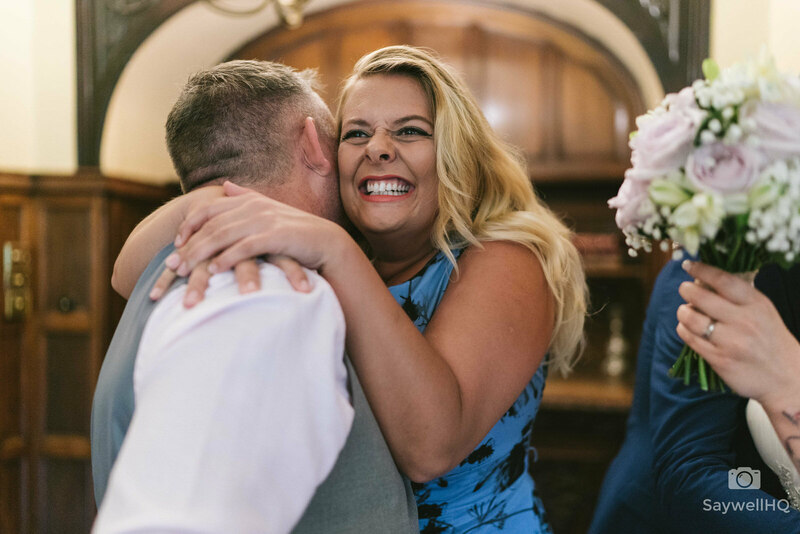 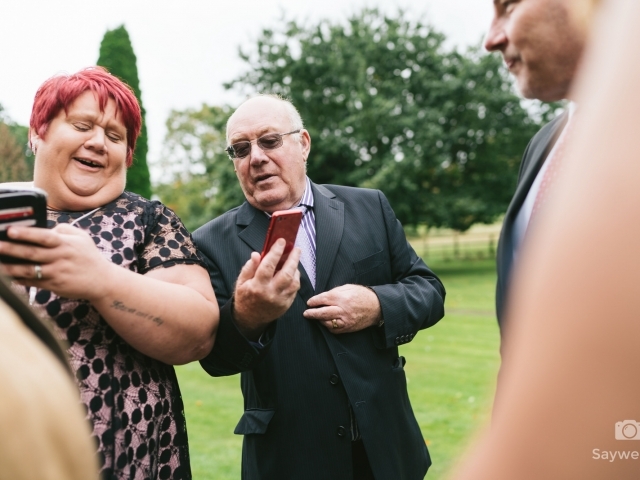 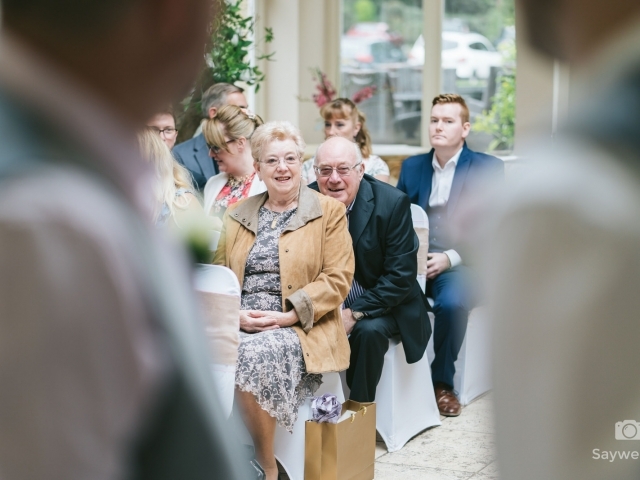 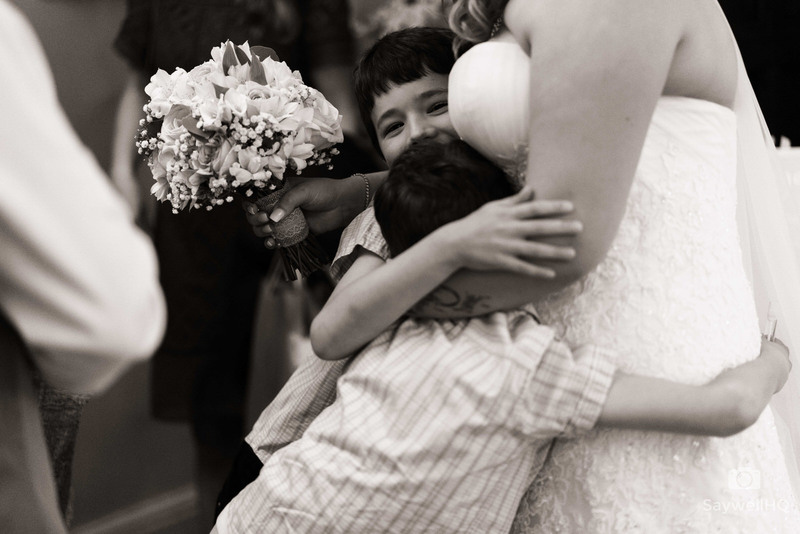 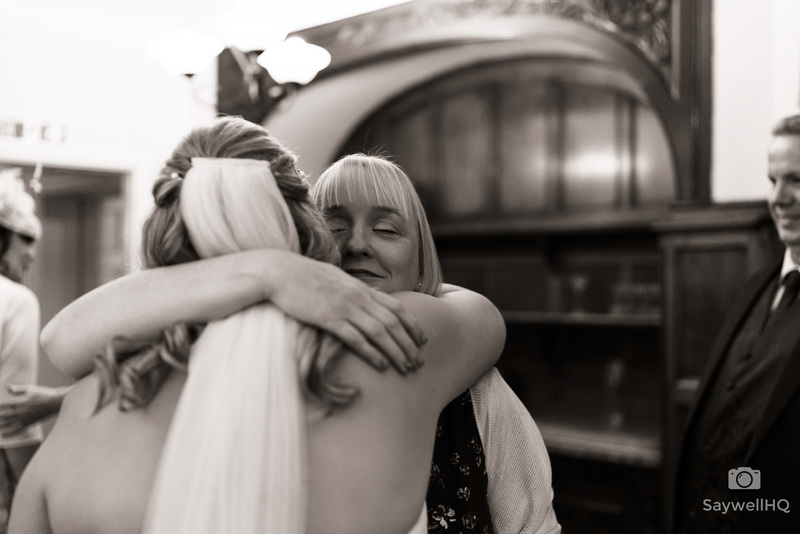 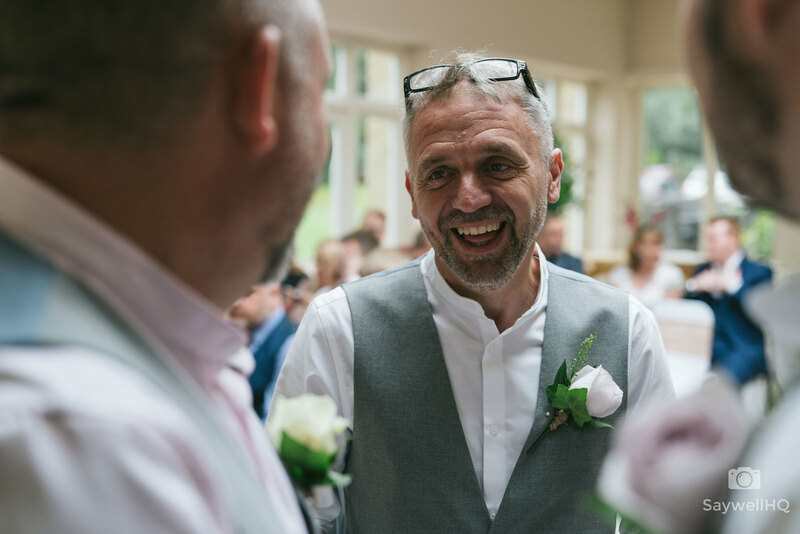 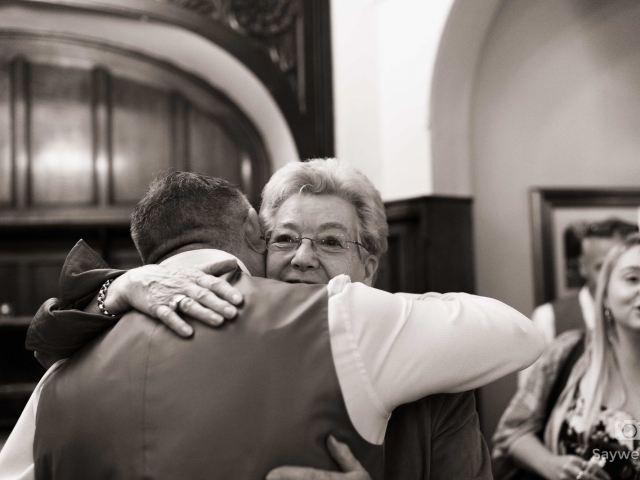 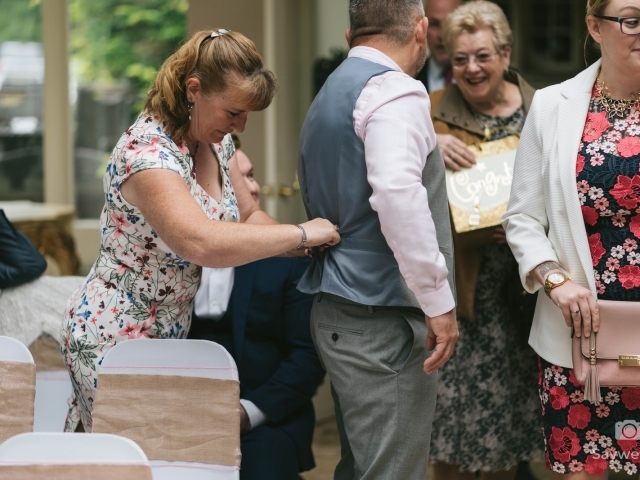 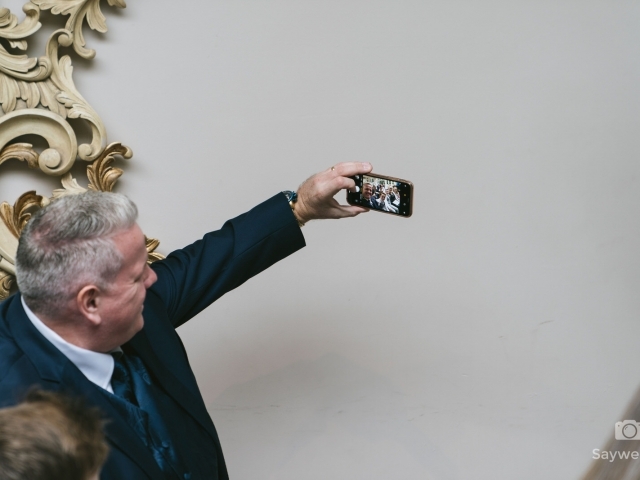 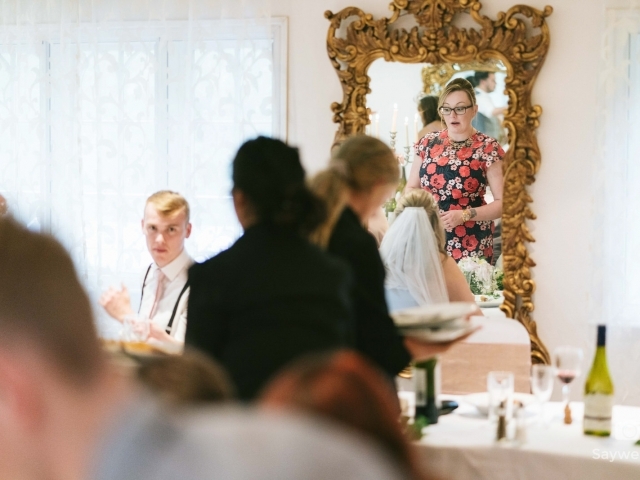 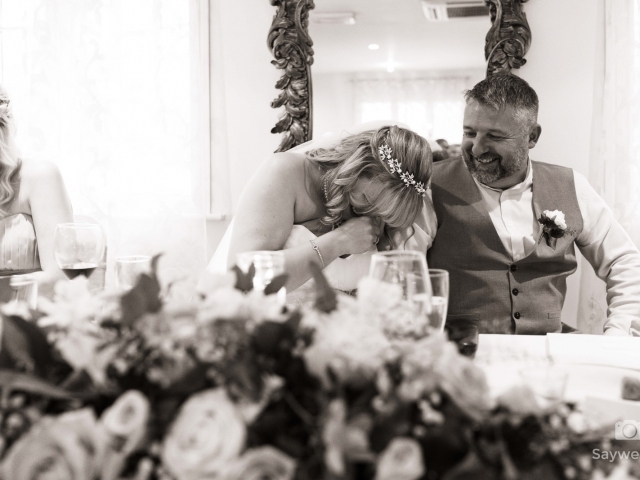 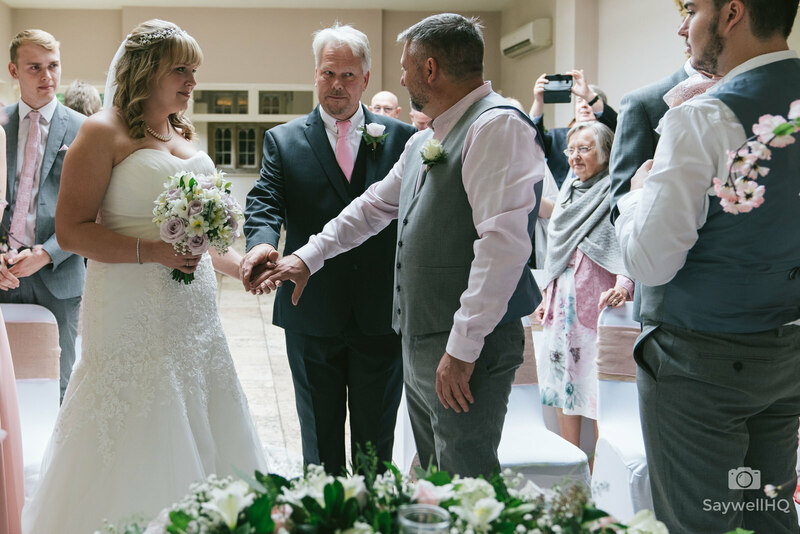 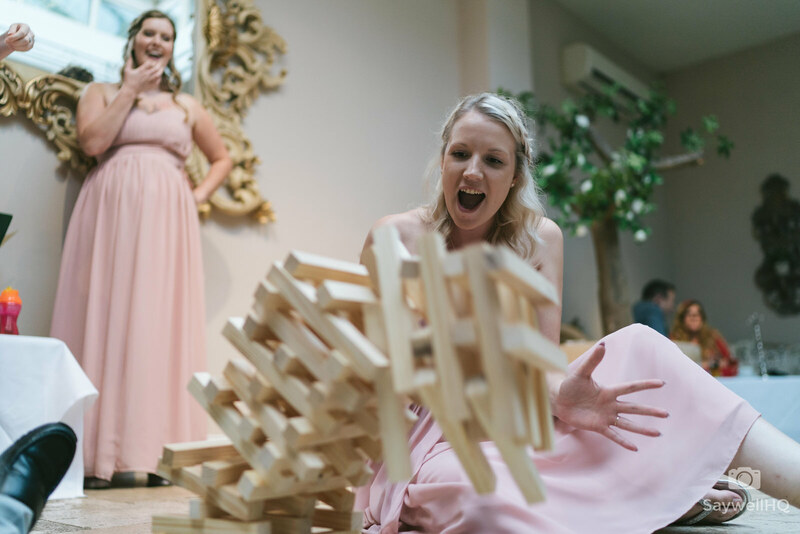 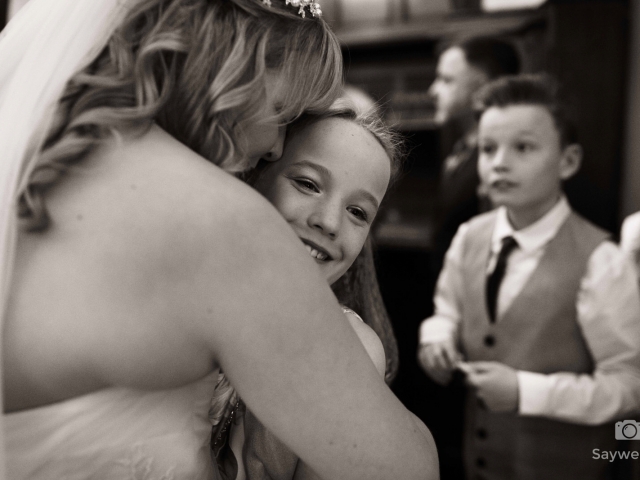 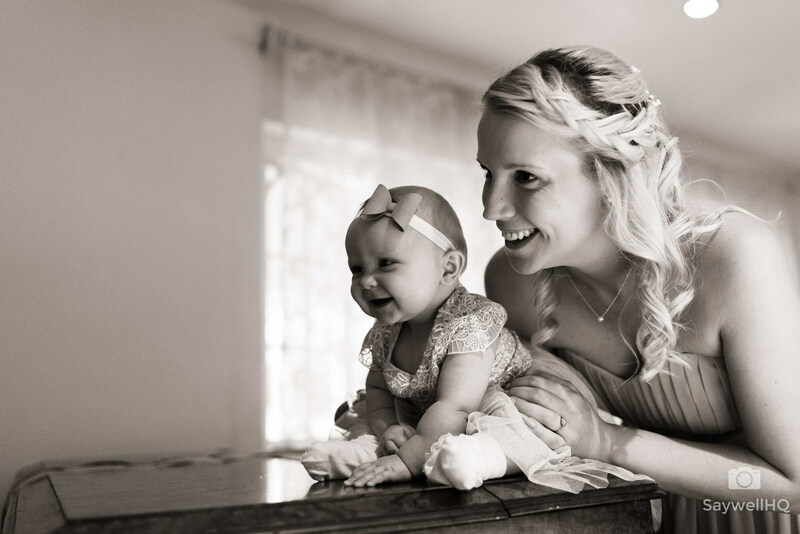 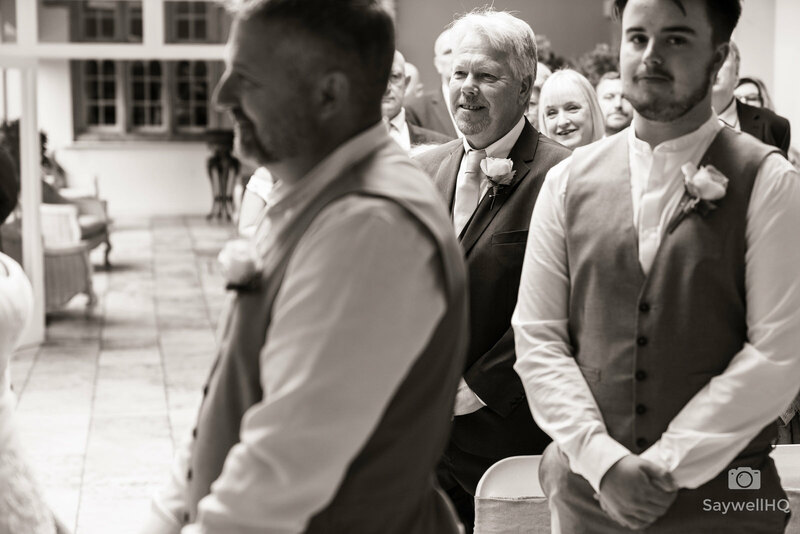 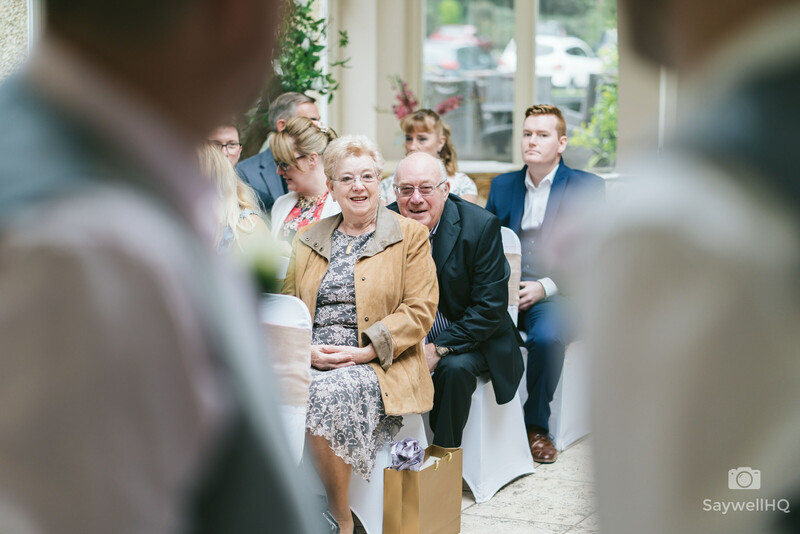 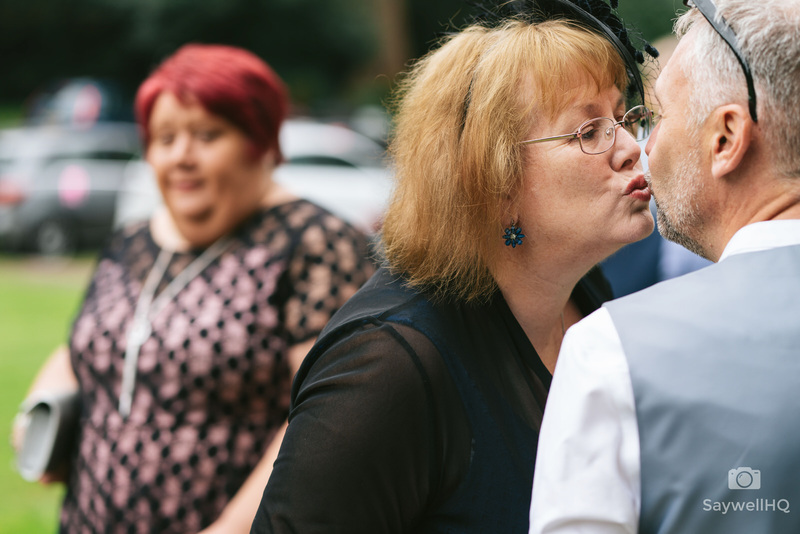 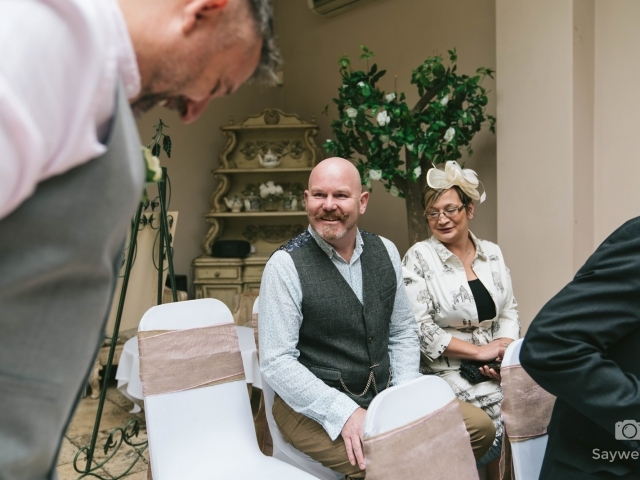 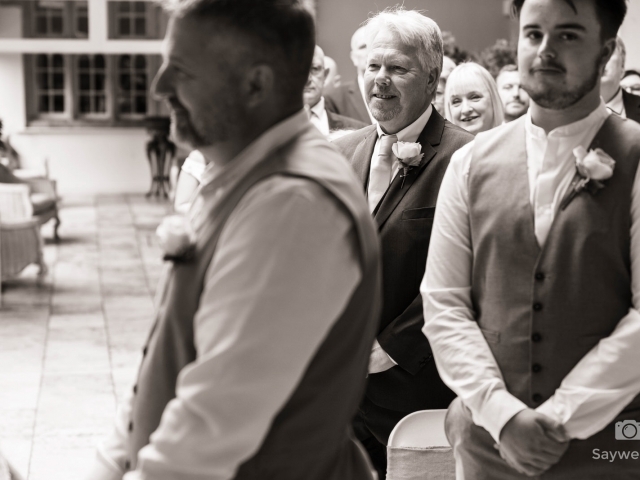 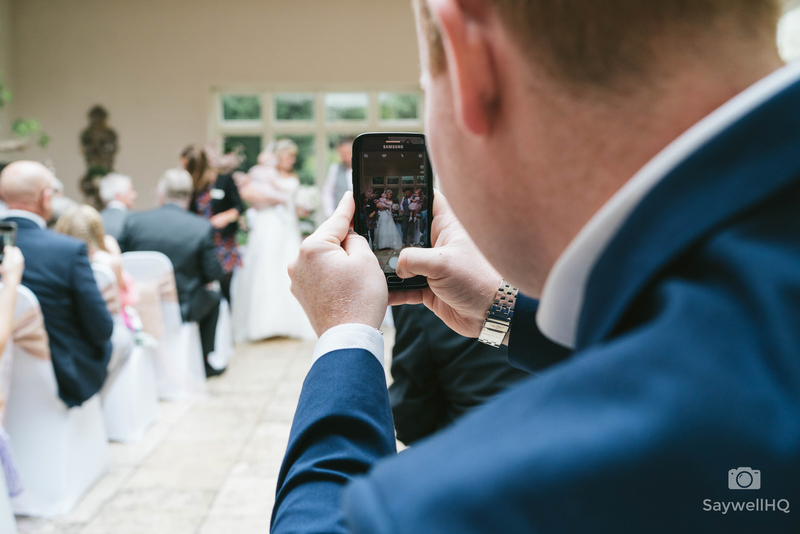 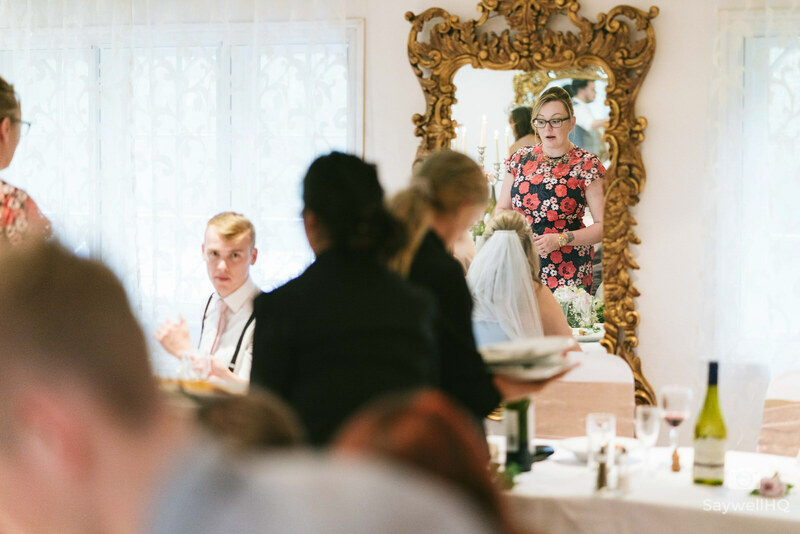 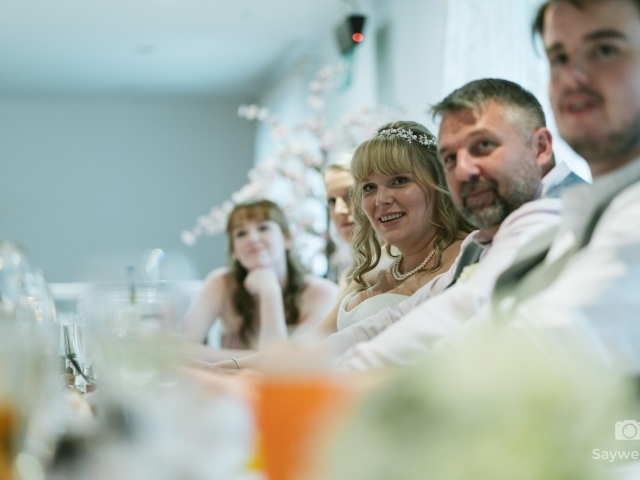 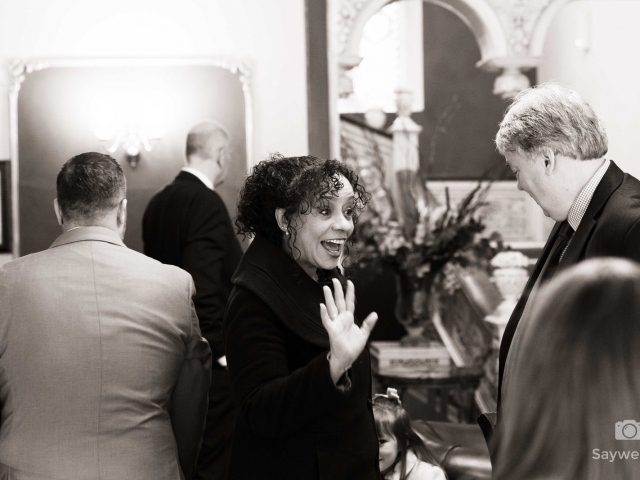 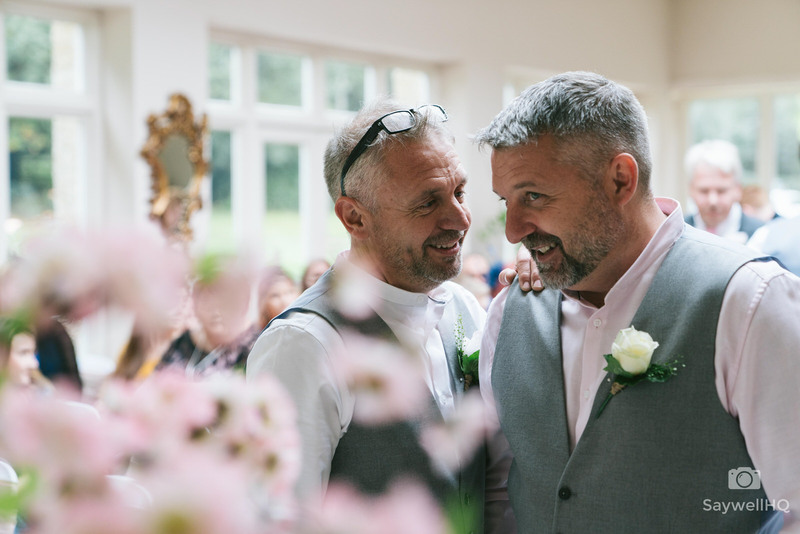 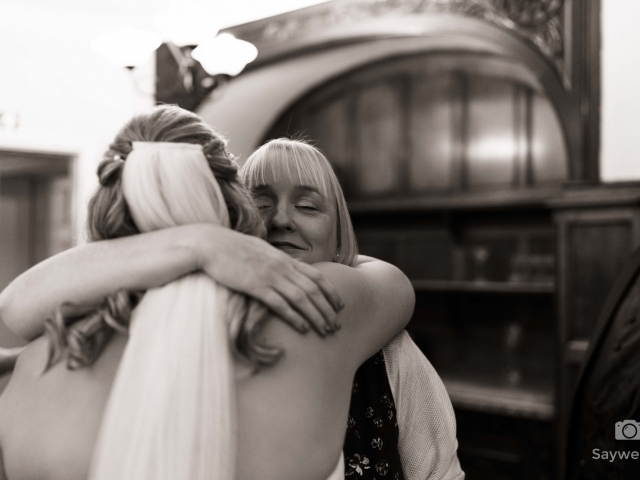 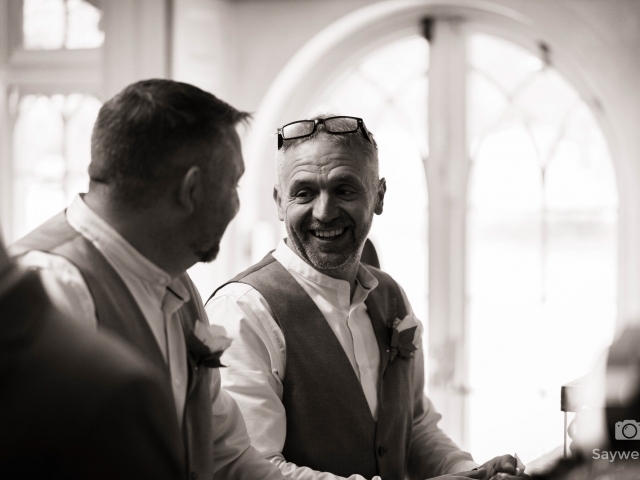 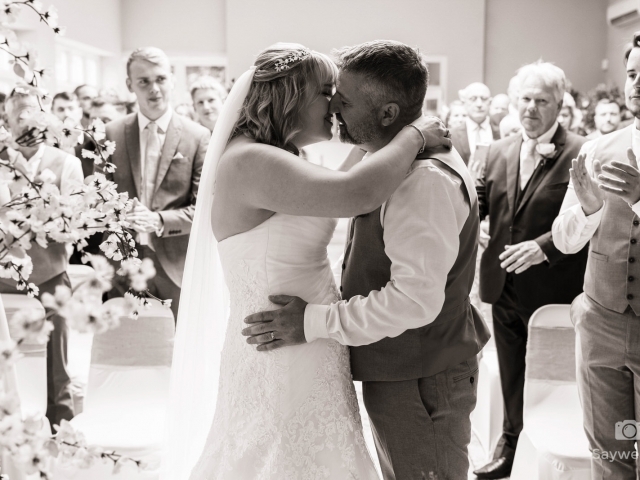 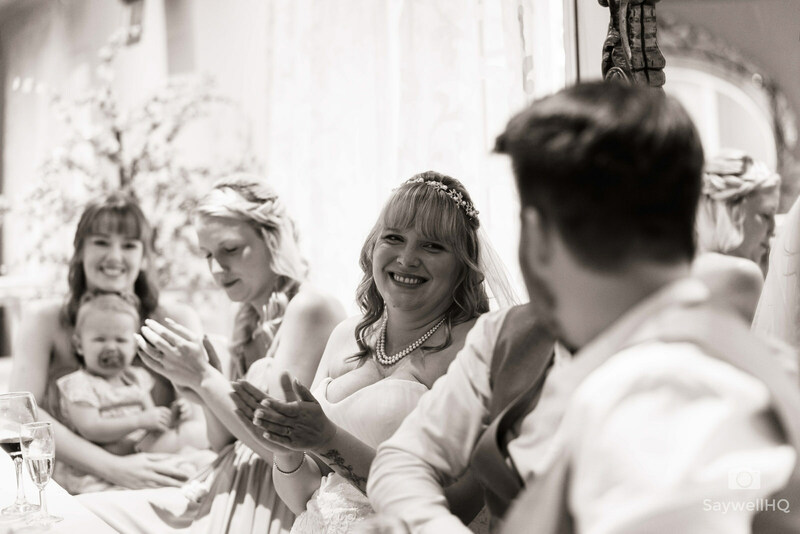 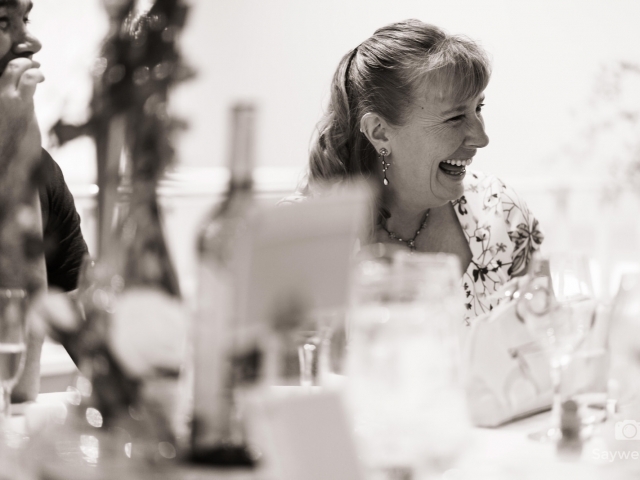 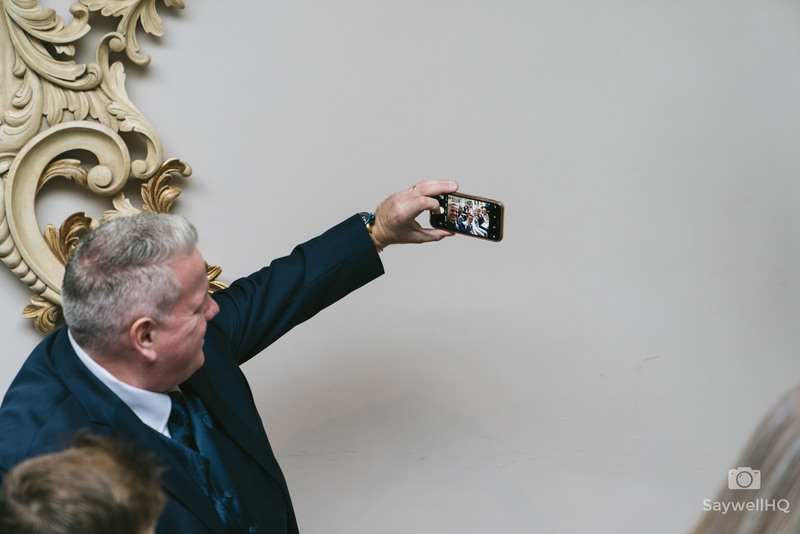 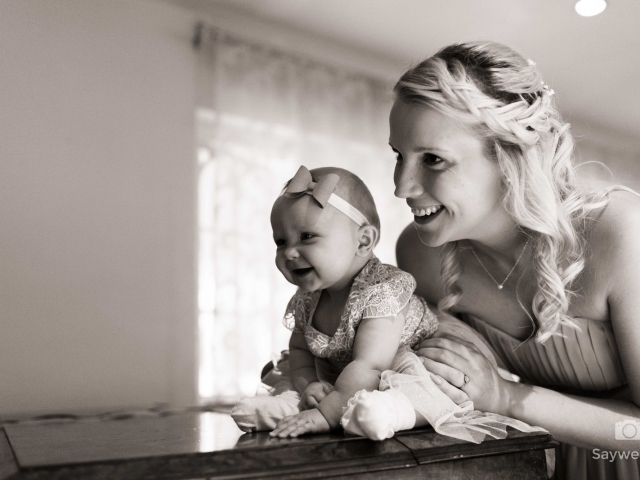 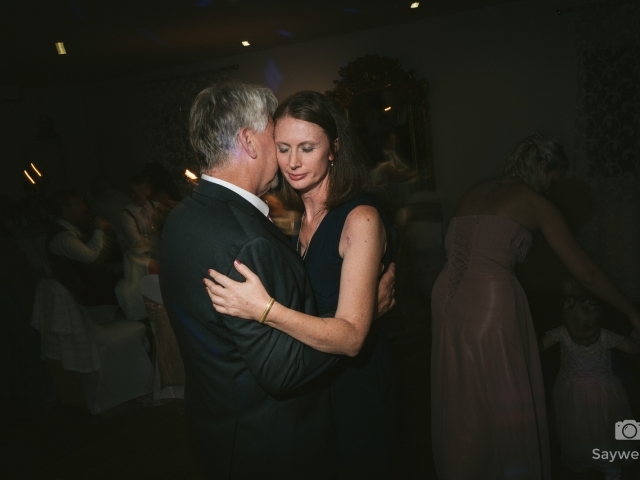 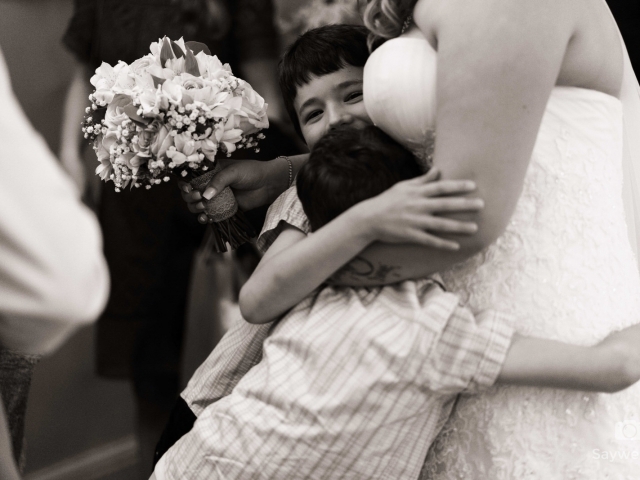 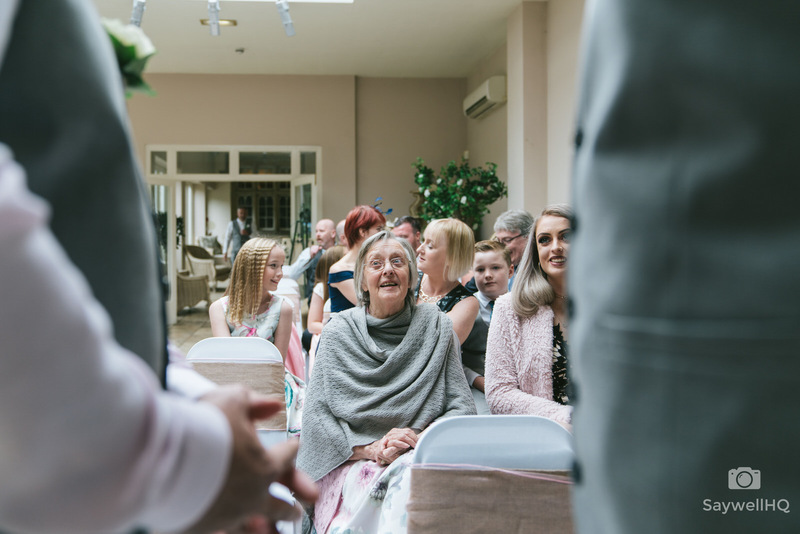 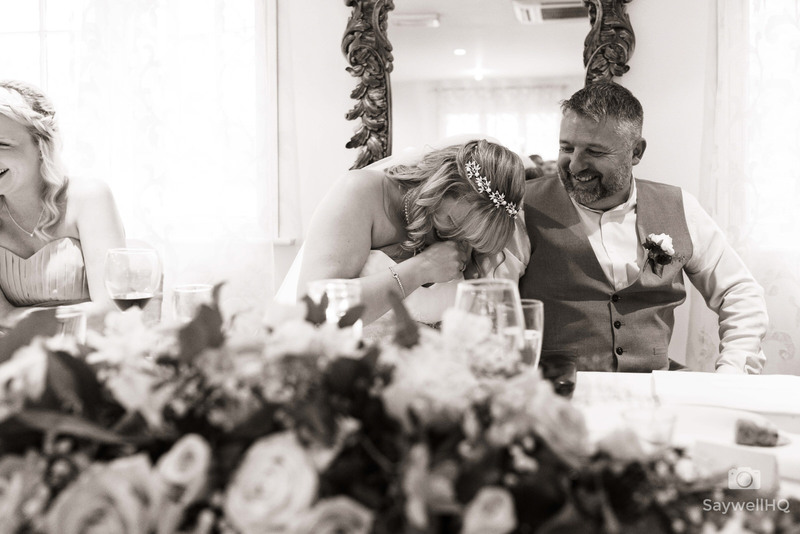 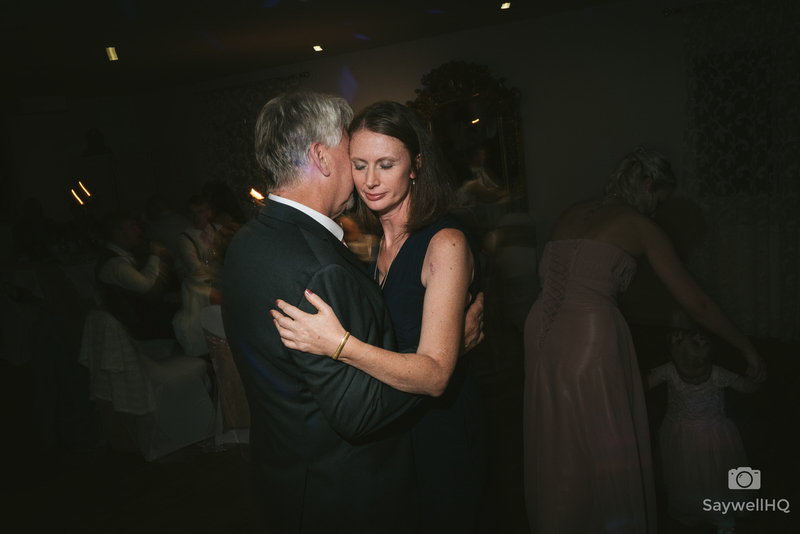 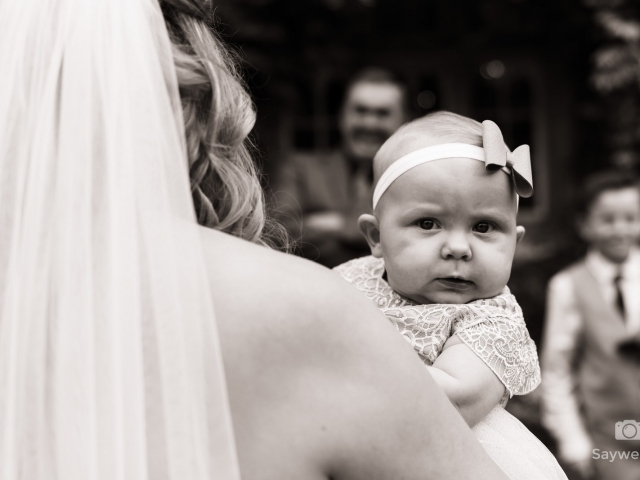 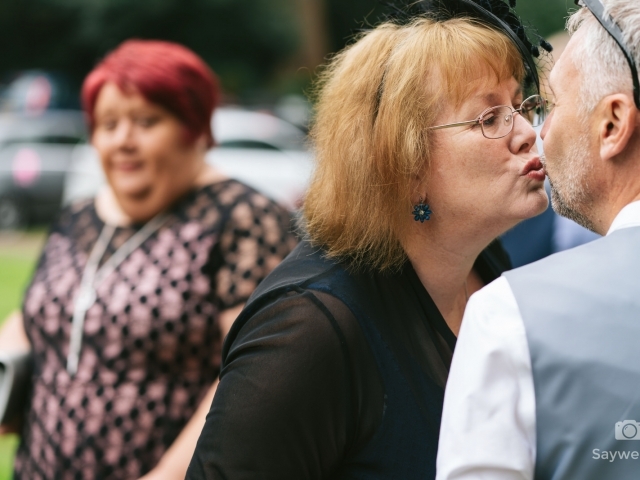 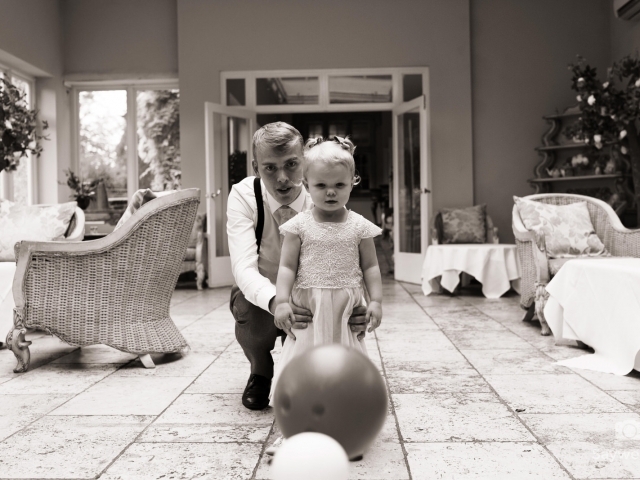 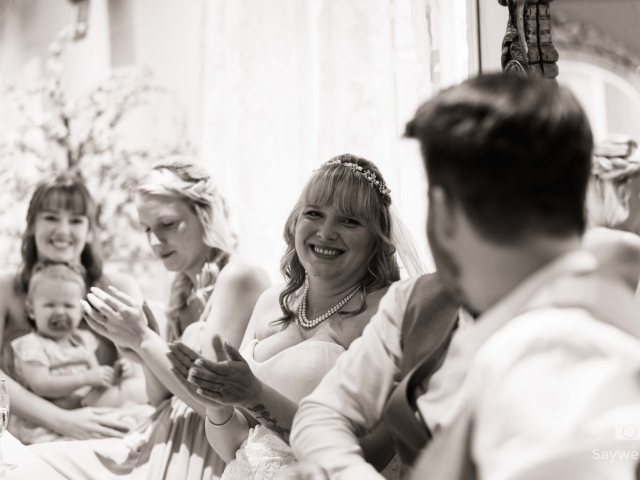 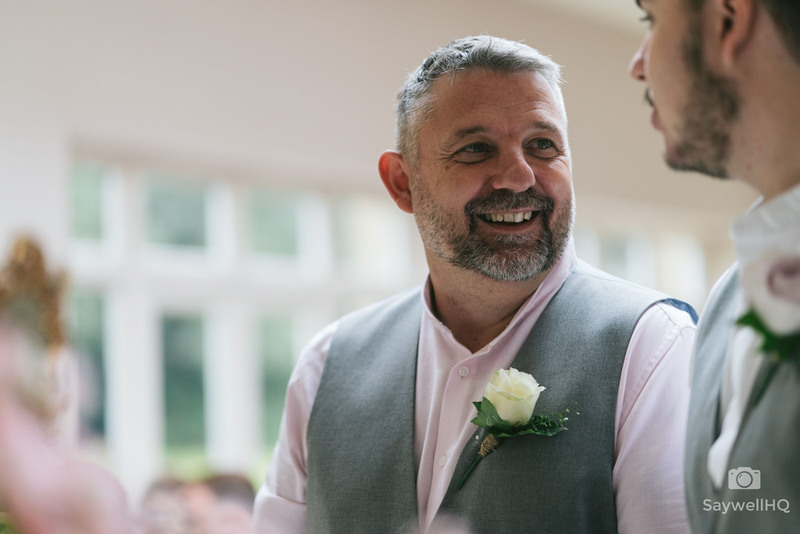 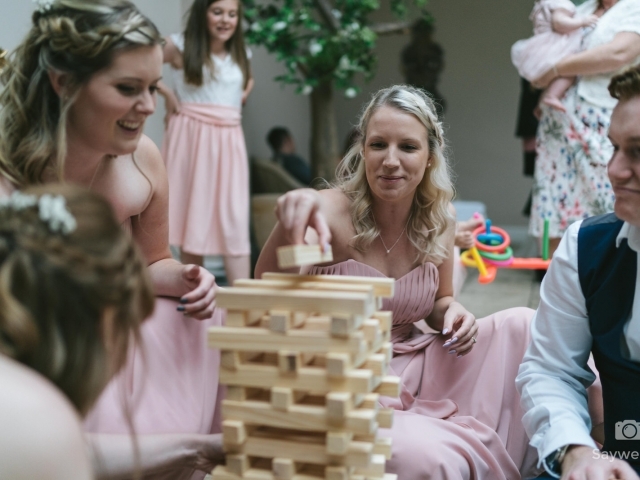 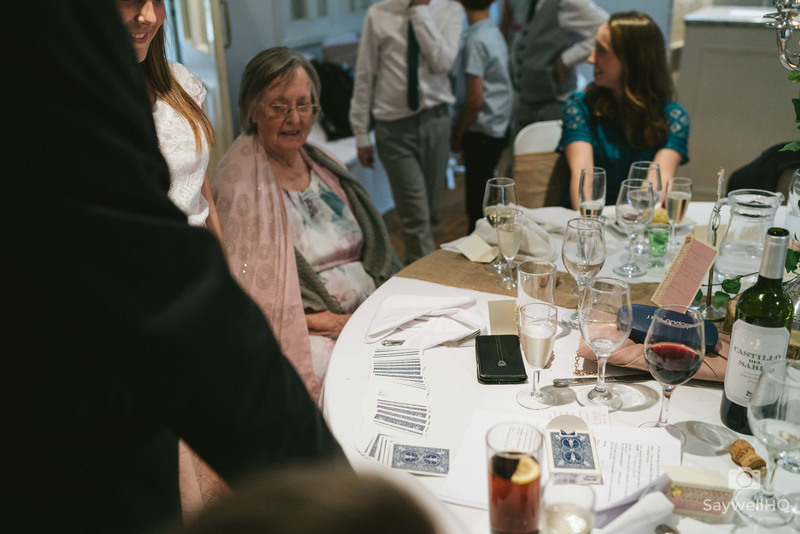 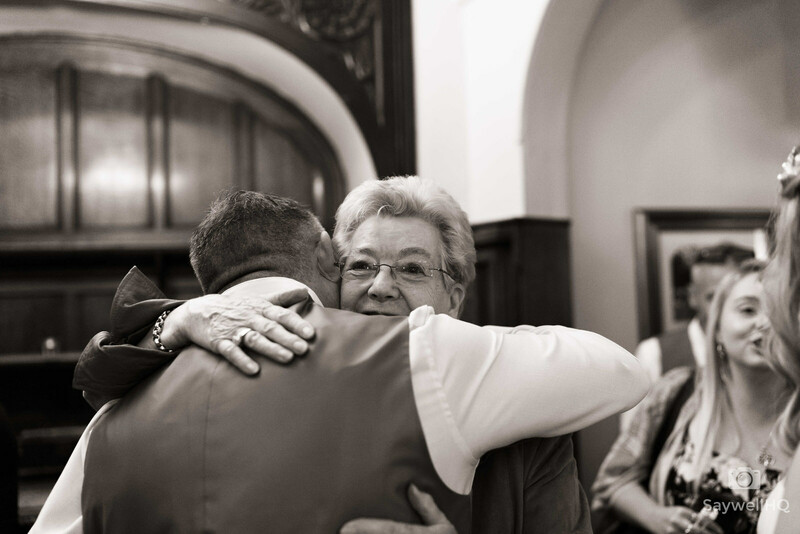 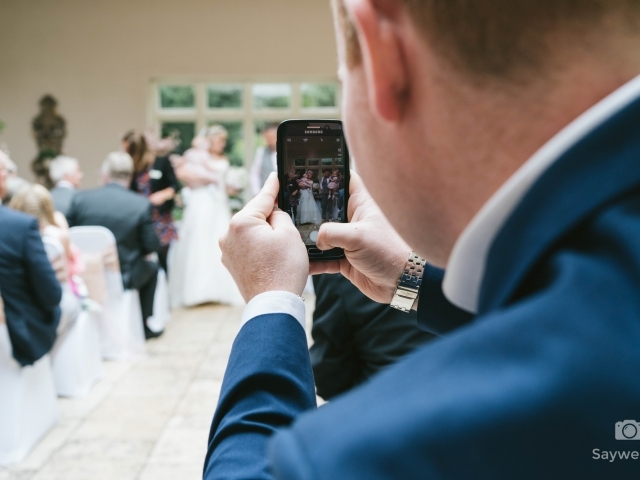 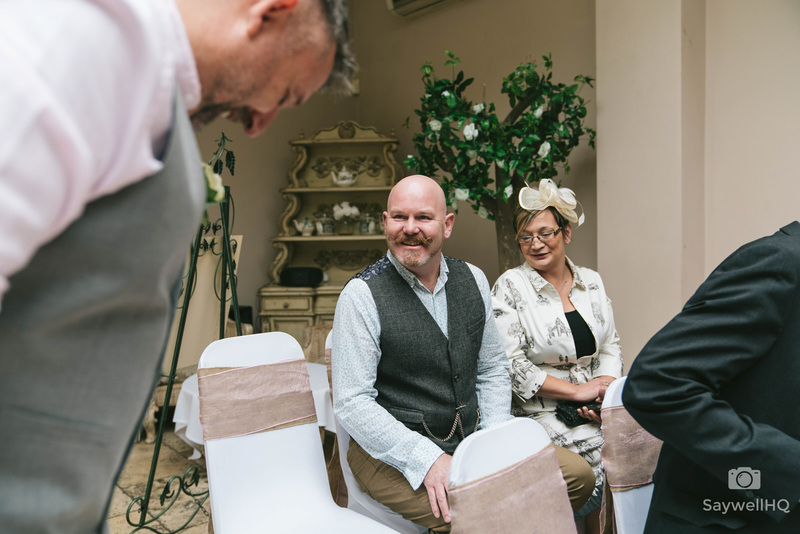 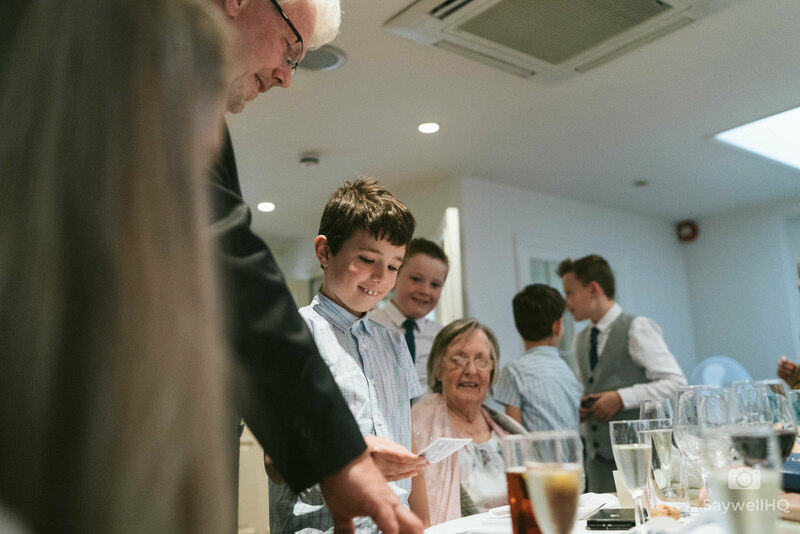 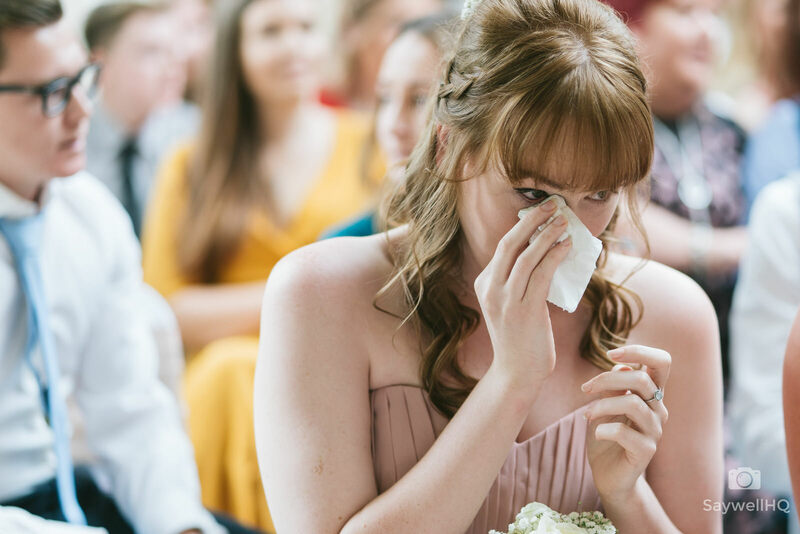 There were plenty of family reunions and friends who hadn’t seen each other for a while; capturing these moments really help to tell the story of the people at the wedding. 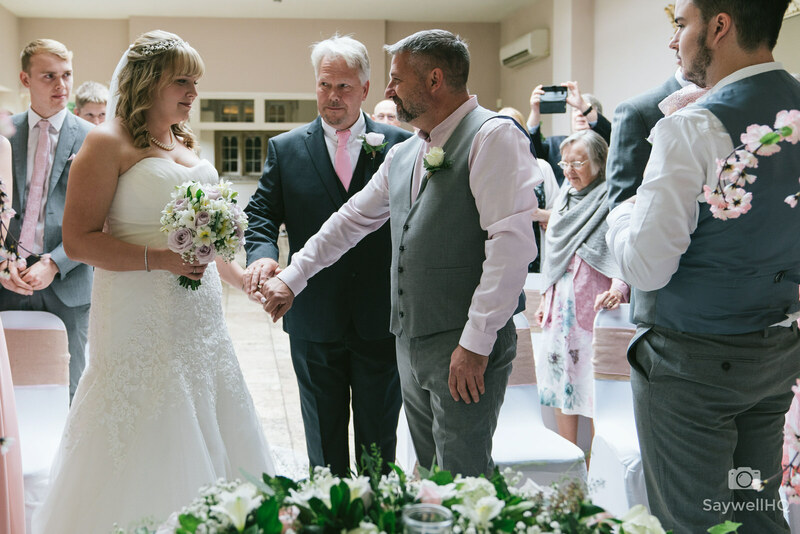 The ceremony room at the hall is beautiful, with big windows down the side of the main hall, and with the light cascading down from the big ceiling windows it made for a beautiful environment to get married. 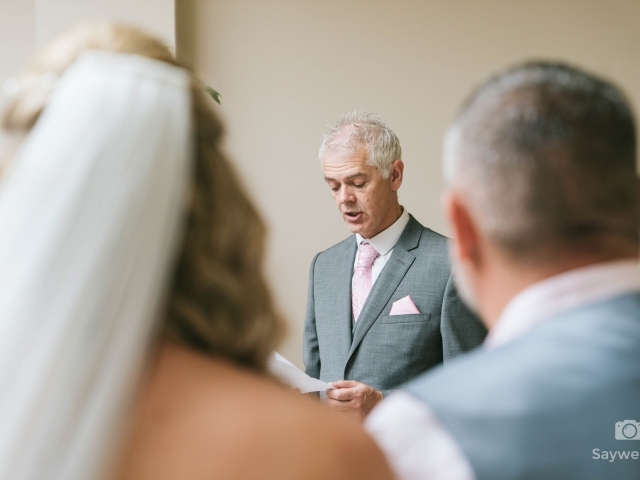 As is the tradition, the bride was slightly late which made Tony more nervous. 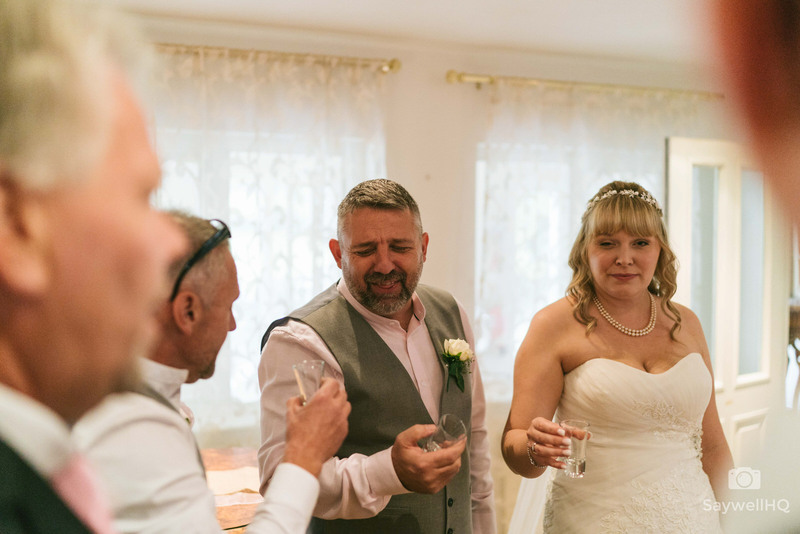 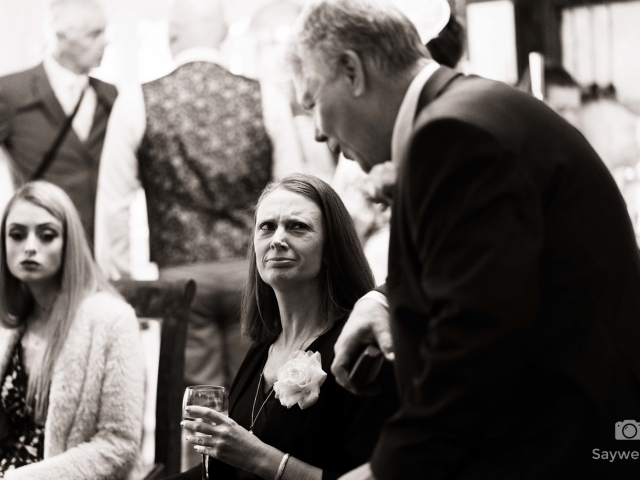 Tony’s brother loved the fact that Michelle was slightly late and kept popping up to where Tony was stood to have a few little digs – it was quite funny watching Tony’s reaction. 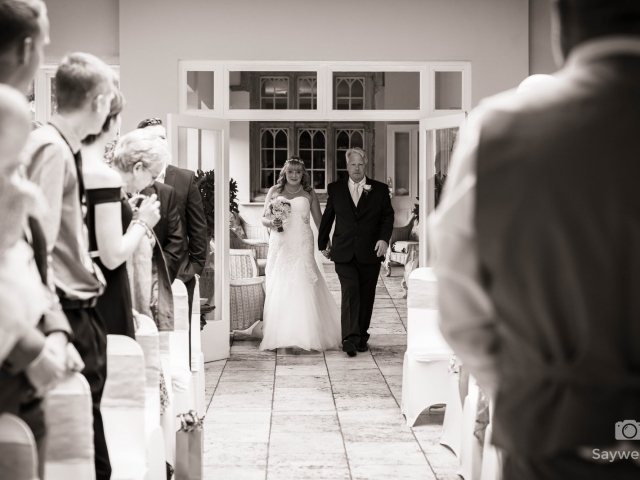 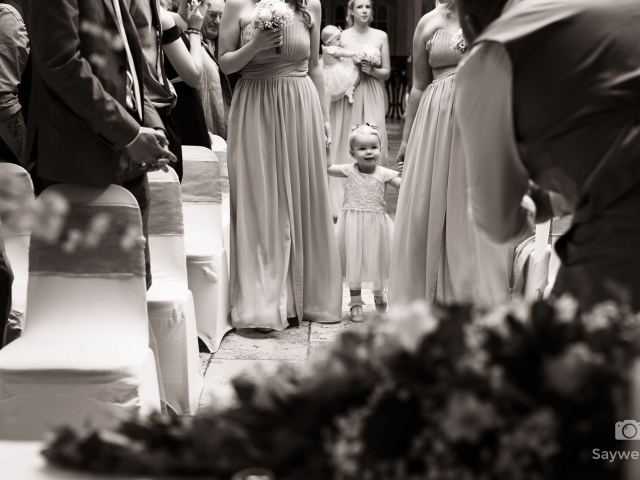 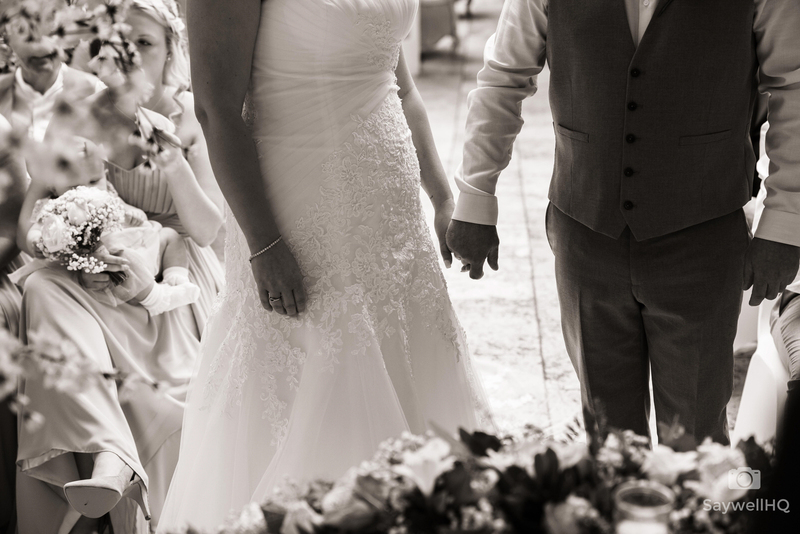 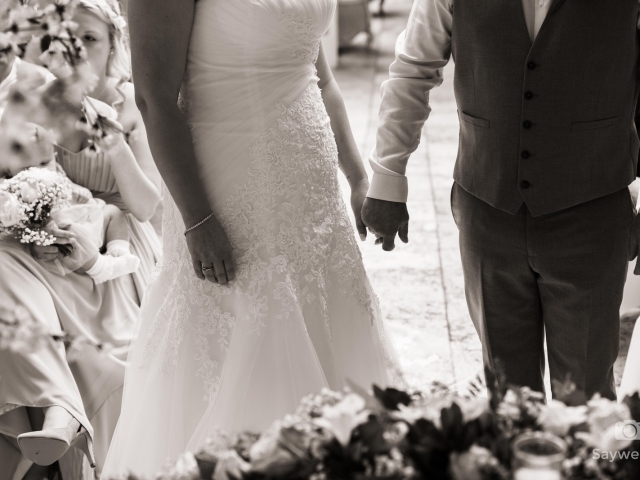 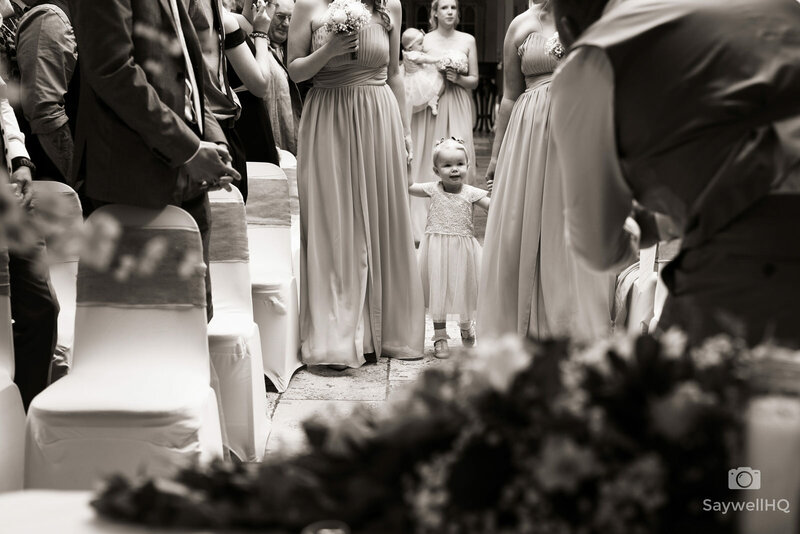 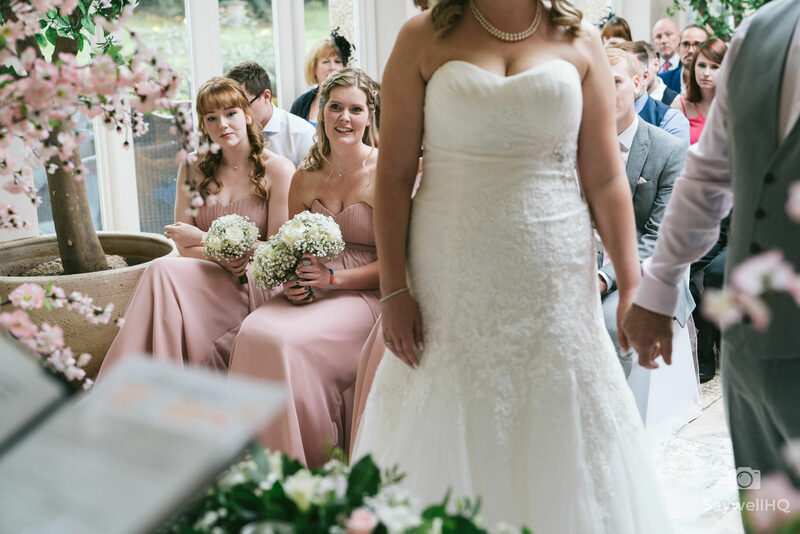 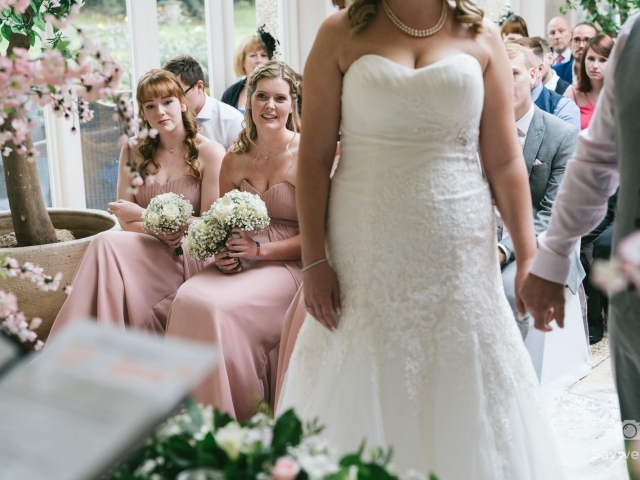 One of my favourite images from the ceremony is the girls coming down the aisle before Michelle and her dad. 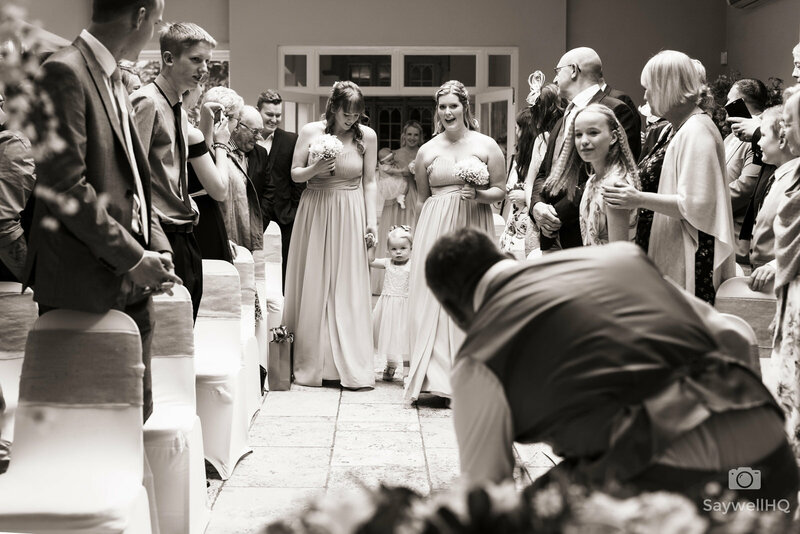 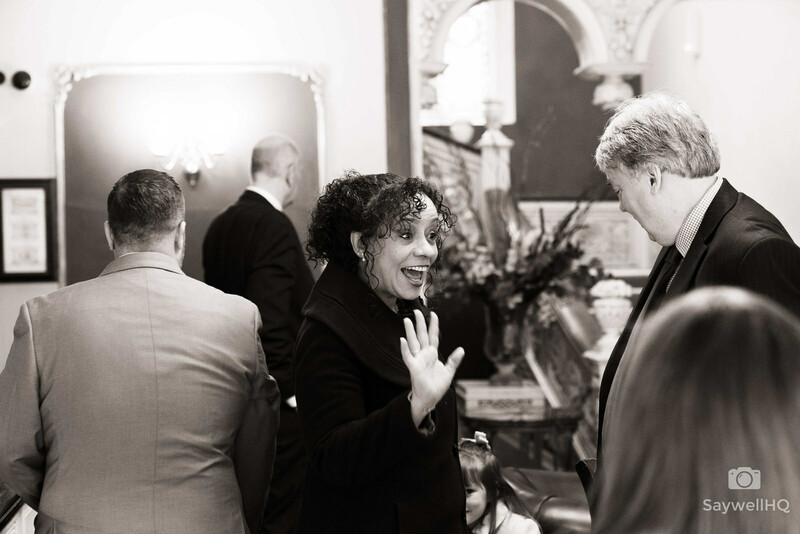 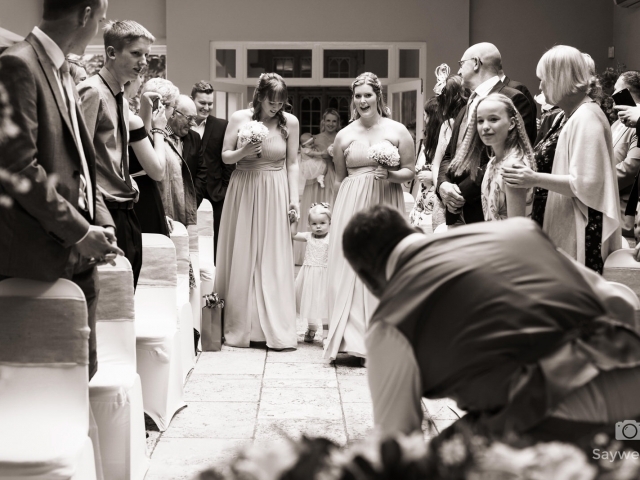 I love the look on Michelle and Tony’s daughter’s face as she is the centre of attention, and with Tony kneeling down to catch her eye – and the low-down nature of the photo it makes quite a dynamic picture. 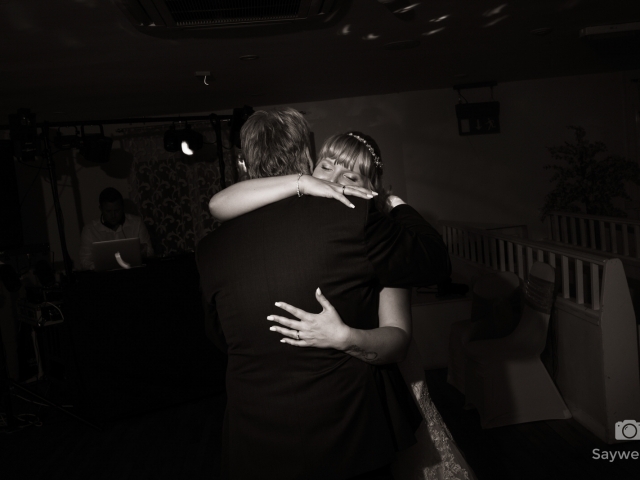 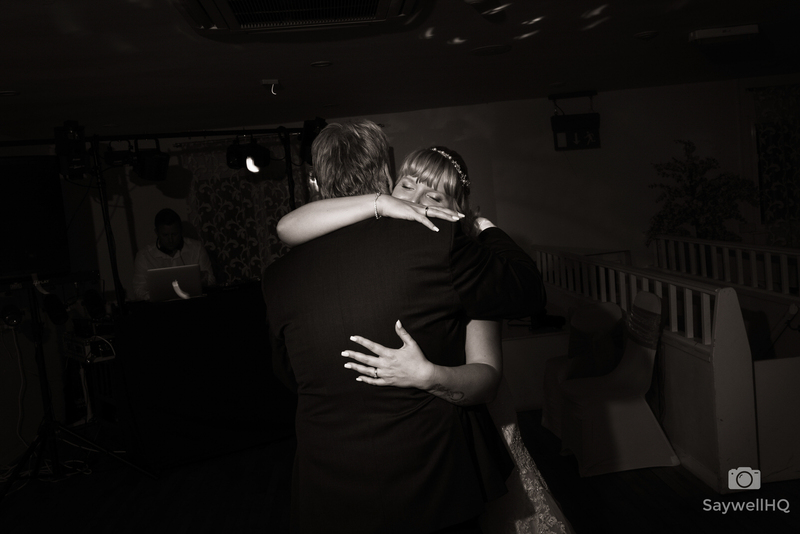 Once the ceremony was done it was off back into the bar, where I worked the room capturing some of my favourite “hug” pictures – and it wasn’t long before we were at the wedding breakfast and then into the speeches. 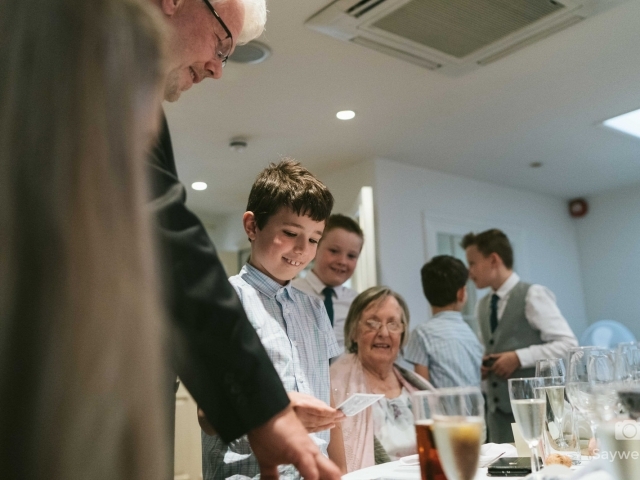 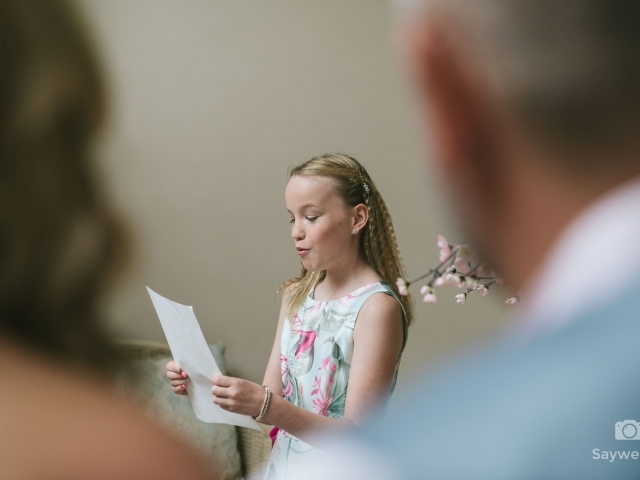 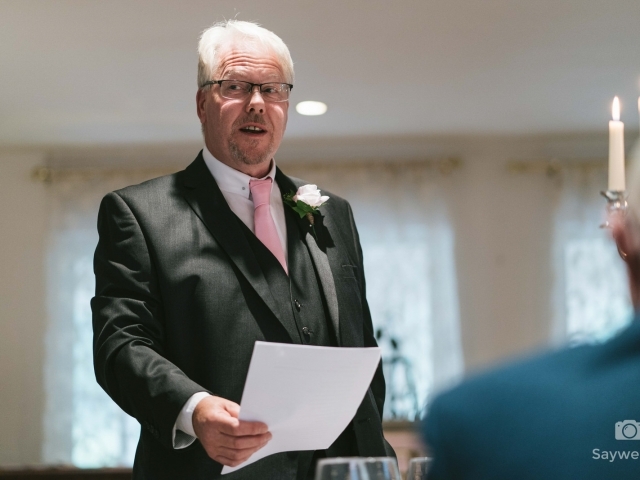 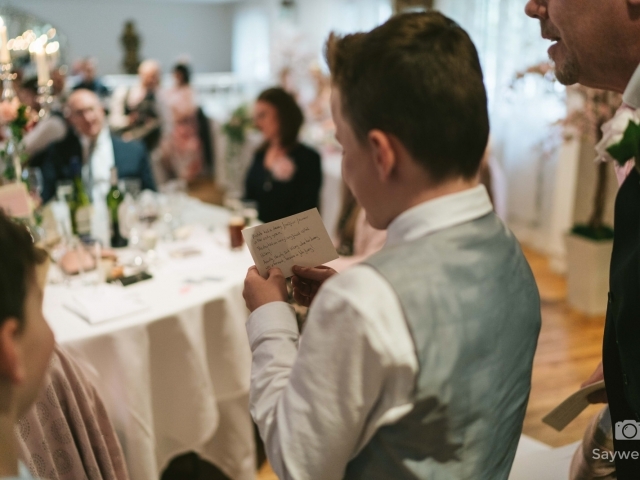 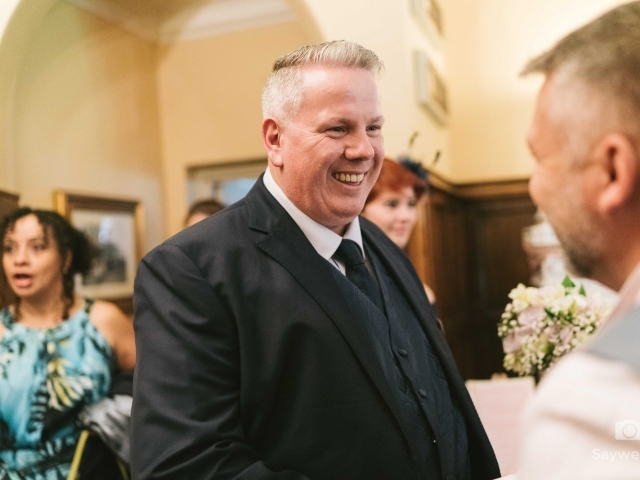 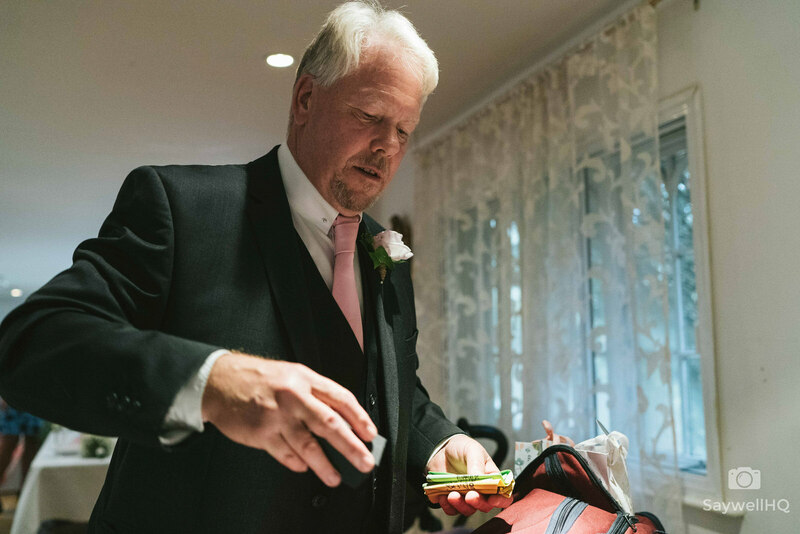 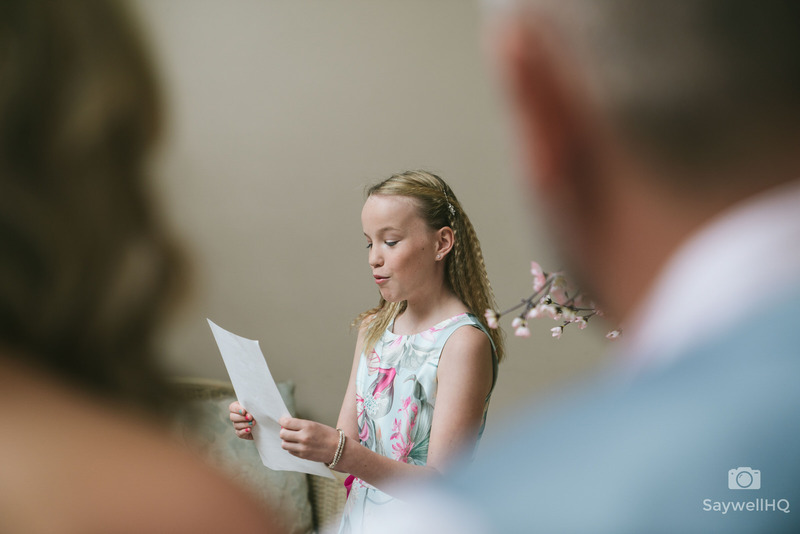 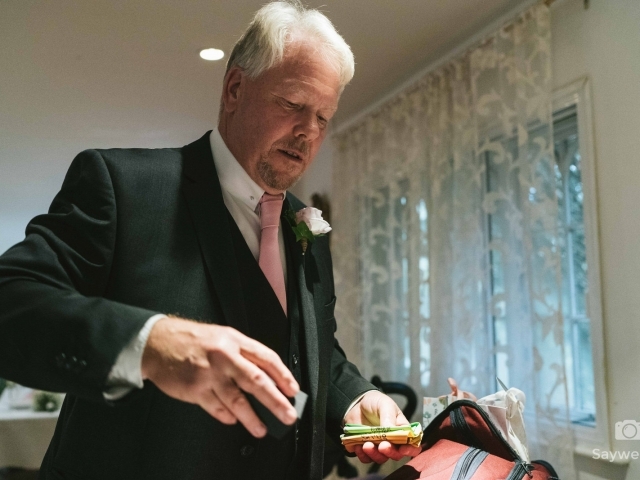 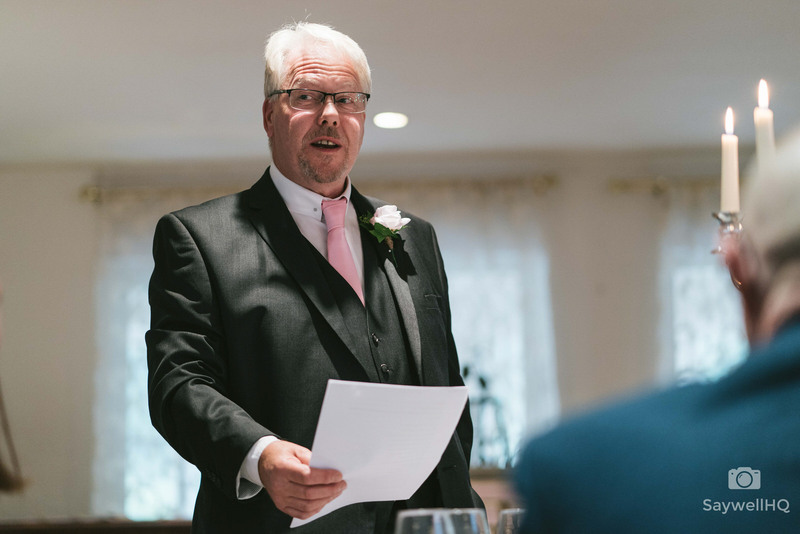 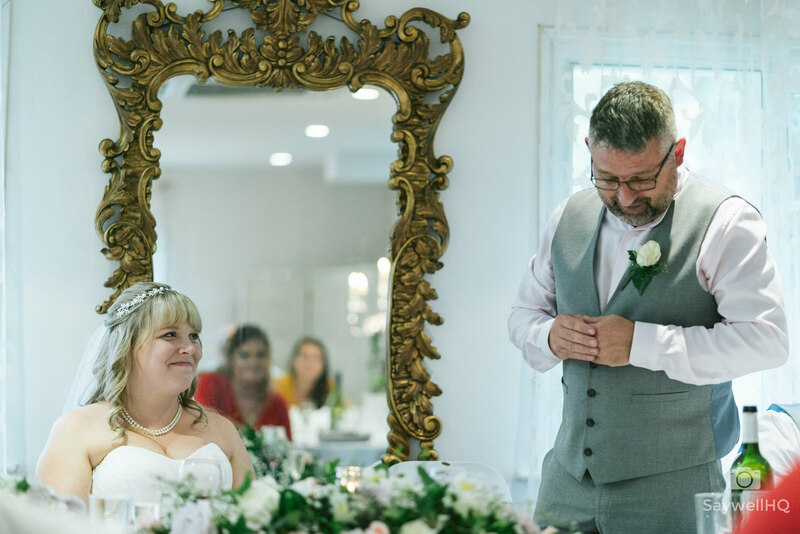 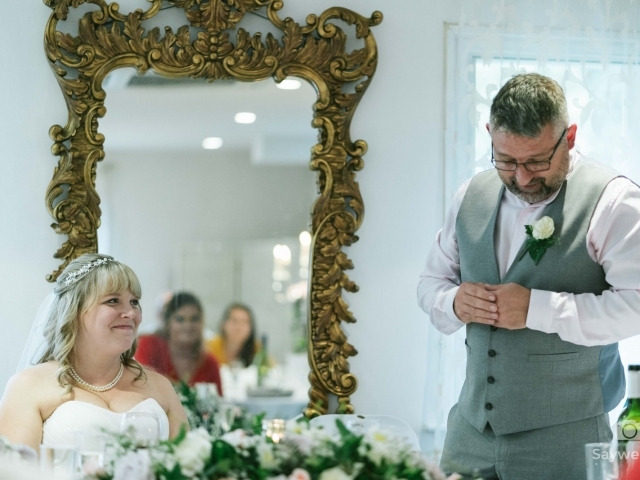 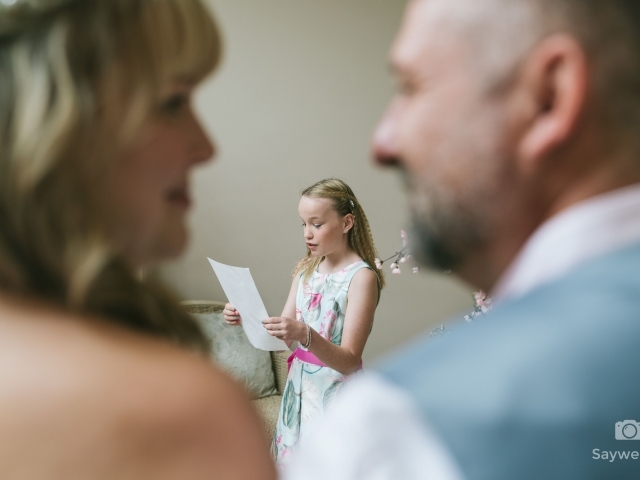 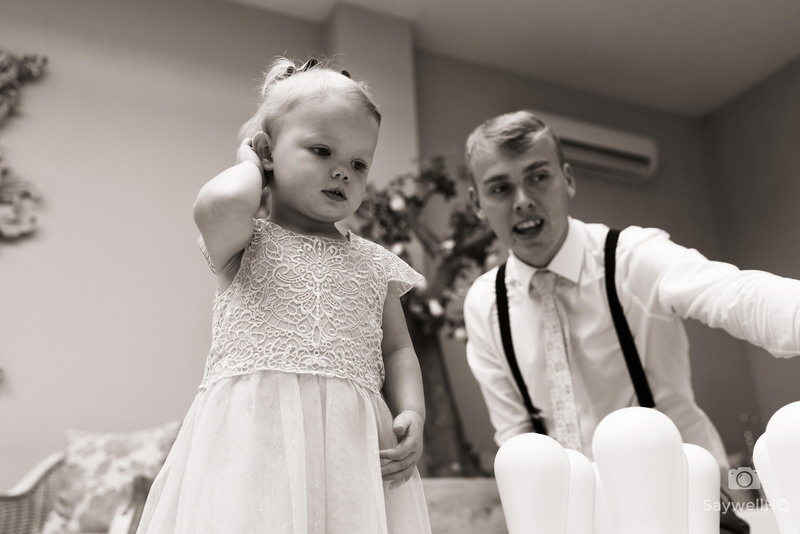 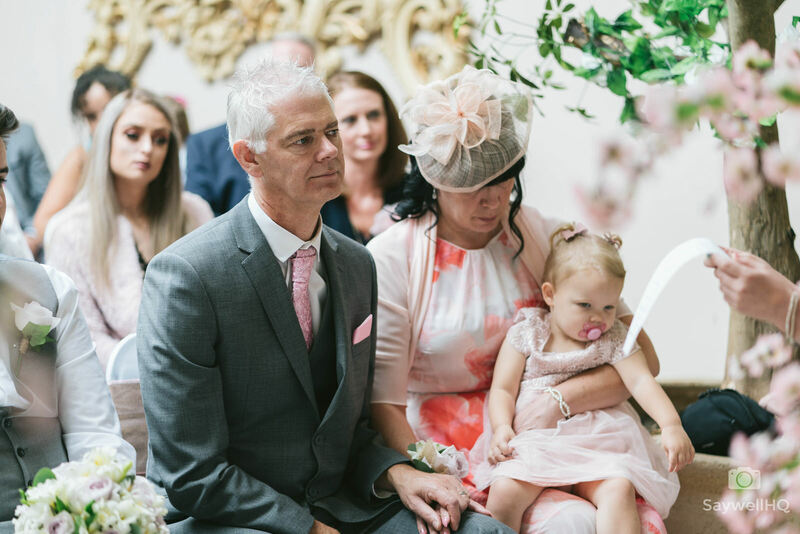 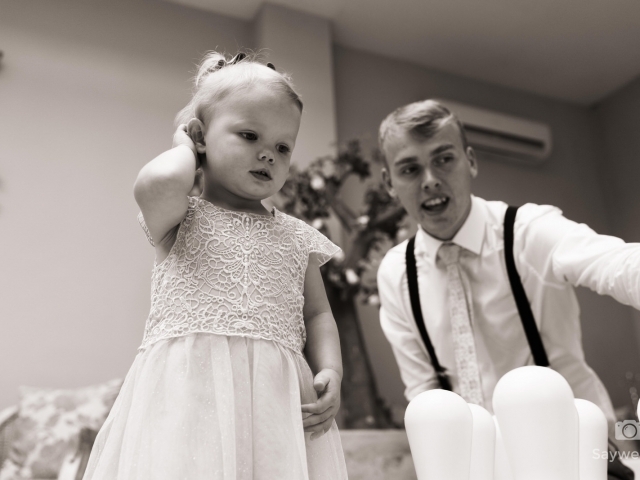 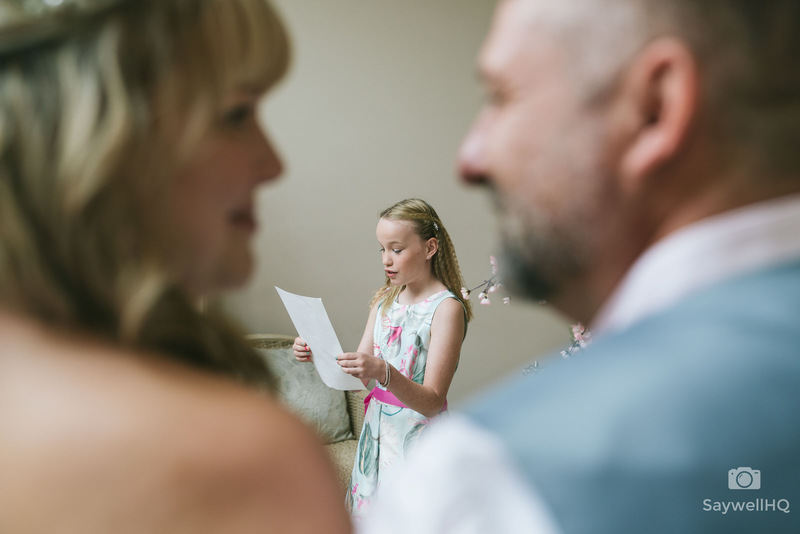 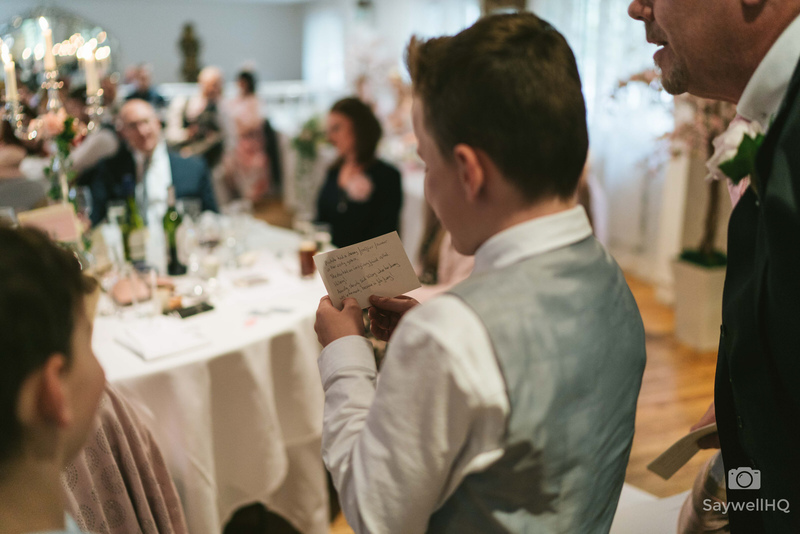 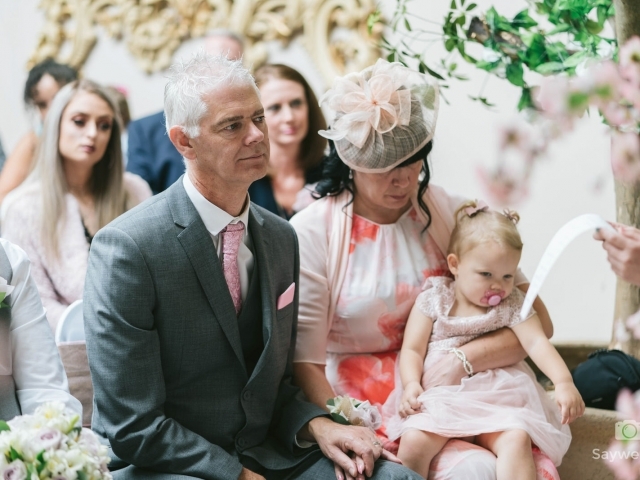 Michelle’s dad enlisted the help of all the kids at the wedding to help him deliver the Father of the Bride speech – something I haven’t seen before and was very special. 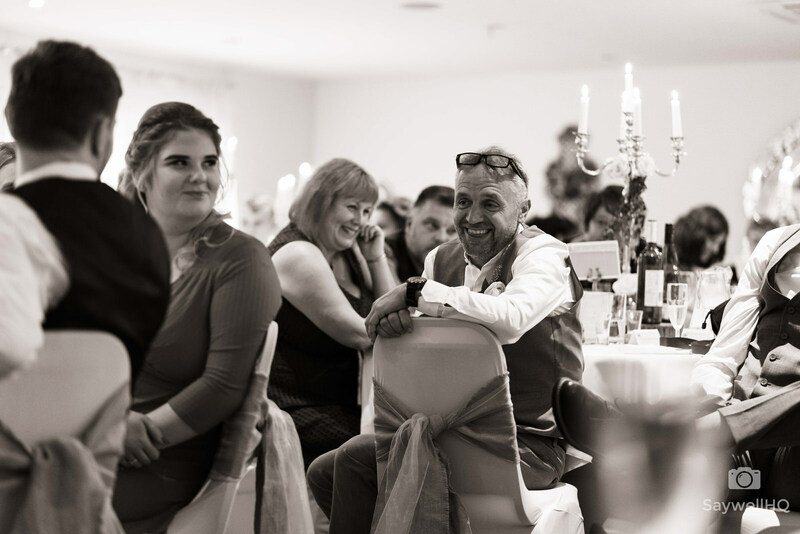 During Tony’s speech, there was one section which I still remember now and will remember for a long time. 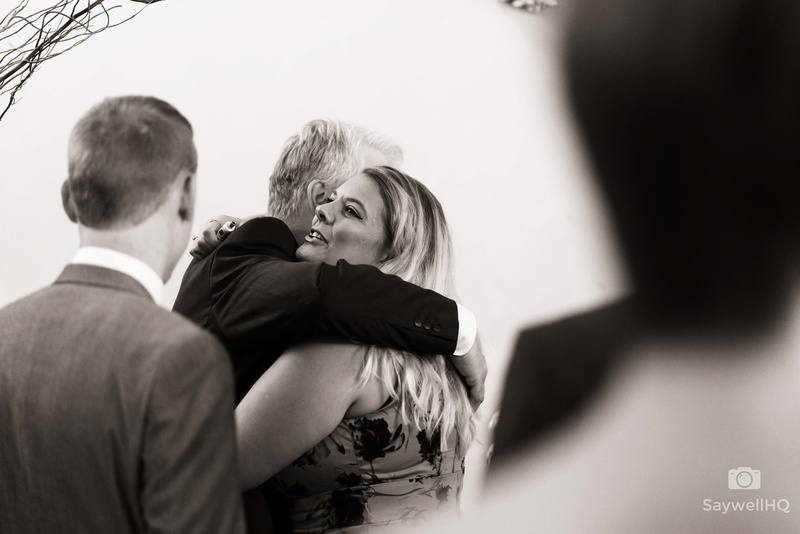 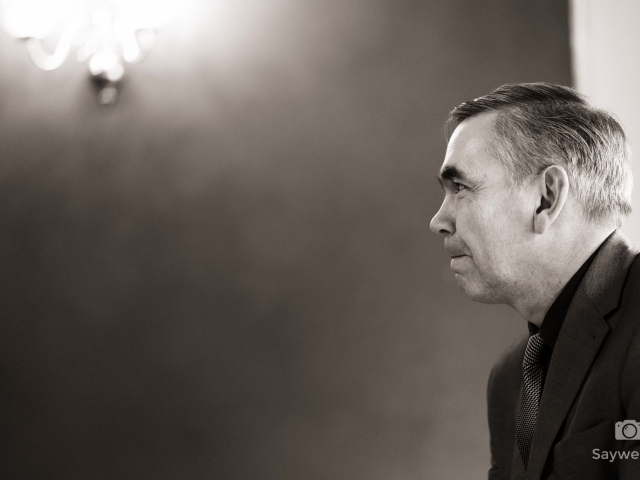 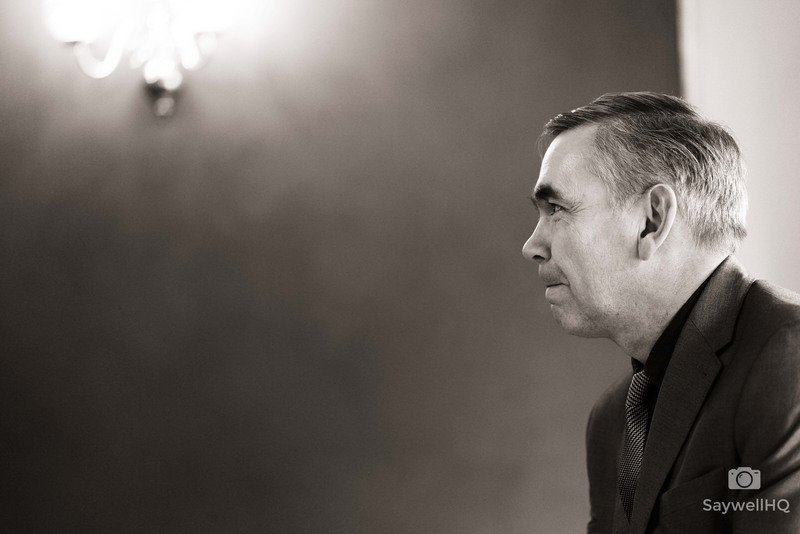 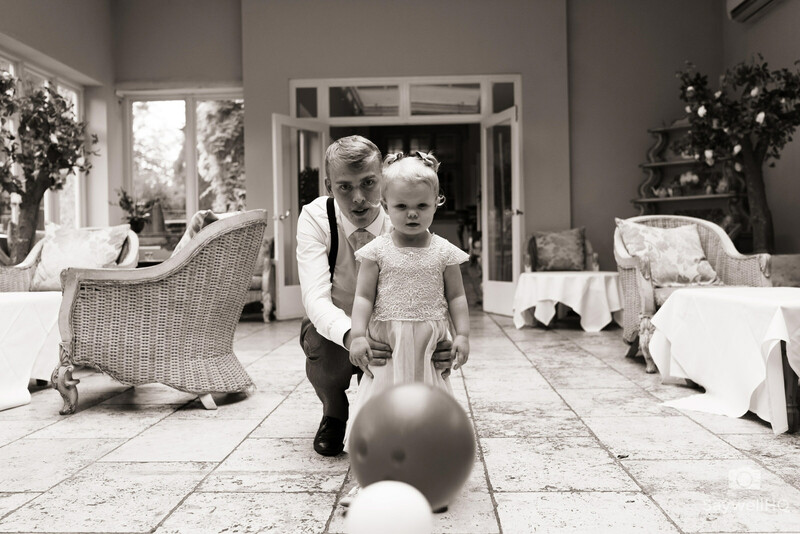 Tony talked about his proudest moments – he said his second proudest moment was holding both his daughters in his arms, and that his proudest moment is whilst holding his daughters in his arms they hold and hug him back. 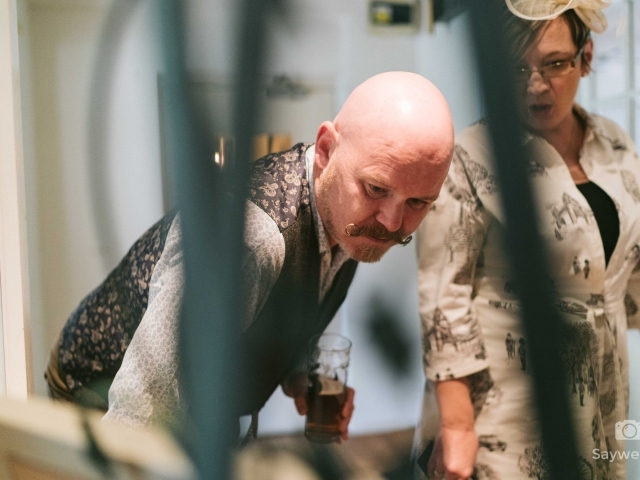 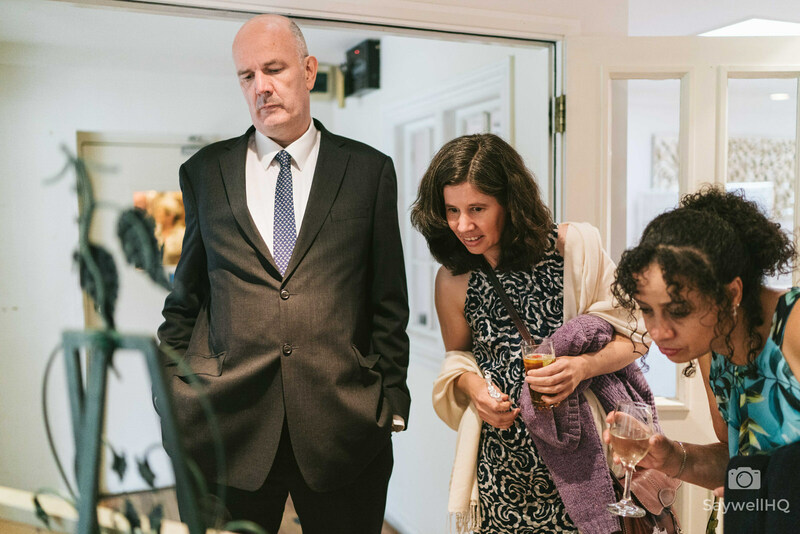 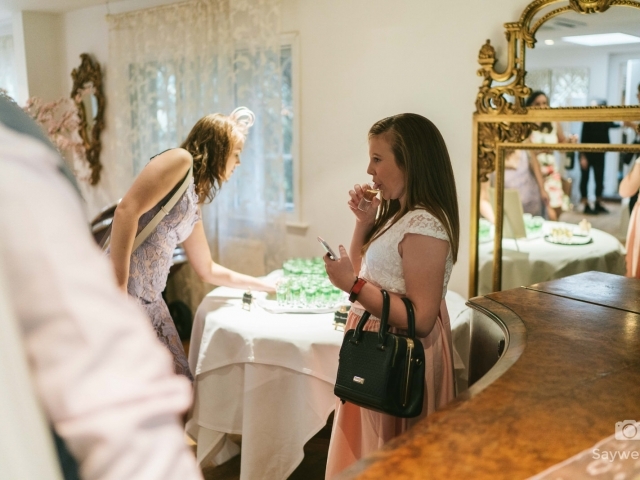 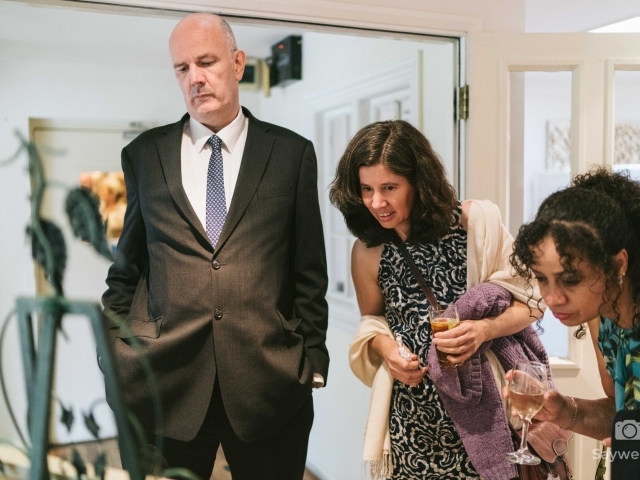 After the speeches, people drifted away to play games, or outside to enjoy the gardens – and, obviously, drifting into the bar. 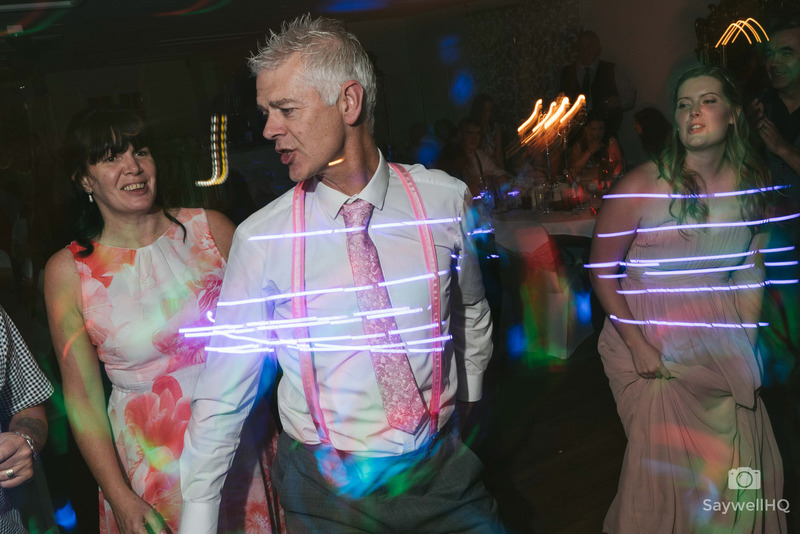 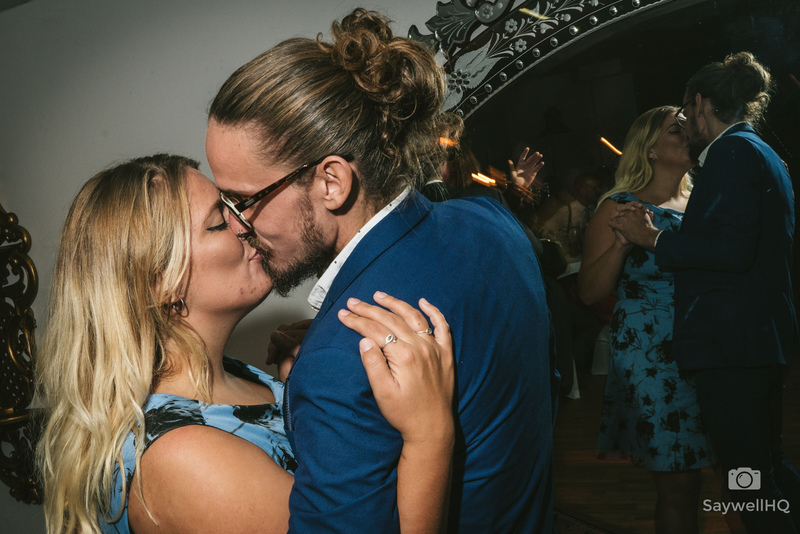 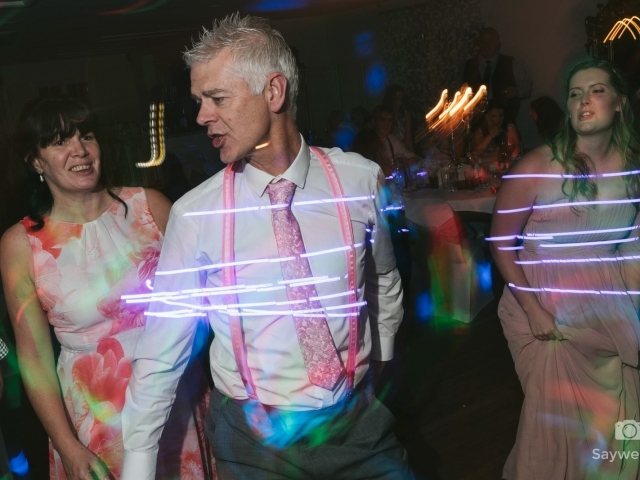 The evening kicked off with the cake-cut and the first dance, then it was into the disco; where everybody got up and danced throughout the night. 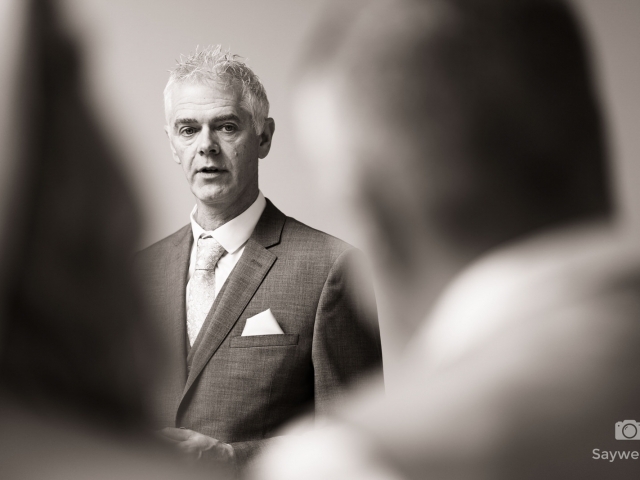 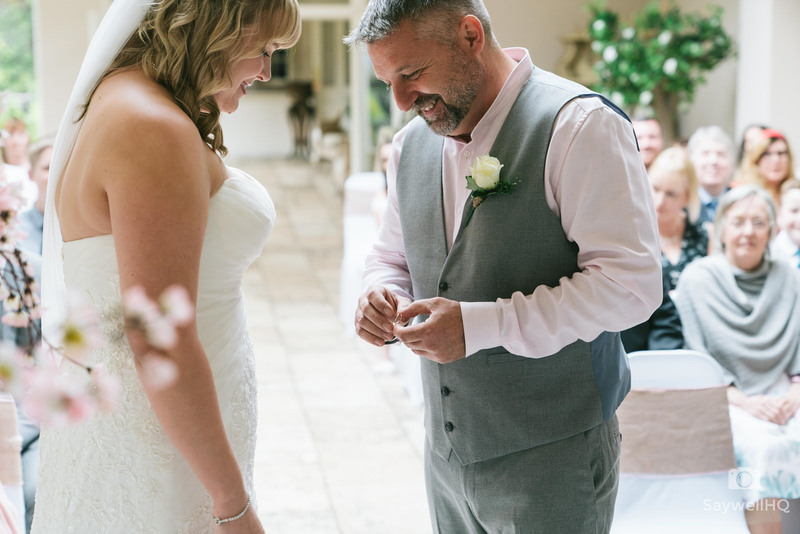 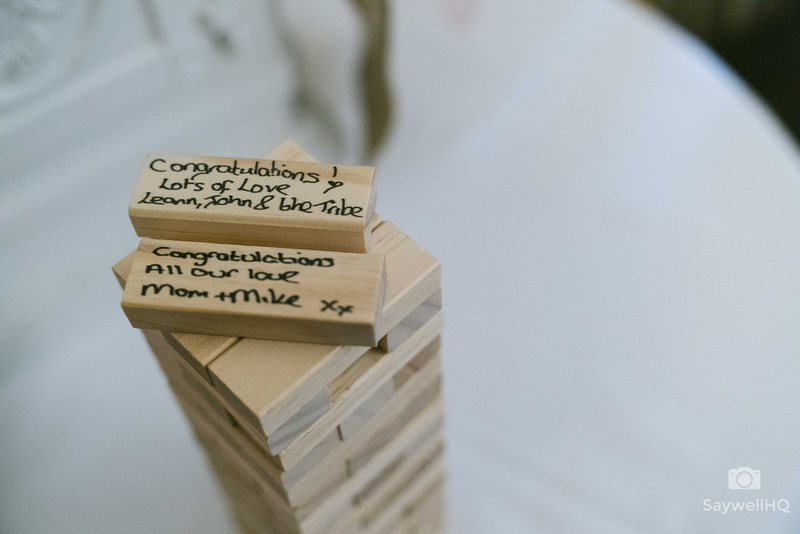 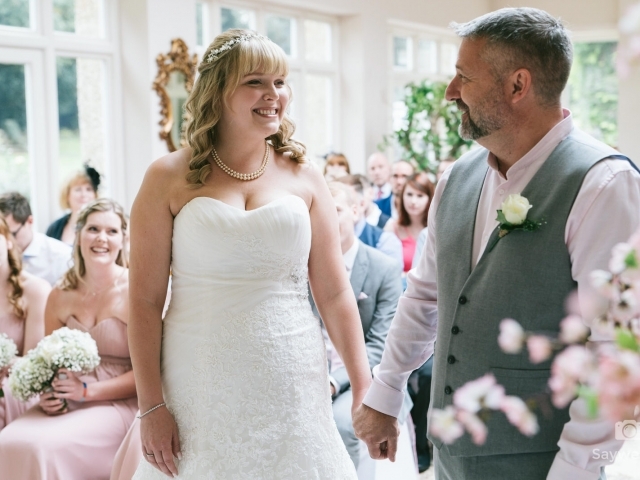 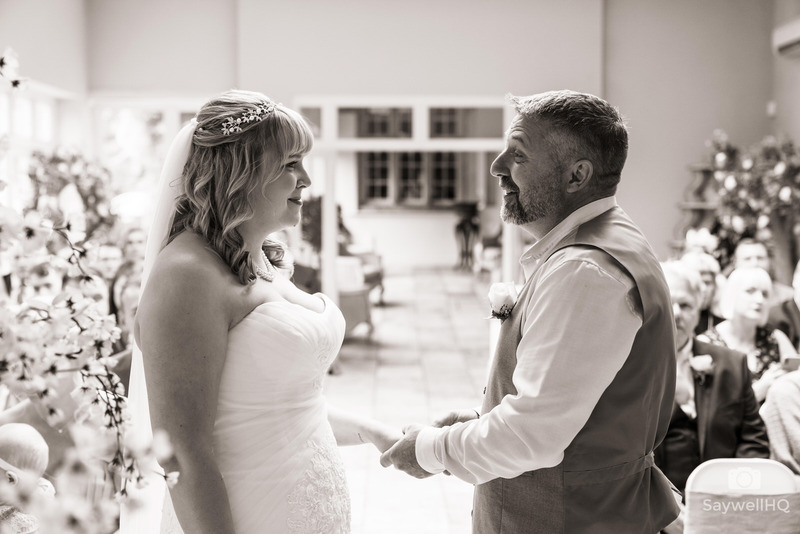 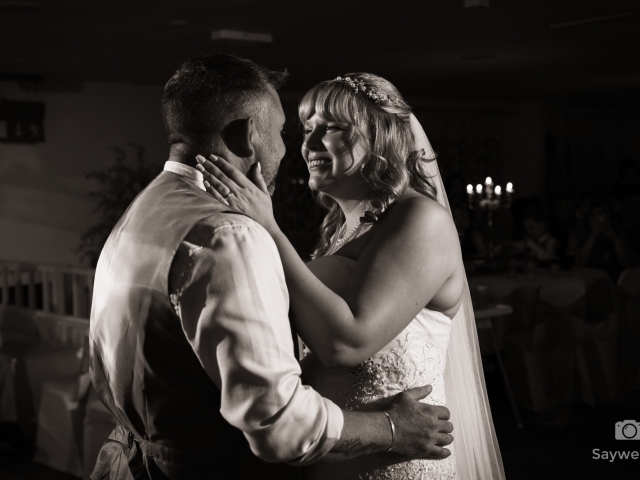 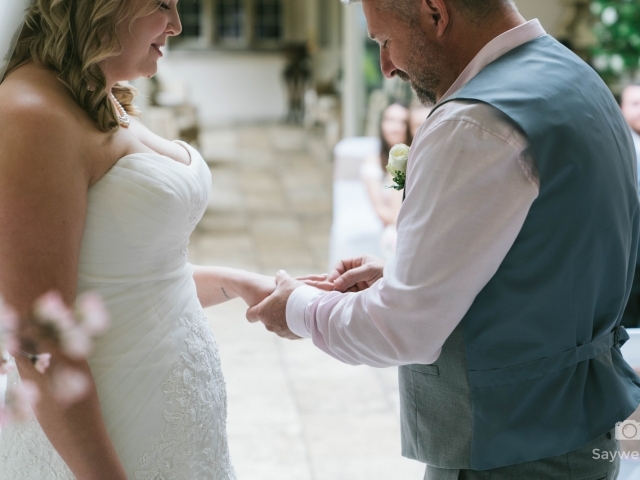 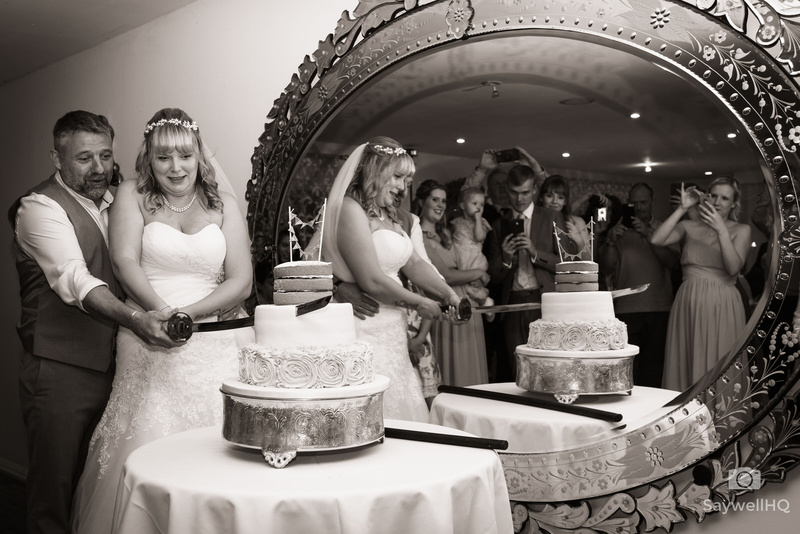 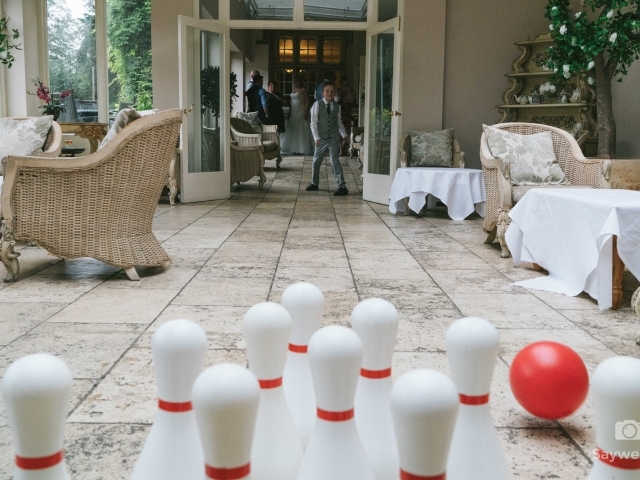 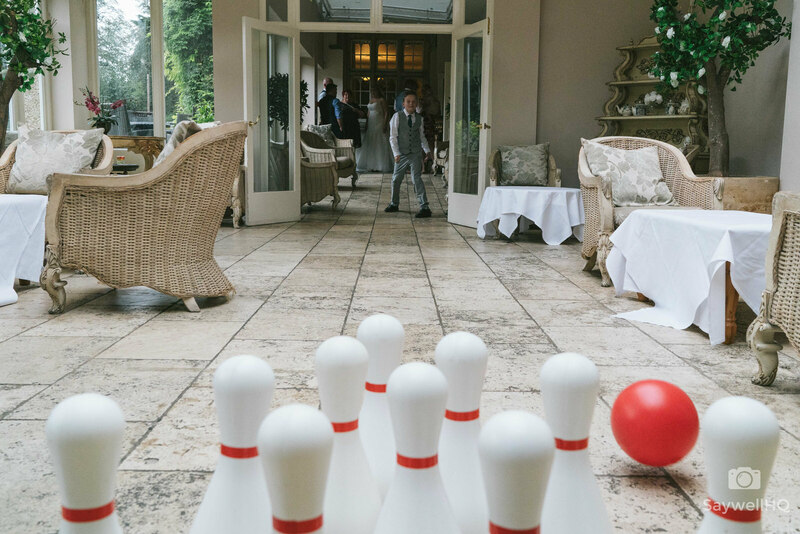 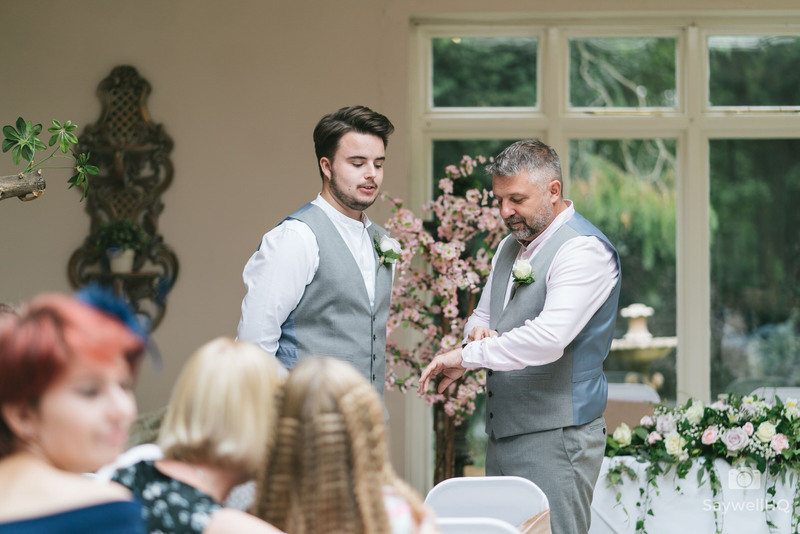 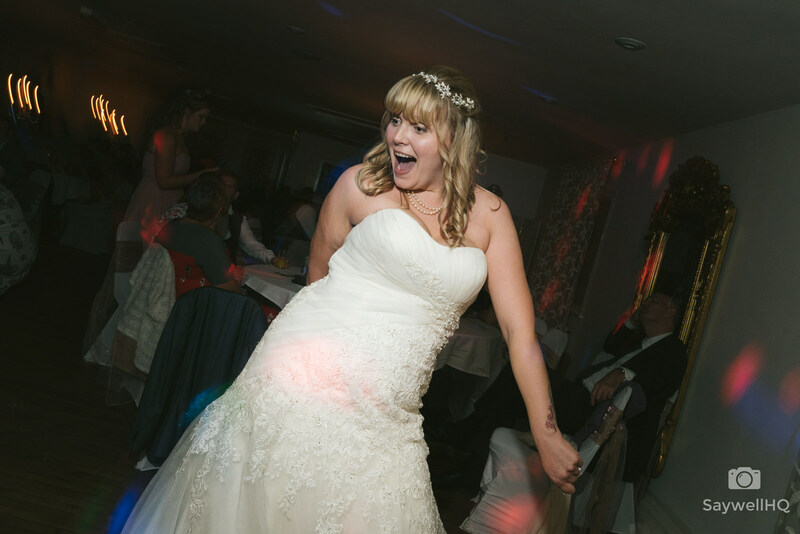 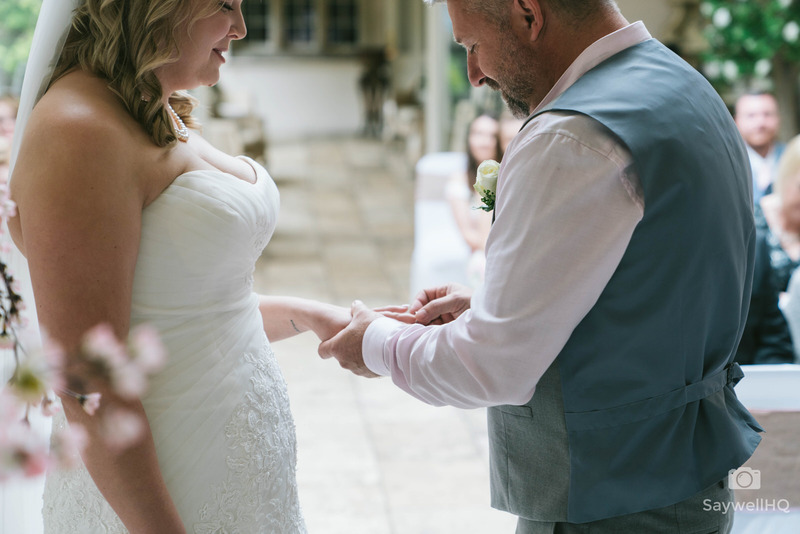 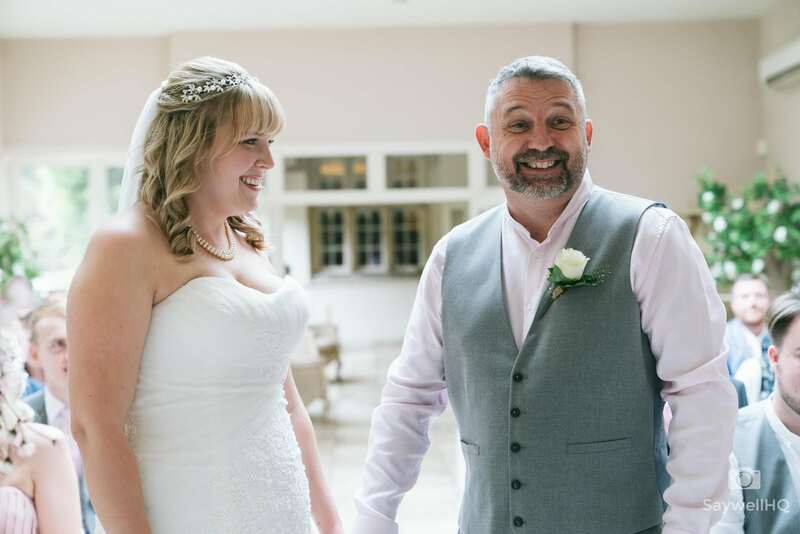 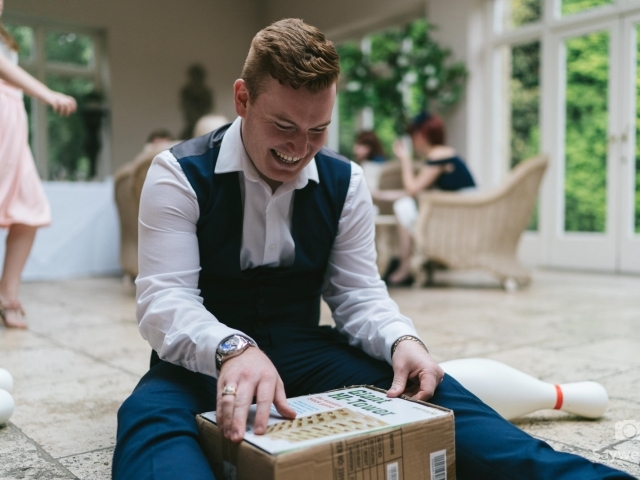 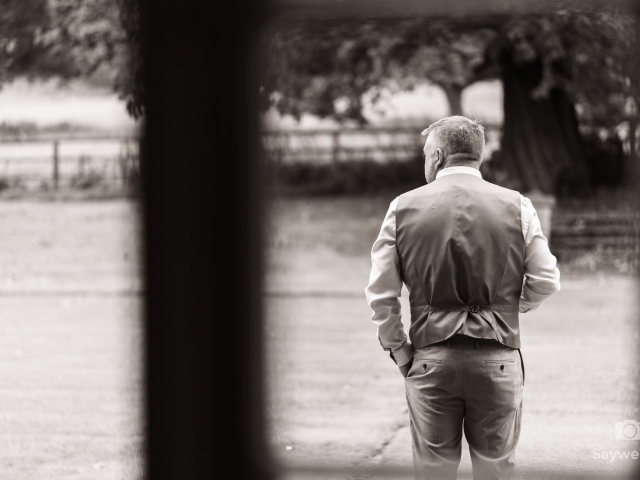 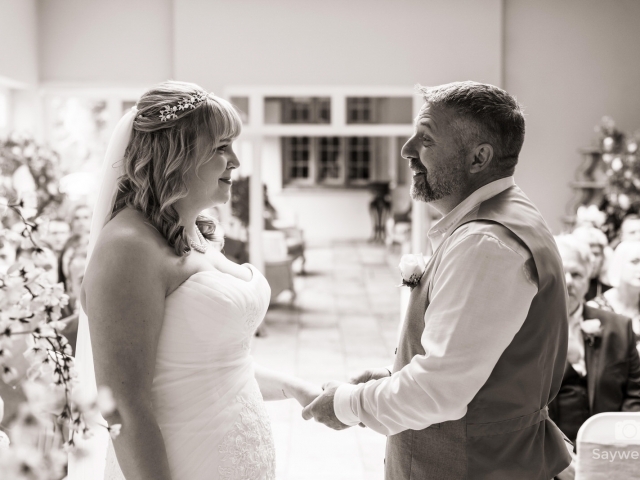 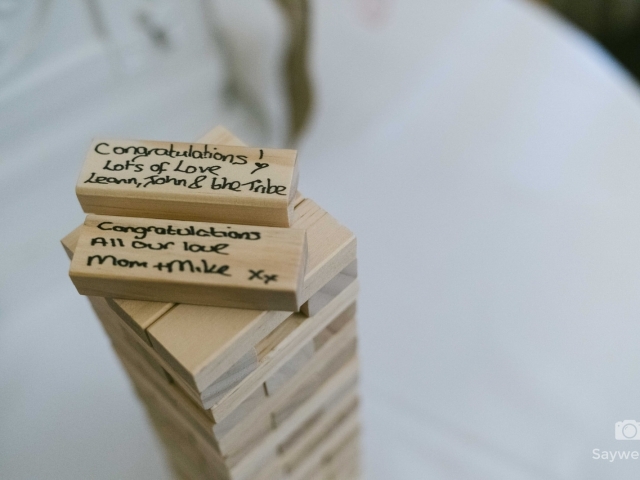 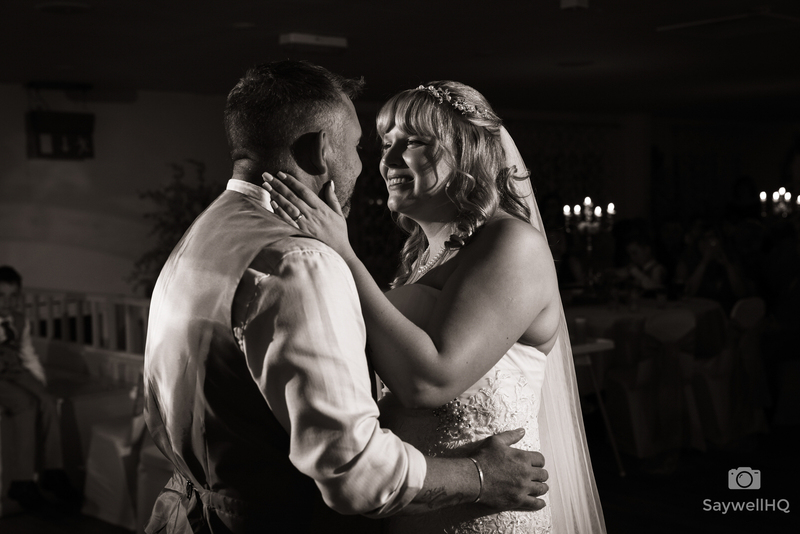 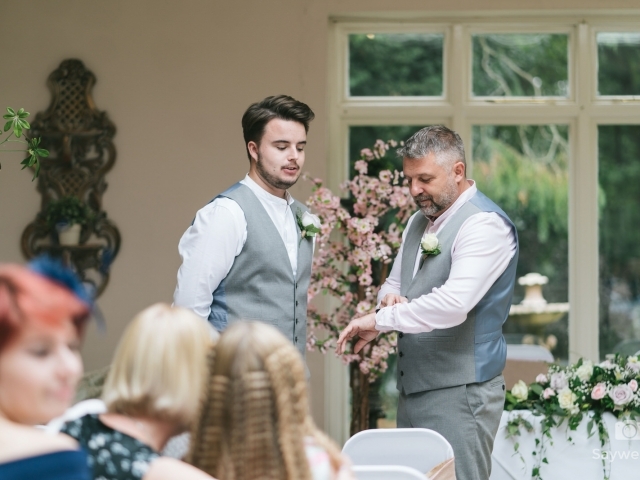 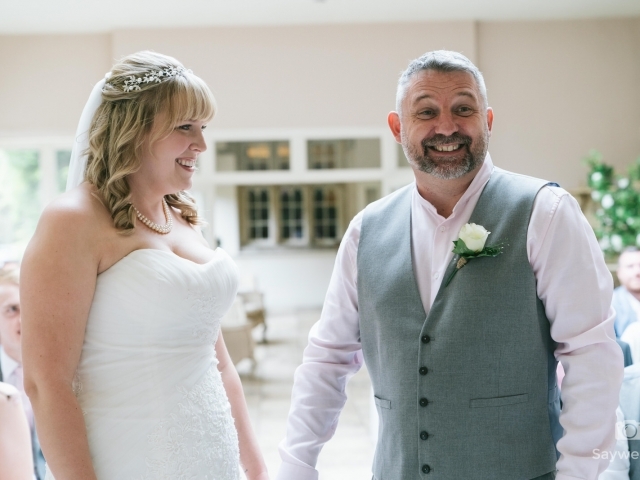 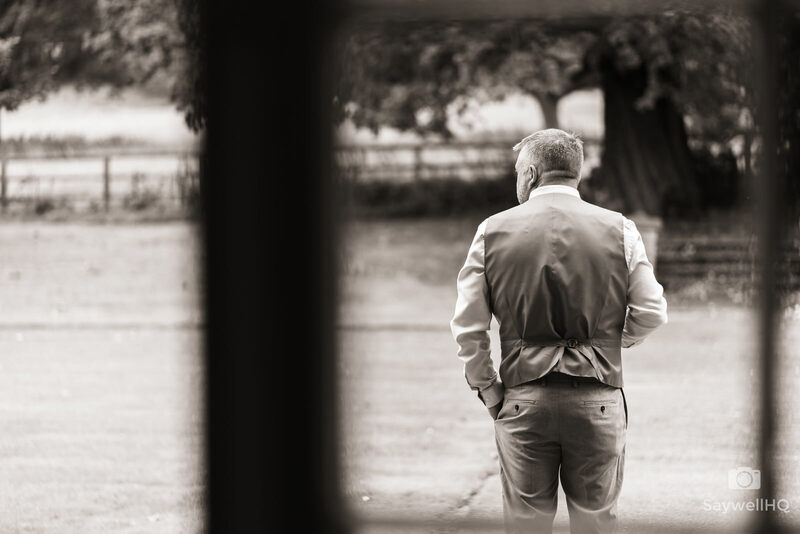 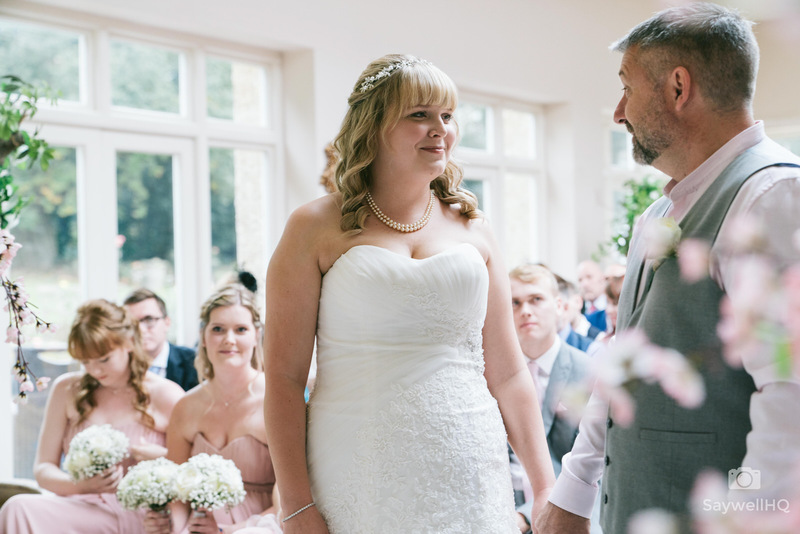 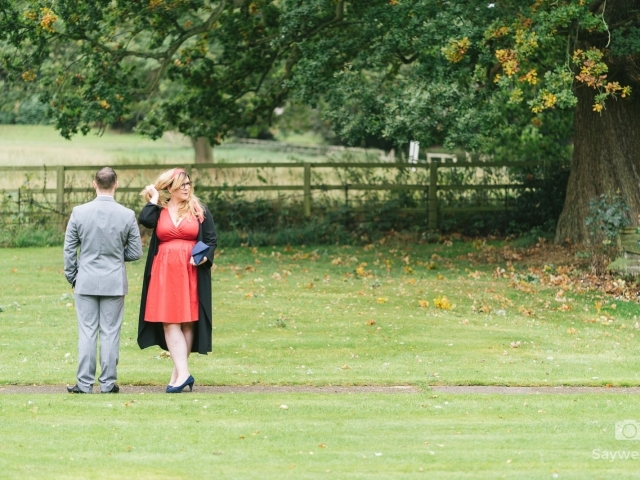 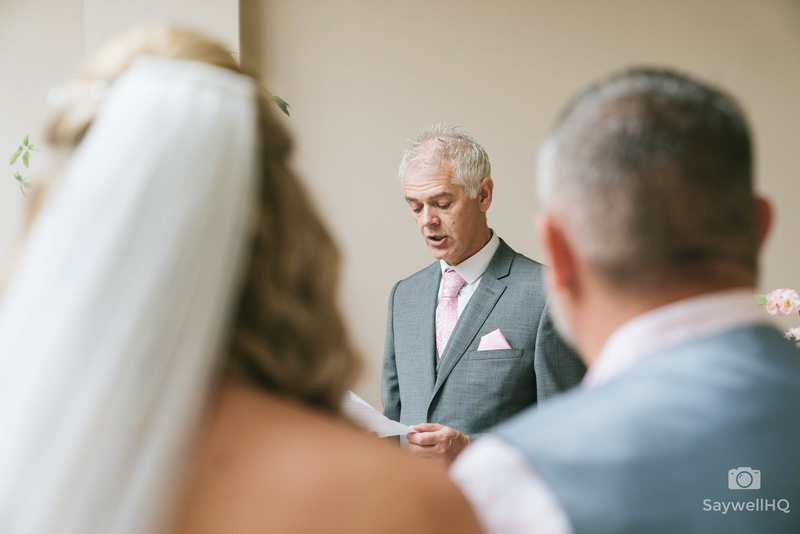 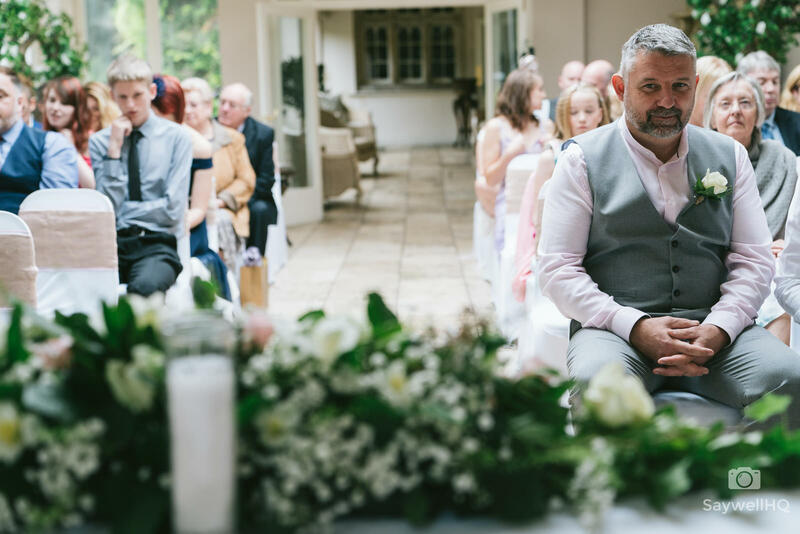 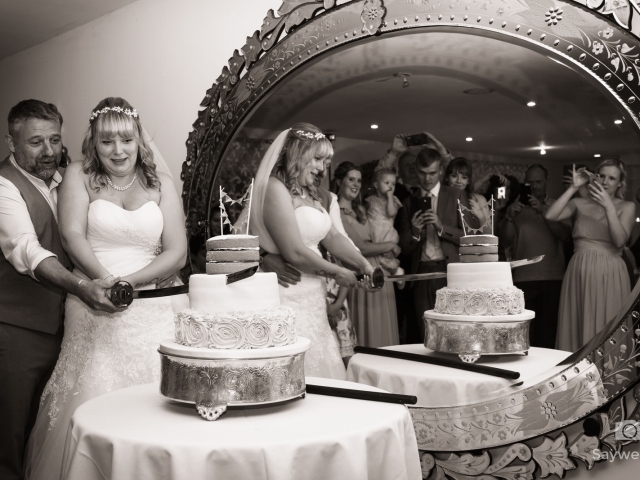 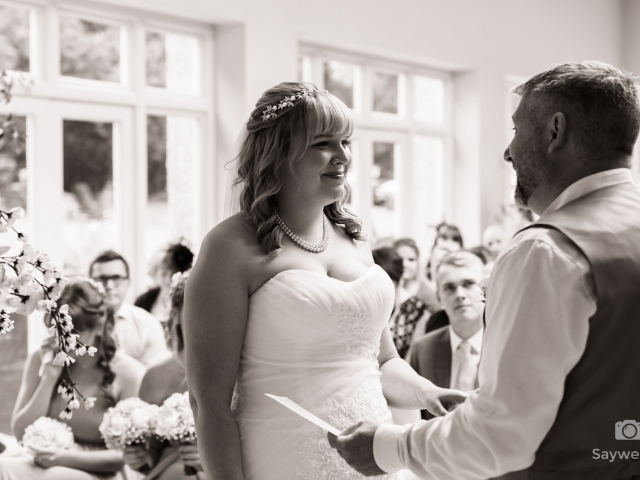 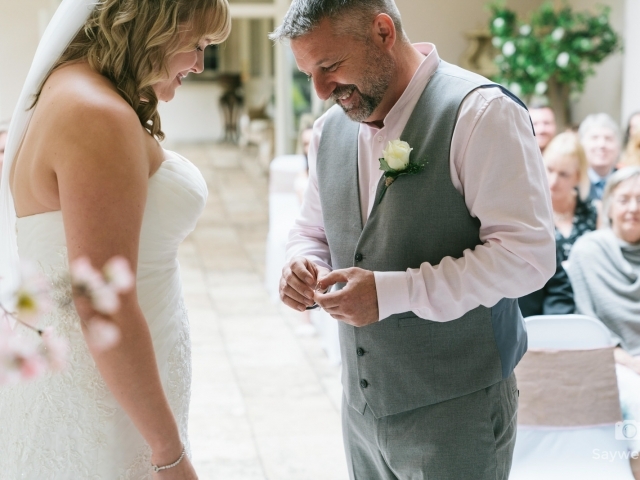 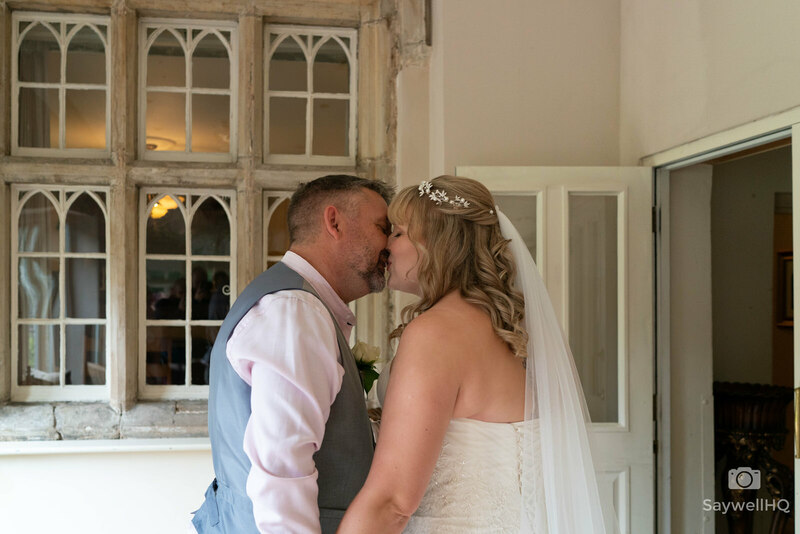 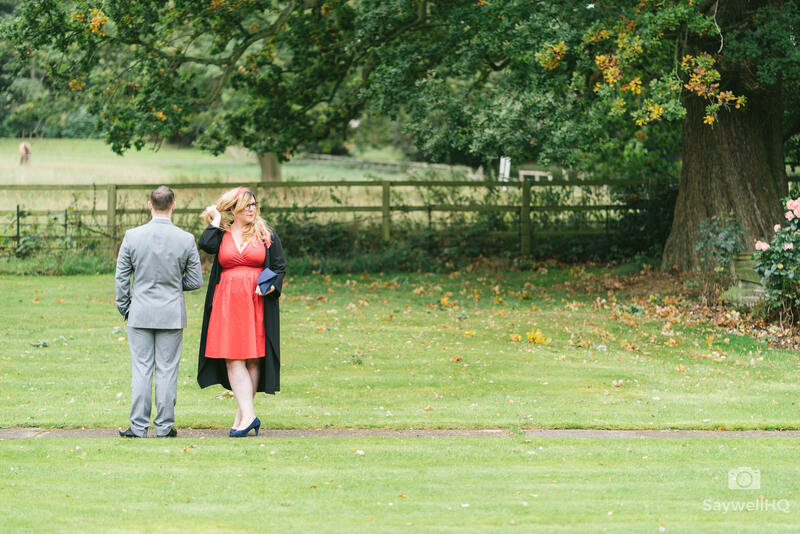 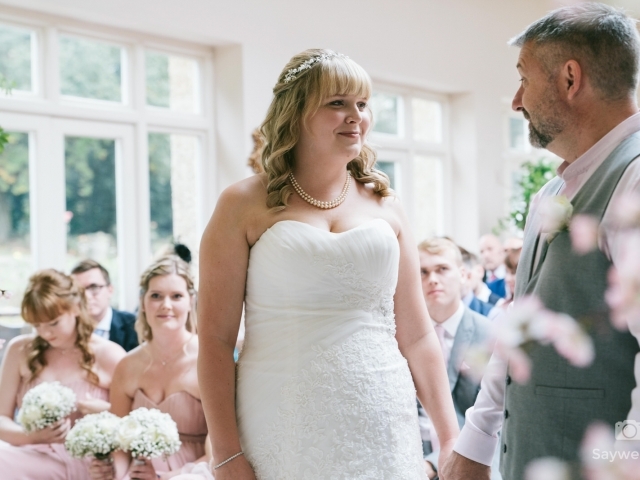 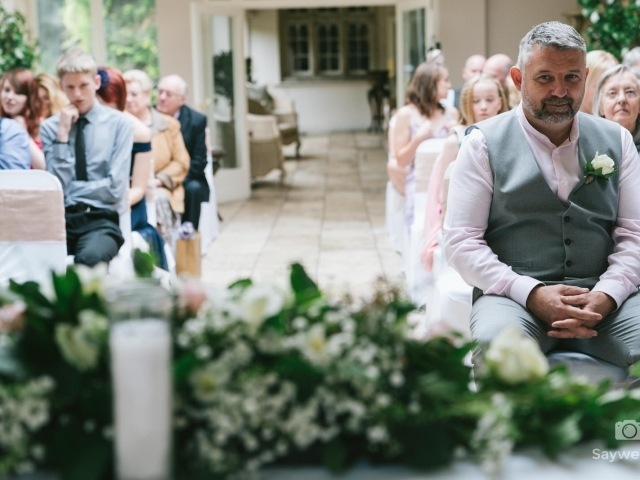 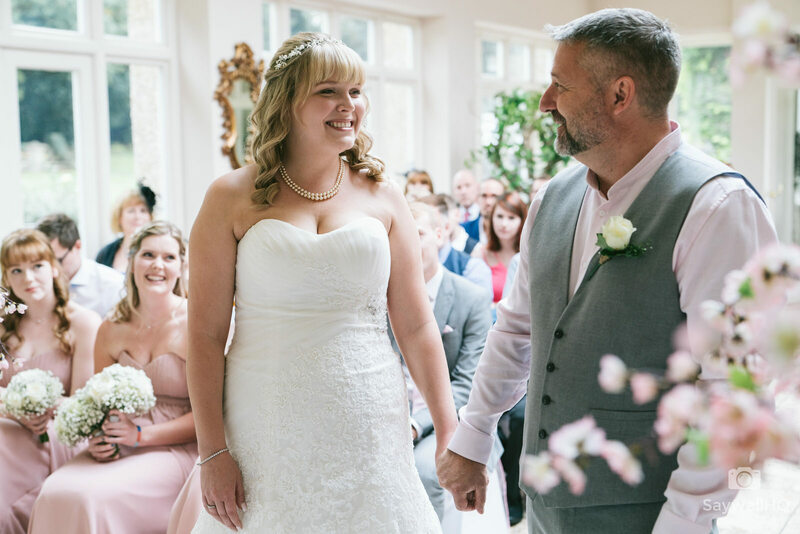 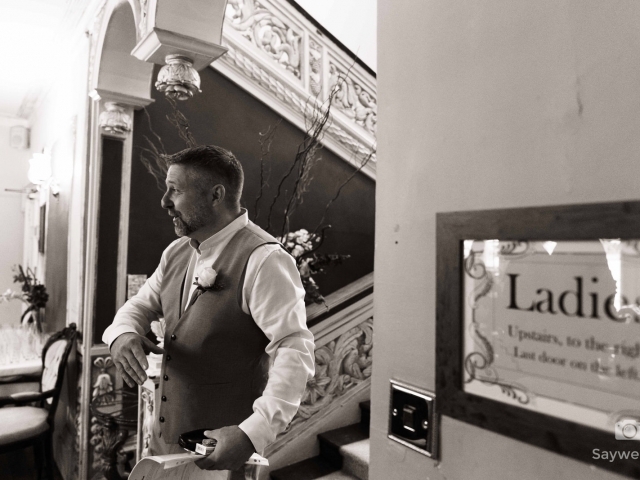 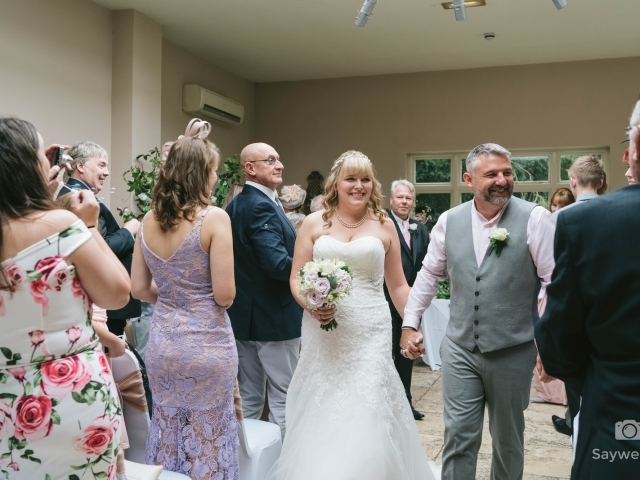 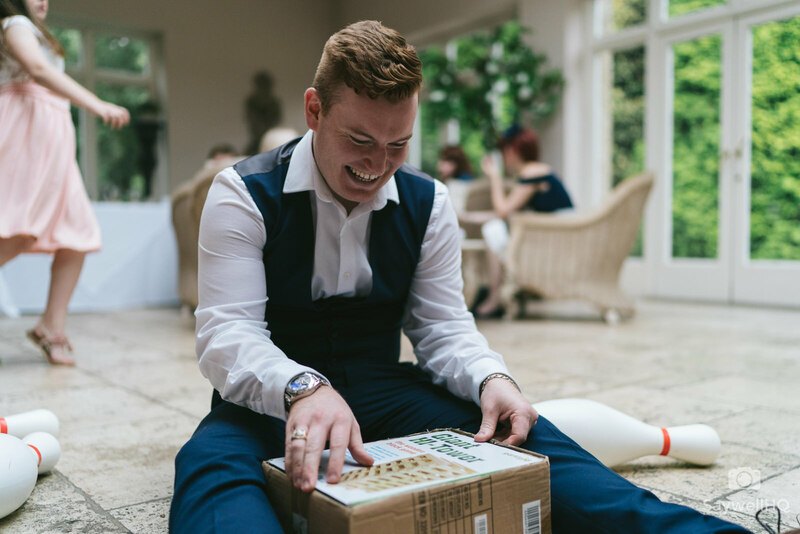 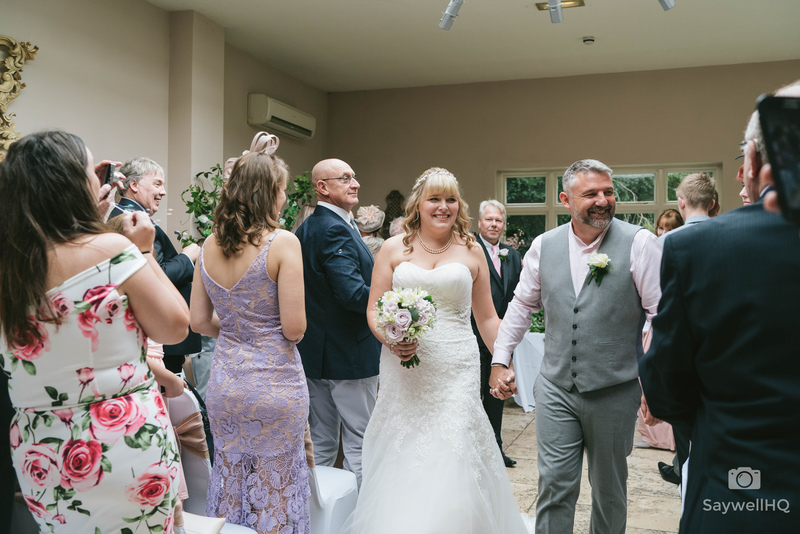 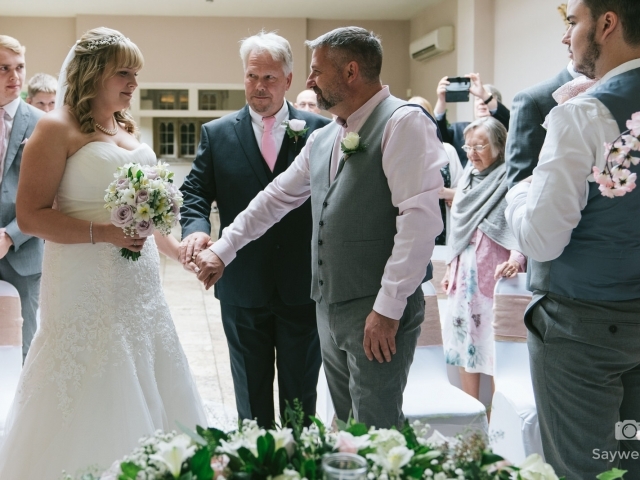 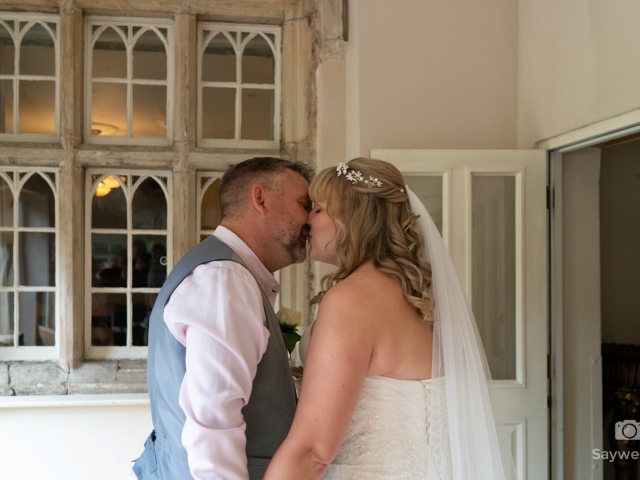 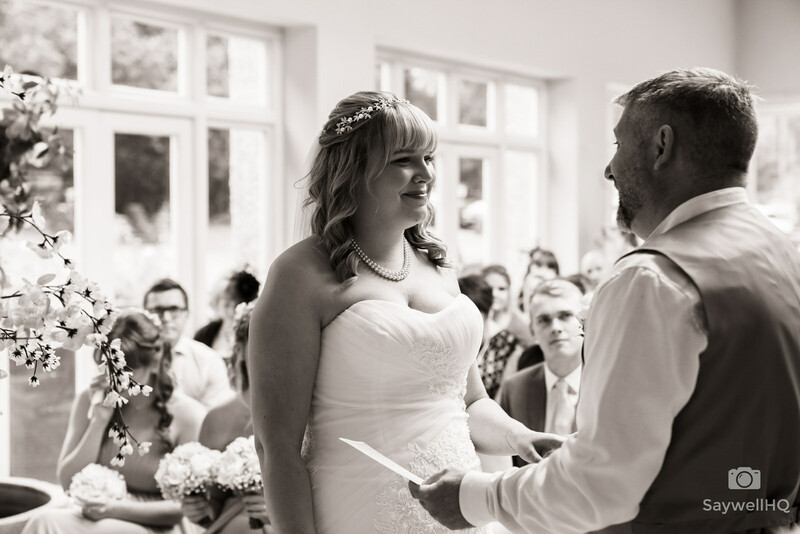 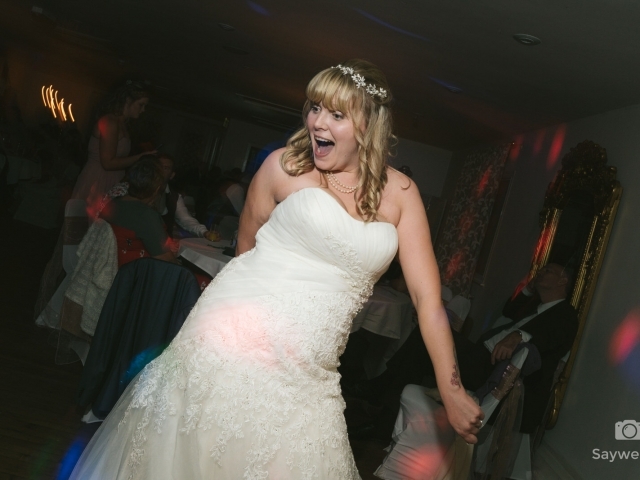 It was my first time photographing at Woodborough Hall, and it really is a beautiful setting for a wedding – especially as you get exclusive-use, so no randoms walking around! 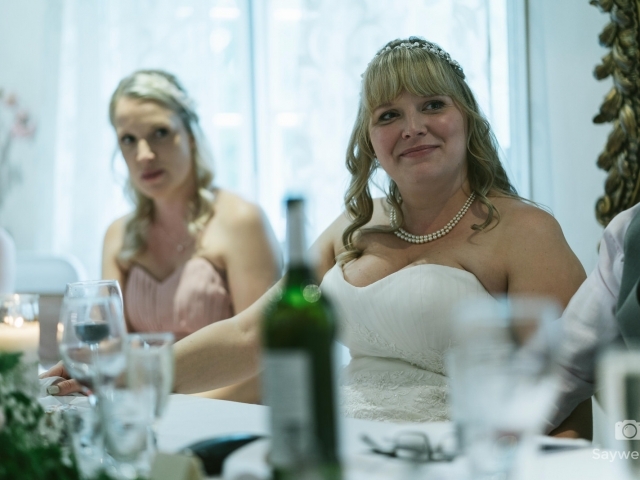 Below are a few pictures from the day – all the images were captured using 2x Sony Alpha A9s, Sony Distagon T* FE 35mm F1.4 ZA, Sony FE 85mm F1.8, Sony Planar T* FE 50mm F1.4 ZA, and the FE 24-70mm F2.8 GM.